The following links will direct you to topics discussed on this page. 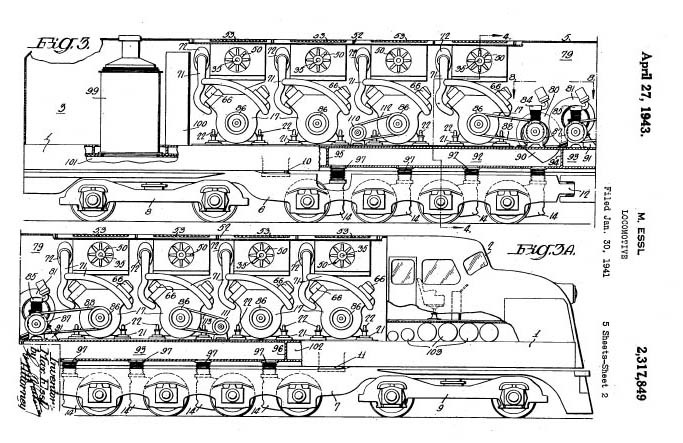 Make sure that you check out the large collection of Design Patent Drawings that we have found for most of the locomotives -- we don't think that you'll see them anywhere else on the internet! 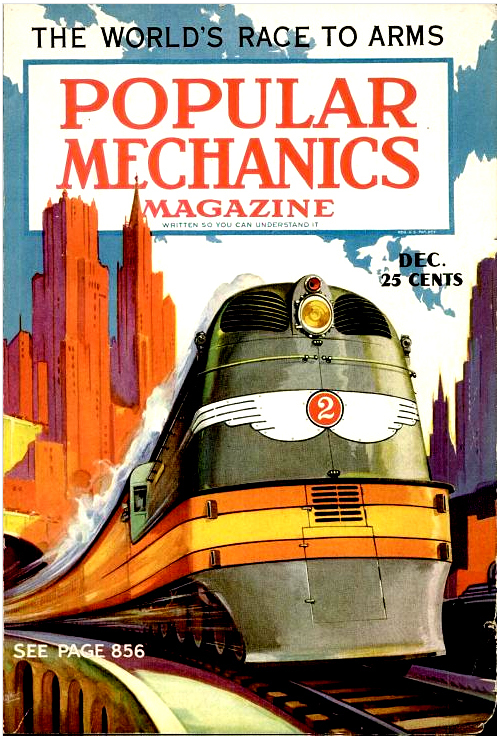 No matter what you are looking for, we suggest that you download a free copy of "Clear Track Ahead", a marvelous color insert to the December, 1939 issue of Popular Mechanics. This lovely article has fantastic color pictures of all the streamlined trains that we have come to know and love. 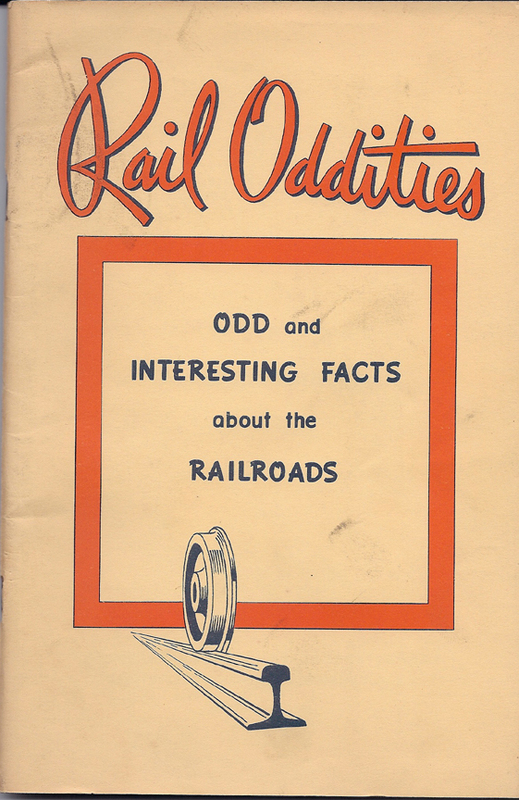 In addition to railroad stuff, we have a Calendar of Swing Dancing in DC, a Directory of Vintage Clothing Stores and a Guide to 1940s Collectibles. Thanks for tuning in! Feel free to Contact Me if you have questions or want to share photographs and railroad stories with the rest of the readers. 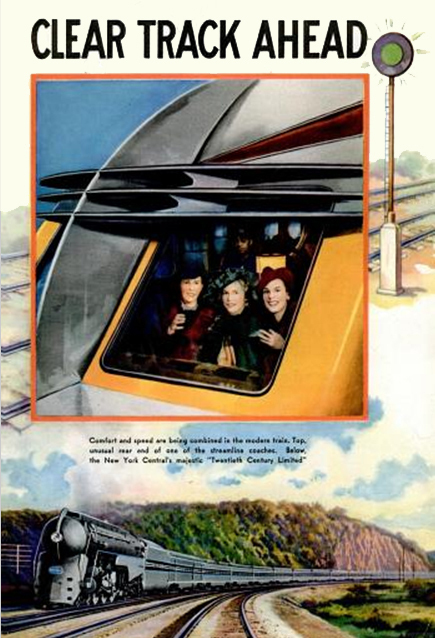 This page is devoted to the magic and romance of the fabulous Streamlined Trains of the 1930s. 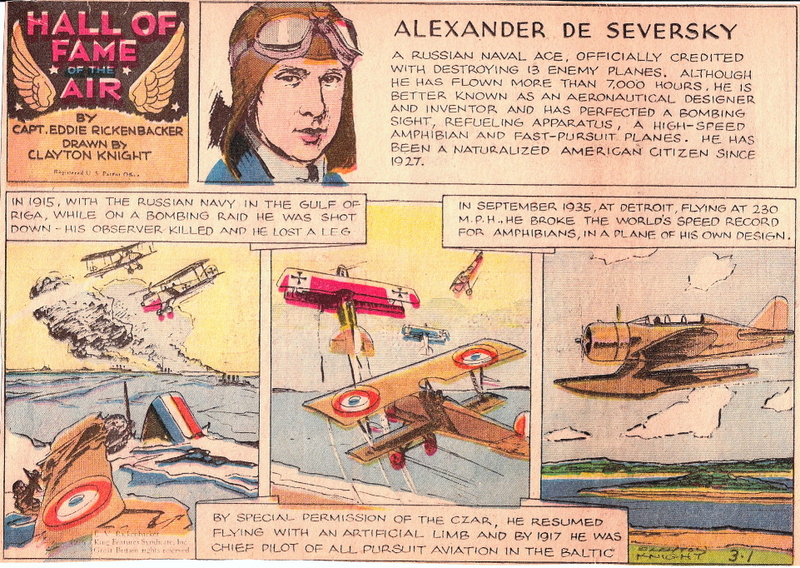 During the 1920s, the advent of aviation and the graceful shapes of airplanes spread into every aspect of life. A whole new industry devoted to enhancing the exterior appearances of machines grew up. 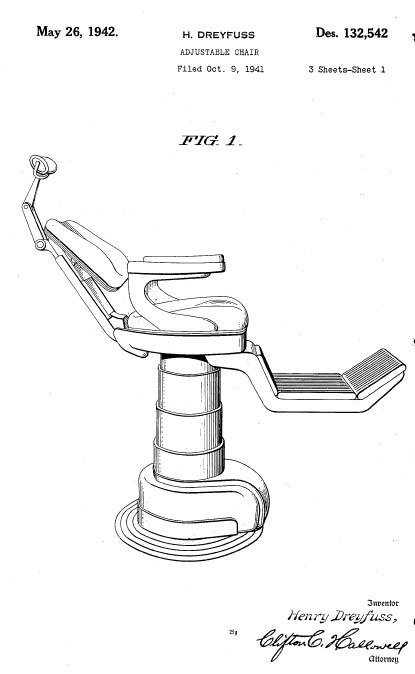 It was called Industrial Design and its practioners were called "Beauty Engineers." 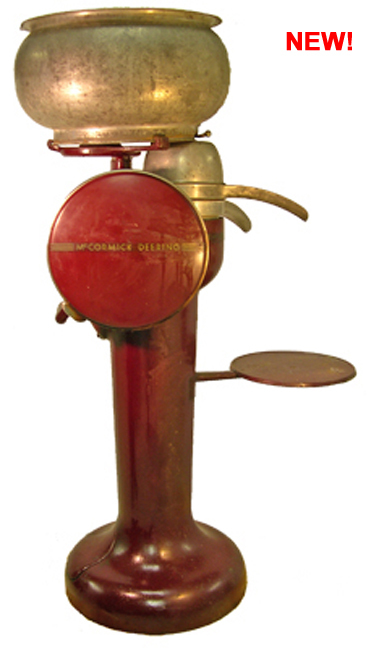 Fast or slow, all kinds of things were streamlined, even objects that remained stationary such as toasters, ice crushers, mimeograph machines, pencil shrpeners, cream separators, and the like -- up to and including buildings! 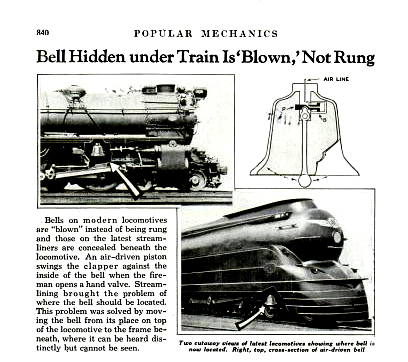 Popular Mechanics ran two articles that are of general interest. 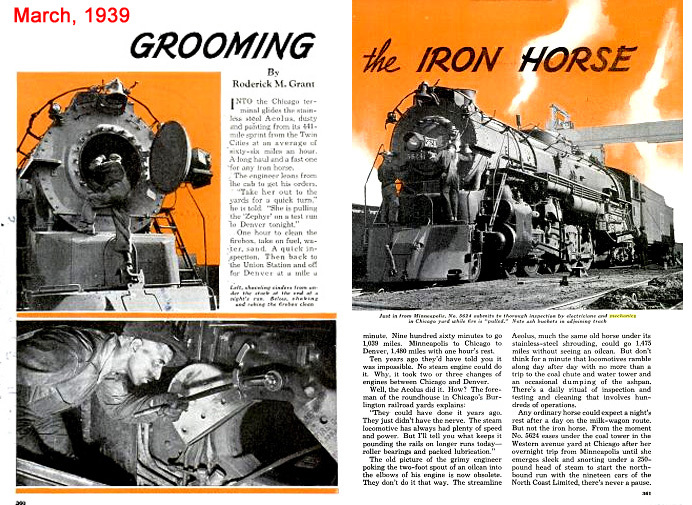 "The Romance of the Locomotive" (October, 1938) traces the history of steam propulsion while "Grooming the Iron Horse" (March, 1939) gives considerable insight into the problems associated with maintaining steam locomotives. 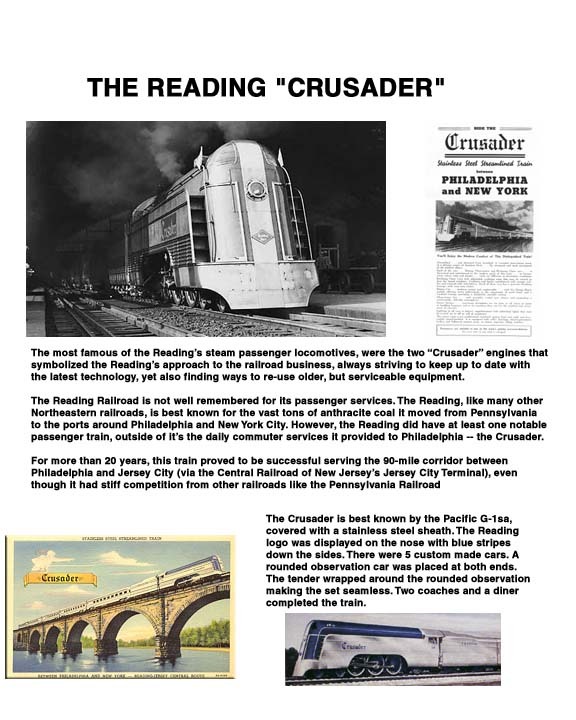 Click here to download "The Romance of the Locomotive"
Click here to download "Grooming the Iron Horse"
We begin this page with the Pullman Railplane, the Burlington Zephyr and The Union Pacific M-10000, the diesel powered trains that started the competition. 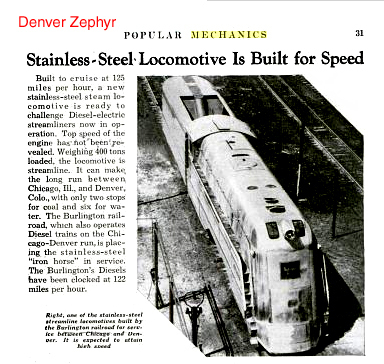 The Zephyr was cheap, fast, and never failed to dazzle crowds wherever it went. It was even the star of a movie. The M-10000 was the inspiration for science fiction writers the world over. 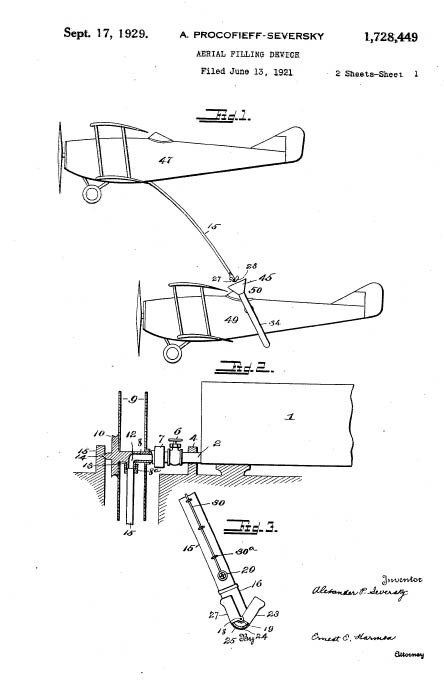 We'll next move to the experiments in shrouding in which aerodynamic covers were placed over an existing steam engine. The early ones (the Hiawatha look like an inverted bathtub has been placed over the engine. 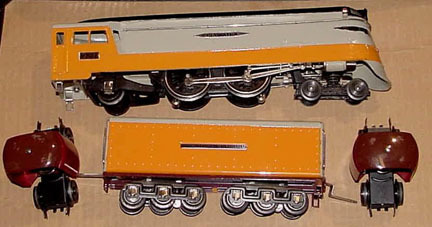 Later versions (The 20th Century Limited and the C&O #490 are exampes of modified shrouding, both applied to the workhorse Hudson locomotive. 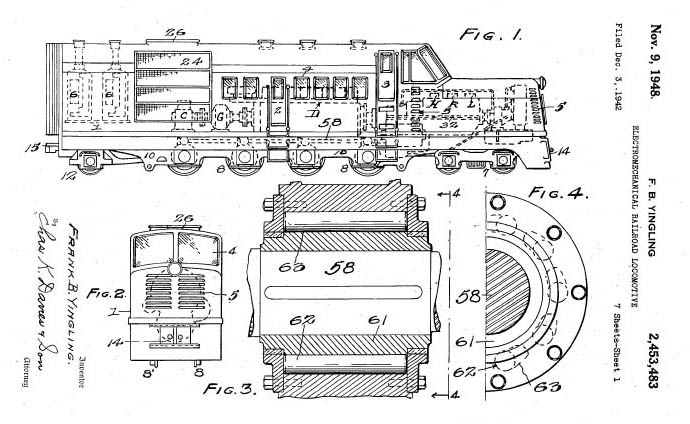 As time progressed, strealined locomotives were designed from the ground up, including the Pennsylvania Railroads S-1, GG-1, and T-1 as well as the C&O's M-1. (The GG-1 is an electric locomotive that served for more than 40 years -- the others were beautiful but dismal failures). 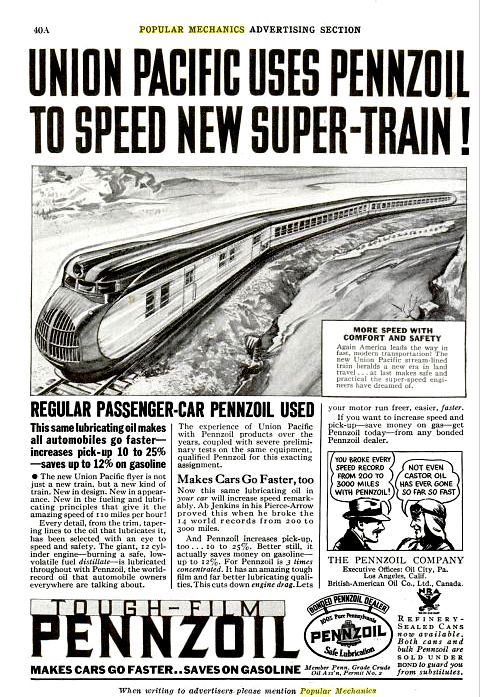 Diesel powered trains like The Super Chief became the norm until the end of the passenger train era. Don't look for any of this outside museums -- today's AMTRAK trains are just transportation, not travel. 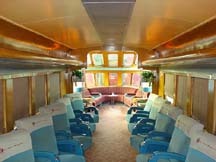 This Website shows all the streamlined trains of the 1930s and gives more details. 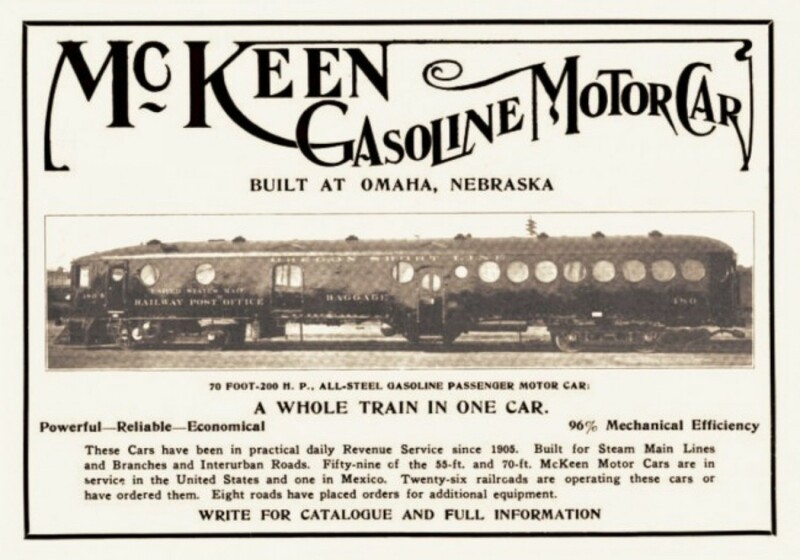 At the turn of the Century, the McKeen Motor Car Company of Omaha, Nebraska built self-powered railcars for use on routes with low density of trafic. They were advertised as "A Whole Train in One Car". 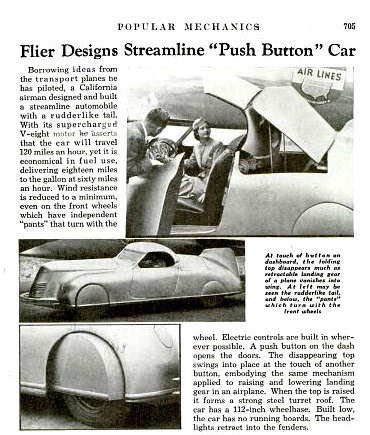 These cars have some aerodynamic features, but were constructed of heavy metal as opposed to the aluminum cladding of the true streamliners. These cars have some aerodynamic features, but were constructed of heavy metal as opposed to the aluminum cladding of the true streamliners. 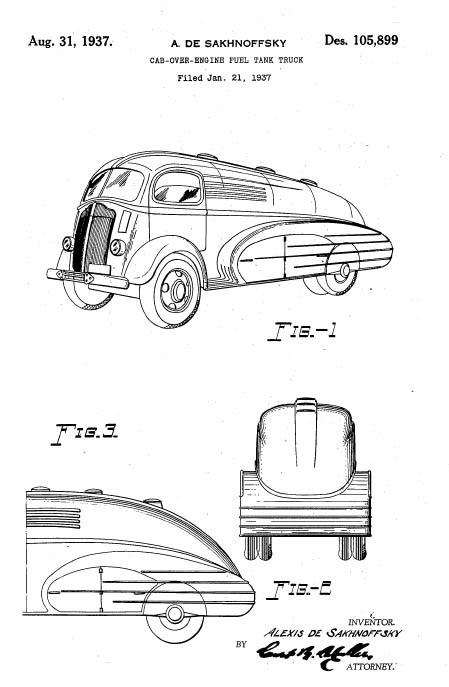 While later trains took their inspiration from airplanes, these cars were influenced by the Upscale transportation mode of 1900 - the Ocean Liner. Recently, this type of design has become trendy in a movement called "Steampunk." The definititive McKeen Car Website is run by Madison and Woody Kirkman. You should visit it to learn a whole lot more. 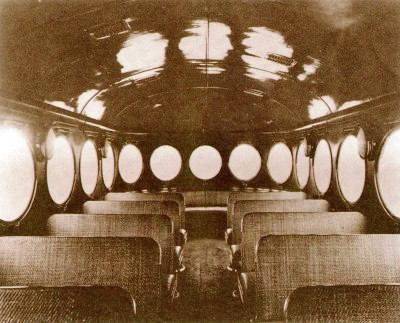 Left: Closeup of the "Windsplitter"
Right: Interior of the McKeen Car showing the nautical theme "portholes"
They were designed by William McKeen, an employee of the Union Pacific Railroad, the company was essentially an offshoot of the Union Pacific and the first cars were constructed by the UP before McKeen leased shop spacein Omaha, Nebraska. The UP had asked him to develop a way of running small passenger trains more economically, and McKeen produced a design that was ahead of its time. 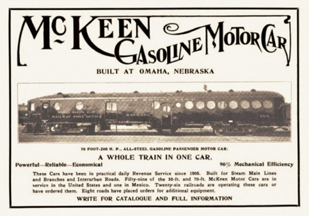 Unfortunately, internal combustion engine technology was not, and the McKeen cars never found a truly reliable powerplant. 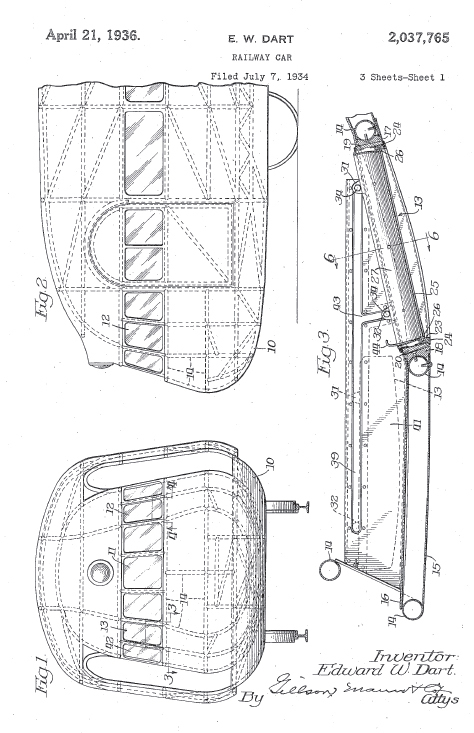 Most, although not all, McKeen cars had the distinctive "wind-splitter" pointed aerodynamic front end and rounded tail. 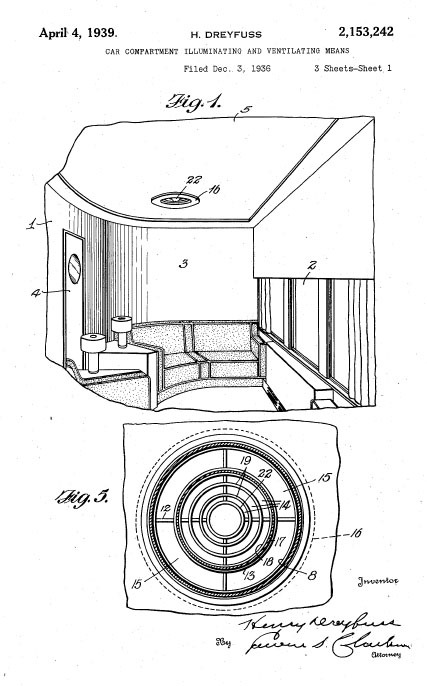 The porthole windows were also a McKeen trademark, adopted allegedly for strength . A dropped central door, as pictured, was also present on the majority of the cars. 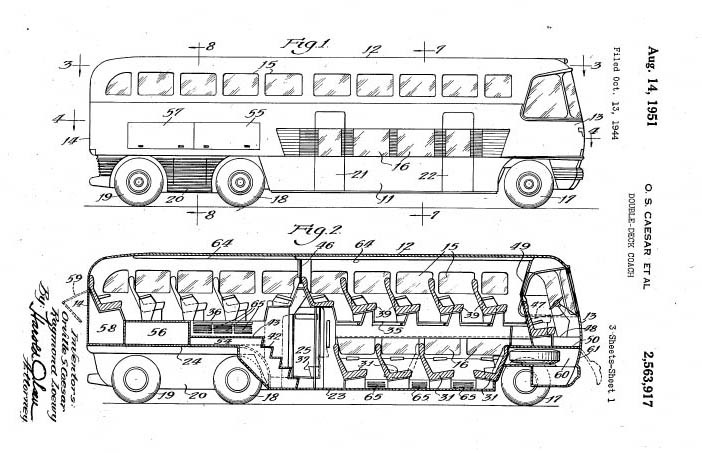 Two lengths, 55 and 70 feet, were offered; either could be fitted out with a large mail and express area ahead of the center doors, a smaller mail/express area, or the car could be all seats for a maximum capacity of 64 or 105 respectively. 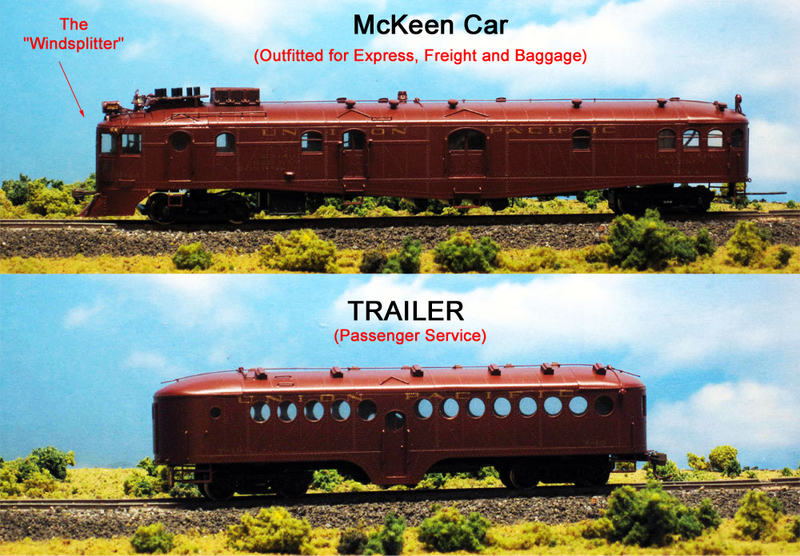 For routes in which it was advantageous to haul both freight and passengers, the McKeen Car could be equipped with a "Trailer". 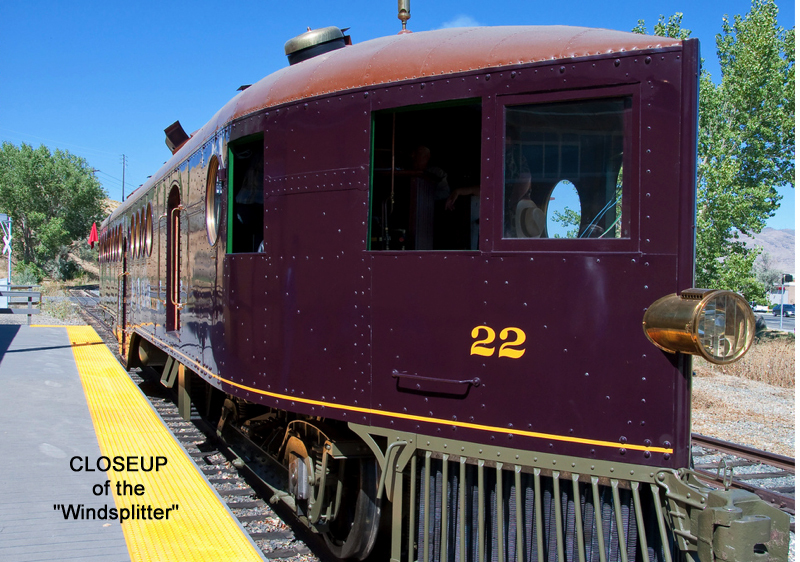 The Nevada State Railway operates one of the very last of the McKeen Cars. 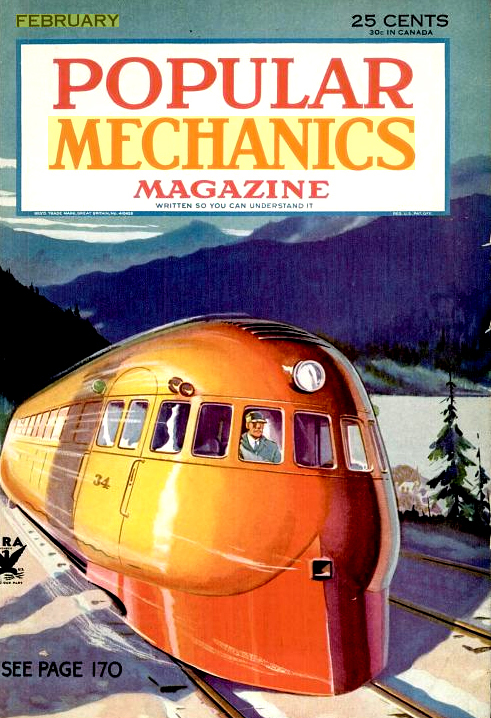 The Railplane caught the attention of the public and was soon found on magazine covers. 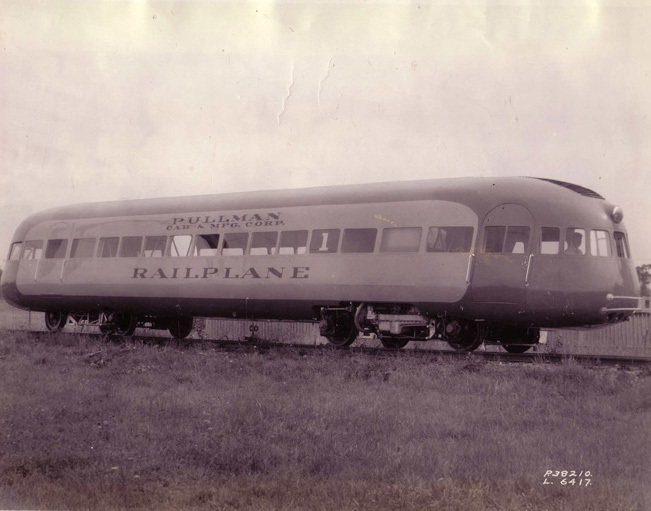 The Railplane was designed by Stout Engineering Laboratories, Inc. Dearborn, Michigan and built by Pullman-Standard in 1933. 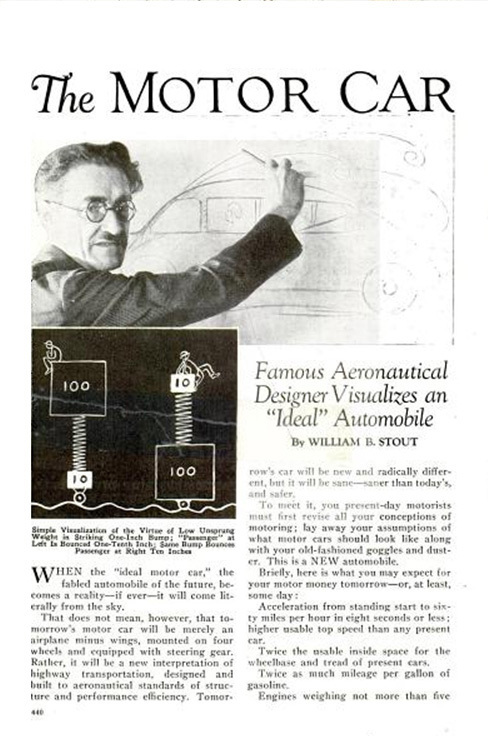 William Stout was a prolific writer and had initially made his name by applying airplane construction techniques to automobiles; (click here to download his 1932 article on this subject.) 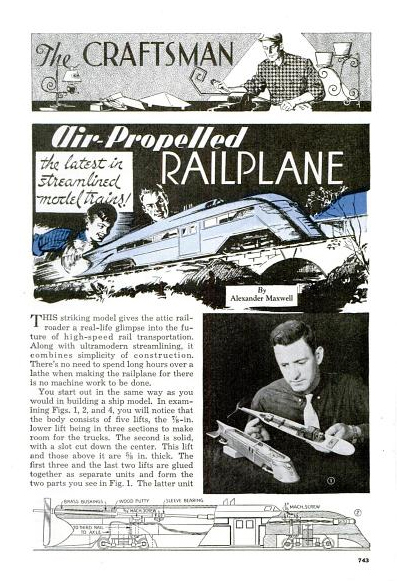 In 1934, Stout wrote an article about bringing aerodynamic principles to railroading; click here to download a free copy of this article. In addition, you may also download a copy of the directions for making a model railplane. 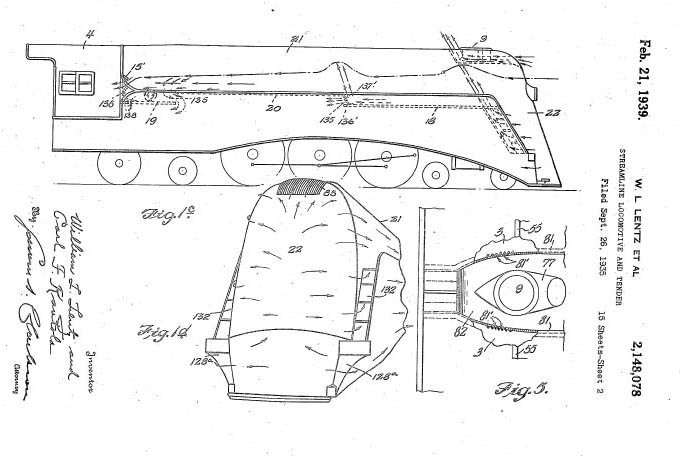 The self-propelled car had an aluminum body, 60' in length, and was powered by two Wankesha 160 h.p. 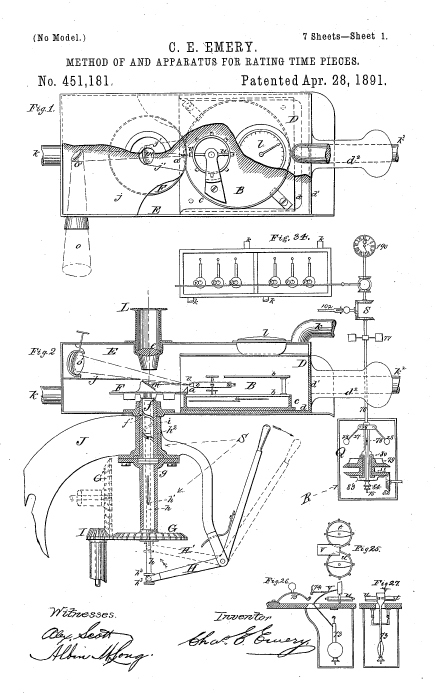 gasoline engines, reaching speeds of 90 m.p.h. 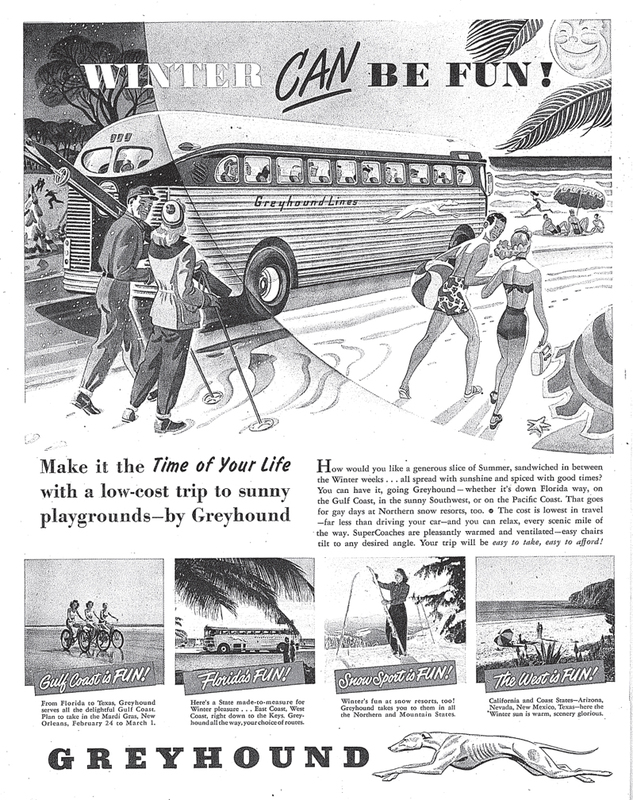 It was exhibited at the Chicago World's fair 1934 and then leased to the Gulf, Mobile & Northern in 1935 for service between Tylertown and Jackson, Mississippi. 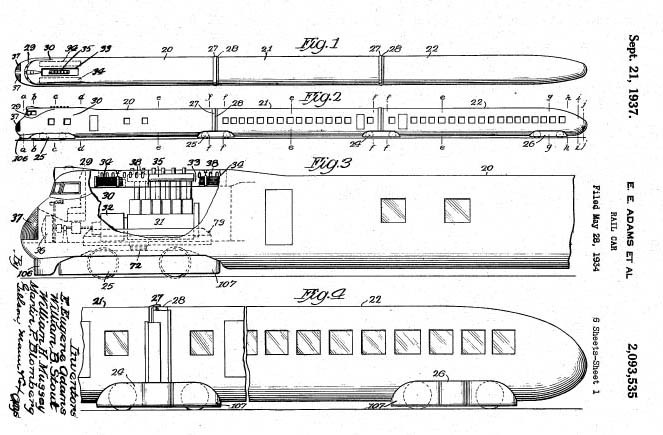 The railplane is principally known as a test vehicle although it saw some small commercial service. 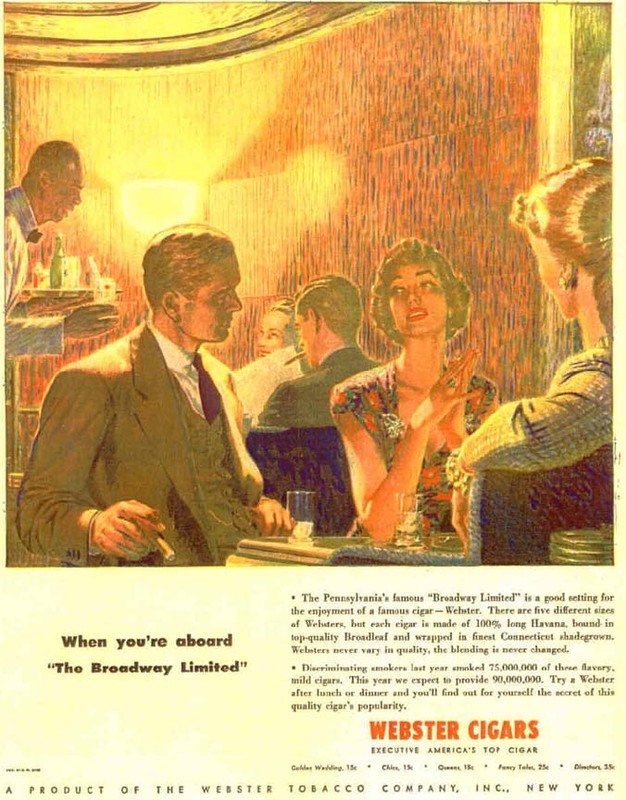 Feeling the effects of the Depression and declining business, America's railroads (in the 1930s) were looking for ways to reinvigorate passenger travel. 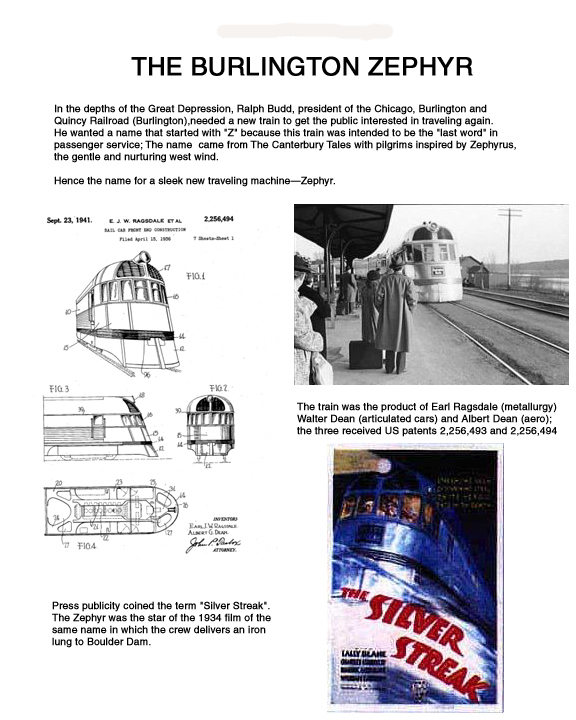 As Ralph Budd, president of the Chicago Burlington & Quincy, later explained, railroads had to continue running trains on short routes to handle mail and baggage "whether or not anyone rides the trains." 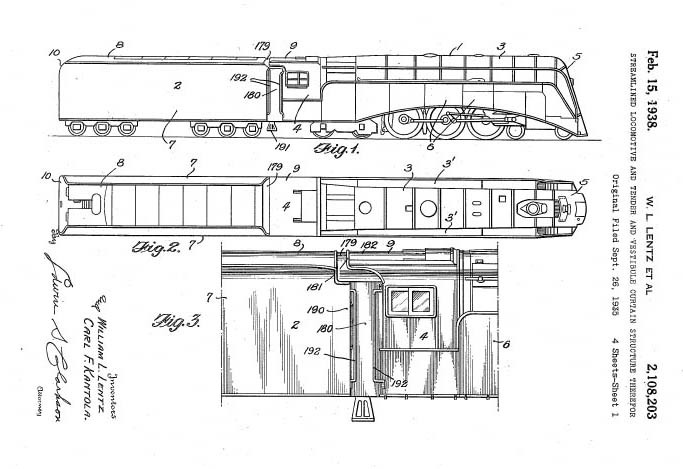 After seeing GM's powerful diesel engines, Budd concluded that what the railroads needed was a new kind of train that was fast, convenient, ultramodern and luxurious enough to fire the public imagination. 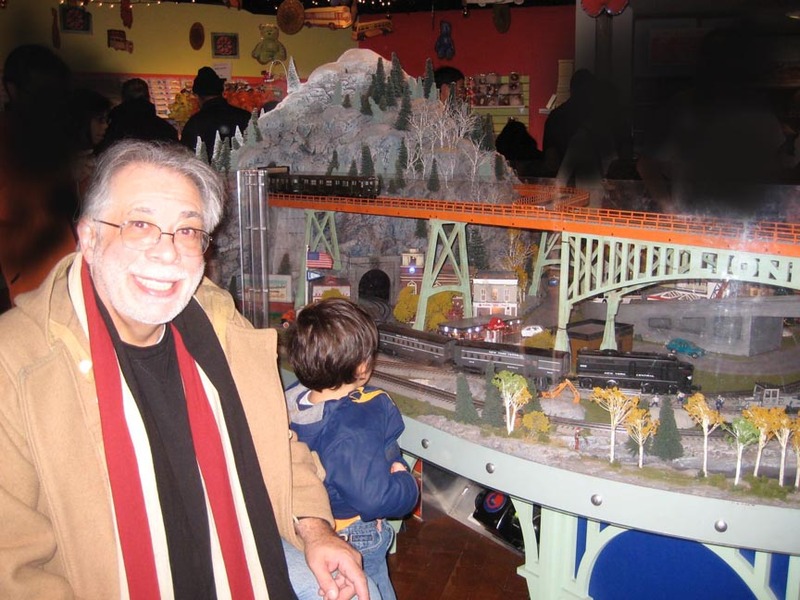 The Union Pacific Railroad also saw the two exhibits and came to similar conclusions. 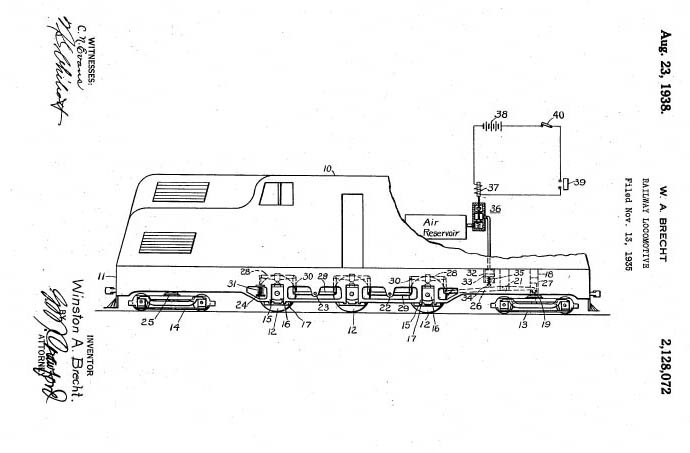 A race was on to see which of the two railroads would be the first to develop an ultramodern diesel passenger train. 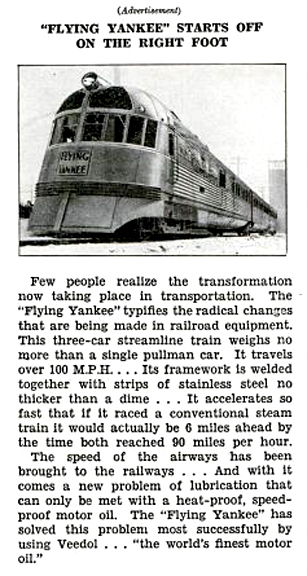 With the engine technology of the day, the new trains had to be lightweight. 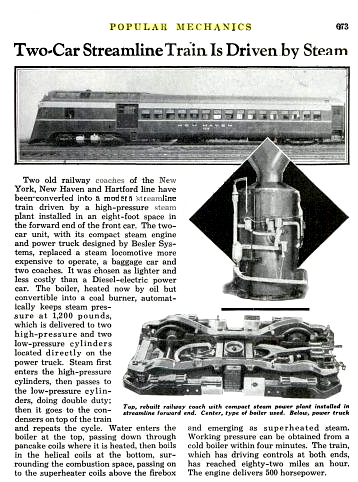 To get the most out of the available power, the trains were streamlined. 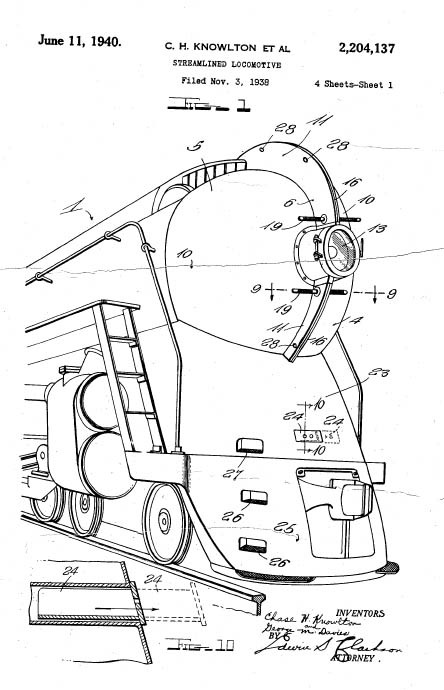 The Union Pacific selected the University of Michigan to find the best aerodynamic shape while CB&Q turned to M.I.T.. 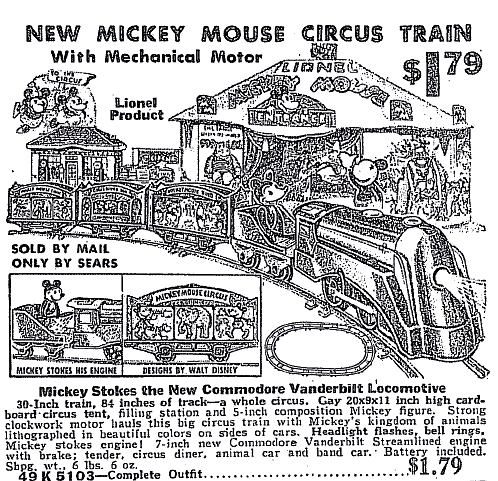 The new designs looked like nothing else that had ridden the rails. 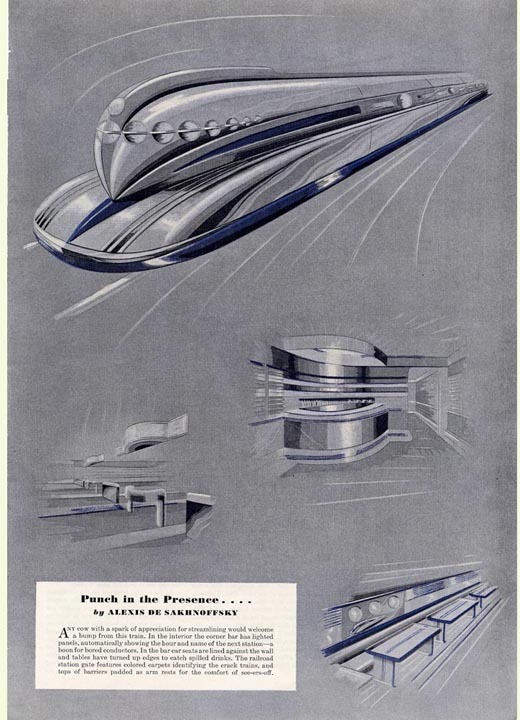 They looked more like Buck Rogers's space ship than a train. People were tired of living in the Depression and they were ready for a change. These radical new designs, no doubt, capitalized on it. Both companies turned to General Motors to supply the power plant, but, they selected different car builders. Union Pacific used to the established Pullman Company to build their cars. 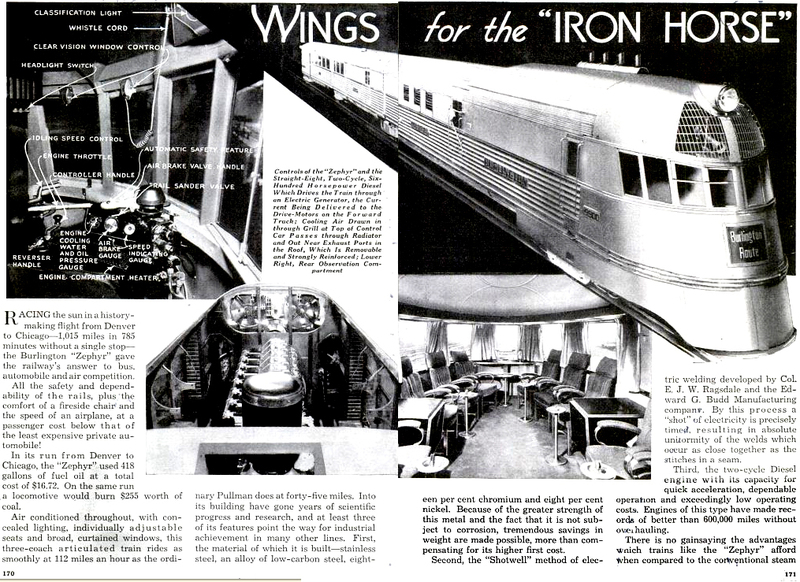 Like the Railplane, the UP train was constructed out of aluminum. In the other corner, CB&Q looked to a new comer on the railcar scene, Edward G. Budd Manufacturing Company (no relationship to Ralph Budd). 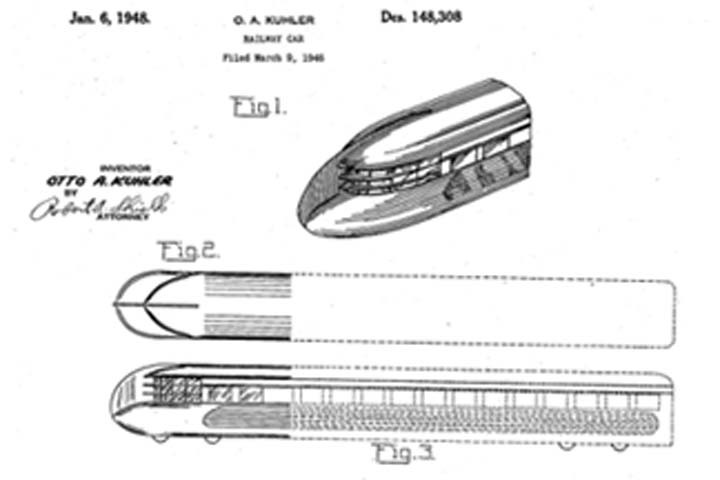 Budd had been producing auto-bodies before the Great Depression; however, with business down, they decided to diversify and construct a light weight, stainless steel railcar. They finished their first coach in 1932. 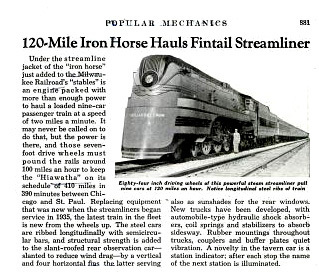 When the Zephyr rolled out, it was an immediate media hit, as shown in a 1934 article in Popular Mechanics entitled "Wings for the Iron Horse". 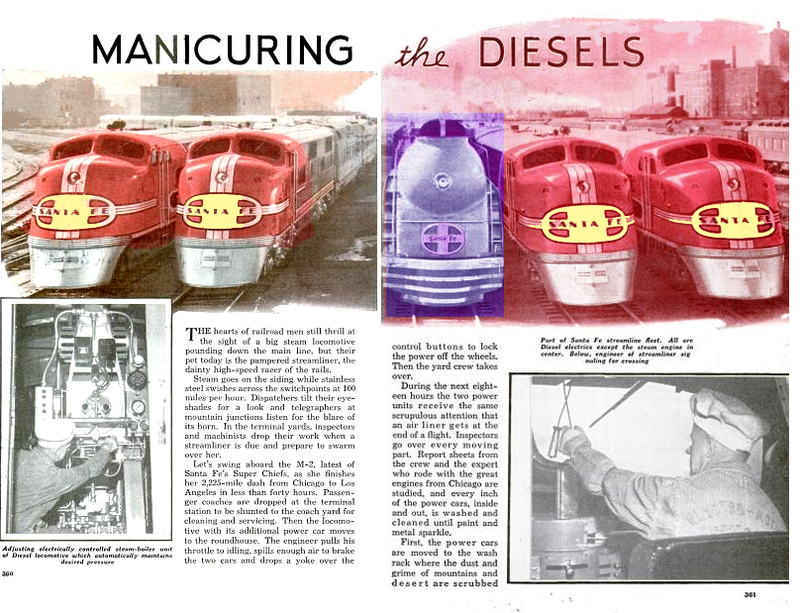 Within a few weeks, "Zephyr" and "Diesel" became synonomous, especially in advertisements. 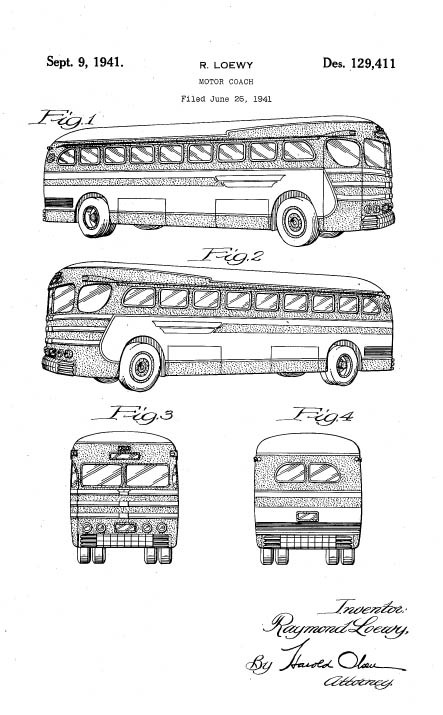 The stainless steel coach was made possible because the Budd Manufacturing Co. had developed the first successful method of welding stainless steel only a few years earlier. 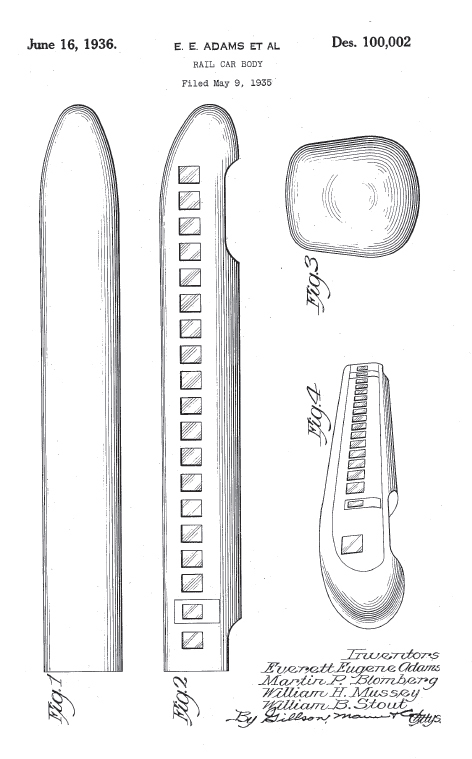 Prior to Budd's innovation, stainless steel was used only for cutlery and surgical instruments. 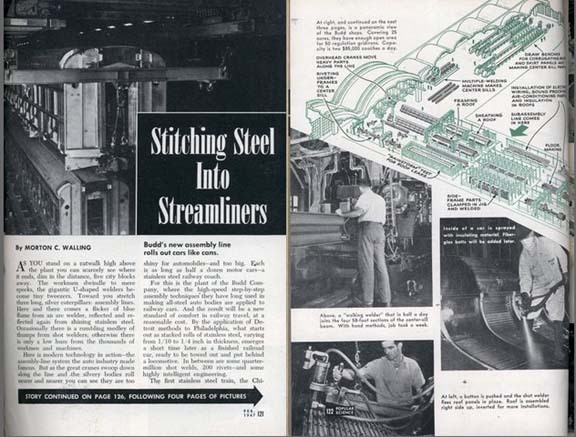 Here is an article from Popular Science that illustrates the technology for building stainless steel cars and how it had evolved from 1932 to 1947. 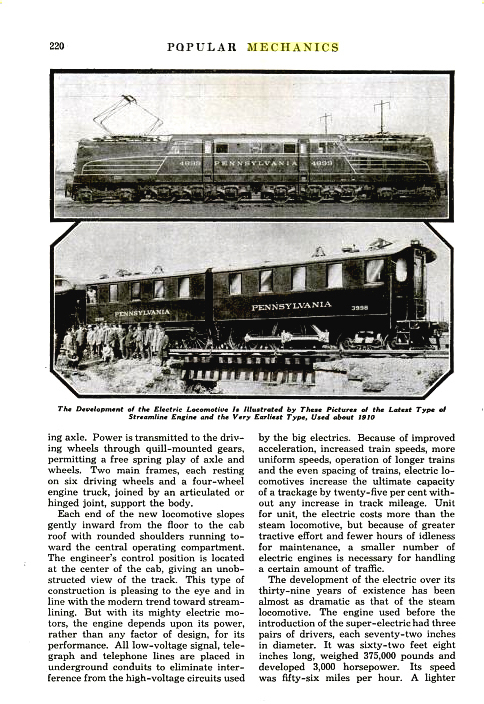 While Pullman was able to accelerate the construction of the UP train, General Motors was unable to deliver a diesel power plant on time. 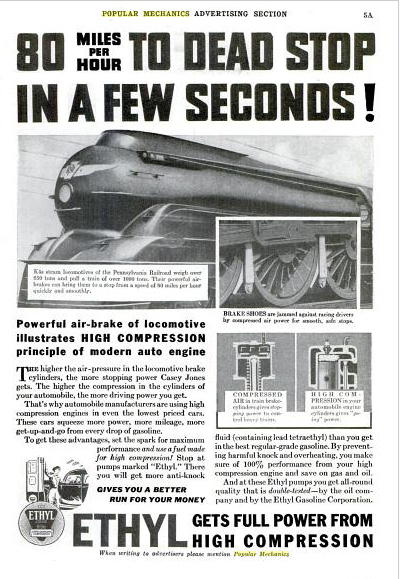 So, to win the race against the CB&Q, the Union Pacific decided to use a distillate (gasoline) engine instead. The M10000 was delivered to the UP on February 25, 1934. 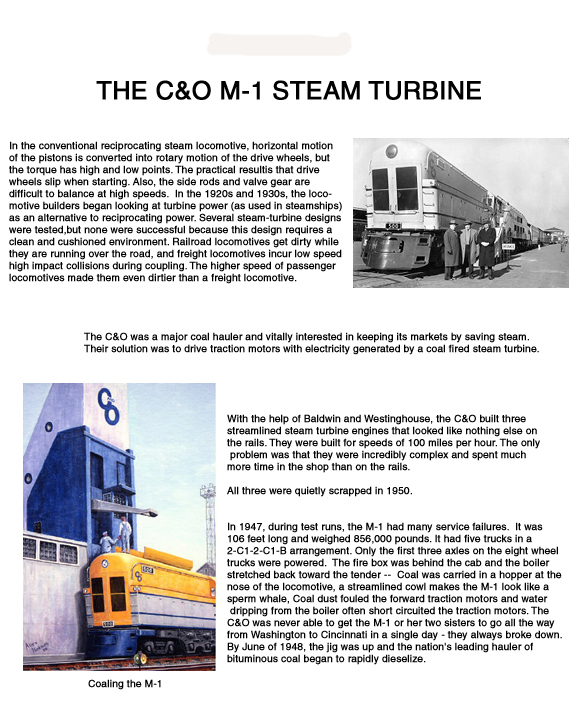 General Motors was able to complete a diesel electric power plant for CB&Q's later delivery date. 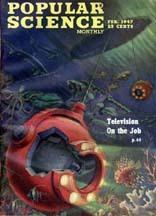 CB&Q received the Zephyr in April, 1934. Both trains were actually three car articulated motorcars, but that hardly mattered to the public. The new trains were immensely popular. 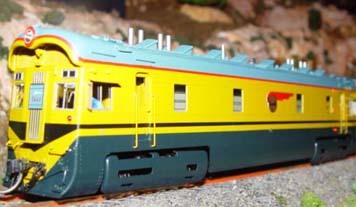 The Boston and Maine Railroad bought a trainset that was very similar to the CB&Q Zephyr called The Flying Yankee and operated it into the 1950s. The train still exists and is being restored! 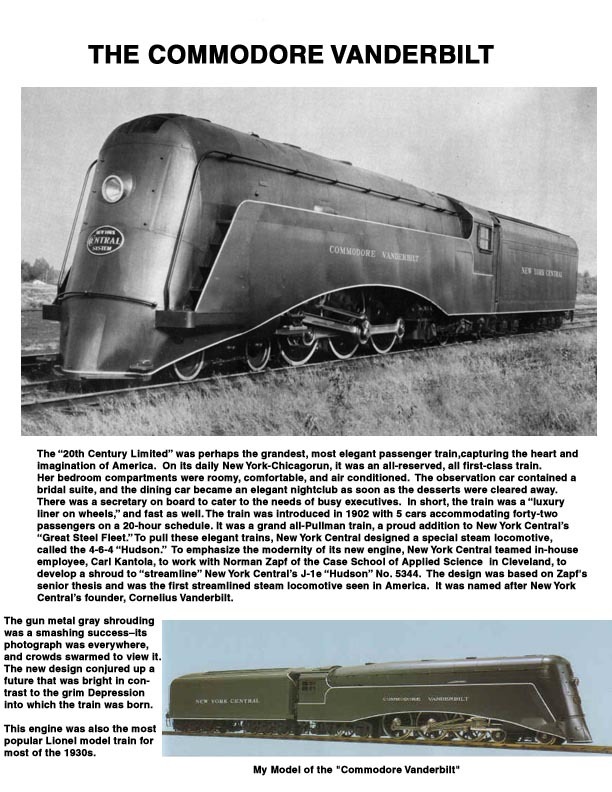 You should take a look at the Flying Yankee Website to learn more about the train and make a donation to get this beautiful streamliner back on the rails! 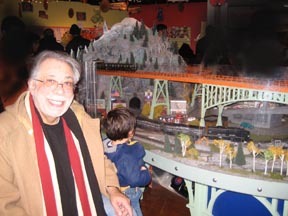 However, as little boys get older than 10, they start to notice that the toy does not have the amount of versimilitude that they would expect, especially if they could go down to the railyard and see the thing "in the flesh" as it were. 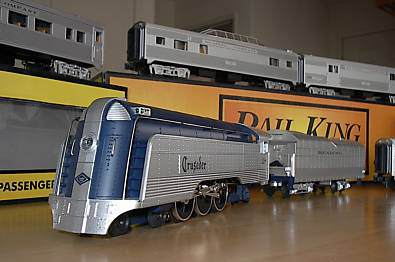 "... Lionel made two versions of the M-10000 in 1935 and 1936. 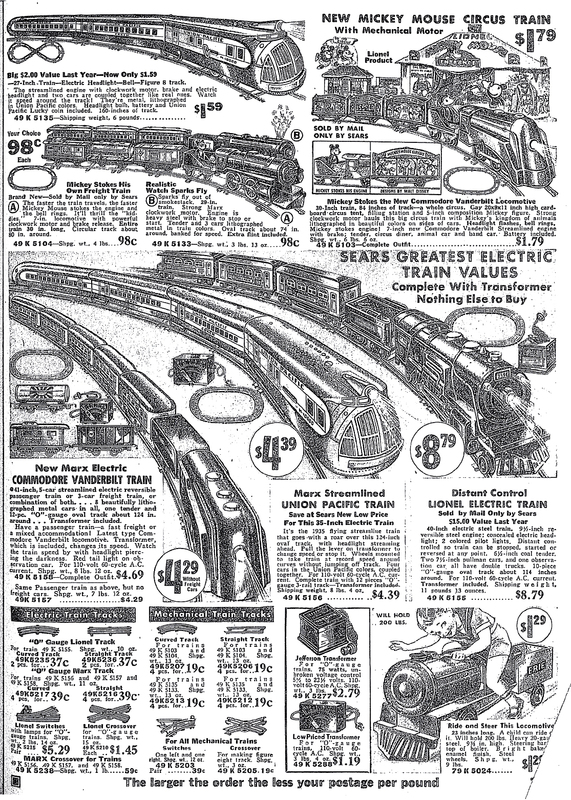 In 1935 they misspelled "gauge" on the name plate. 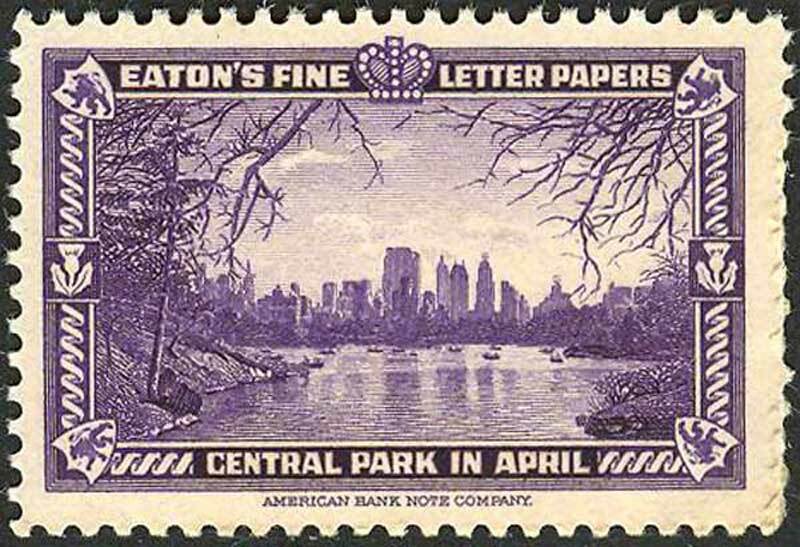 This is a 1936 version. 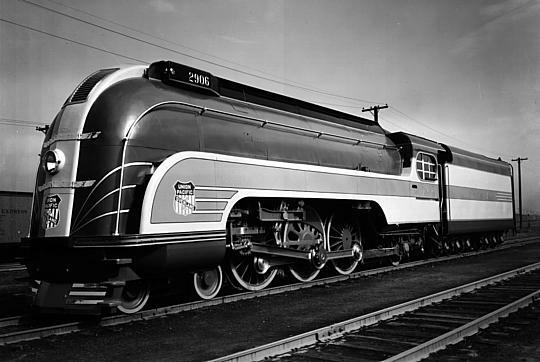 ..."
Formally known as "The City of Salinas", this train quickly became known as "Little Zip" because it could be seen whizzing along at over 100 mph powered by a 600 hp spark ignition power plant (similar to an auto engine, but much bigger...) It represented the pinnacle of aerodynamic design for 1934. 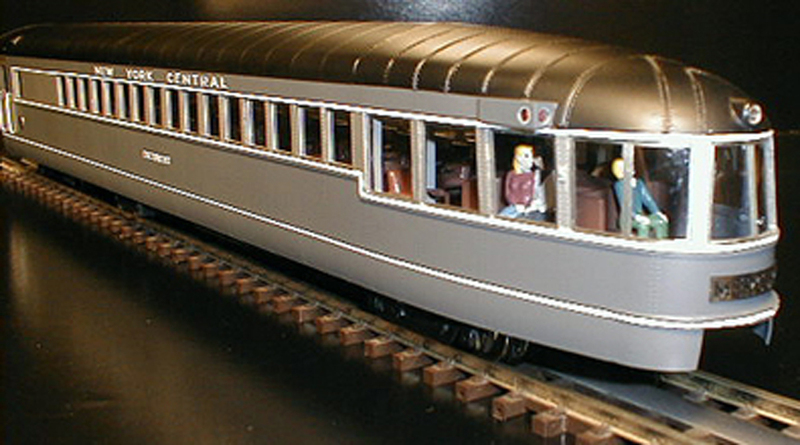 As shown in the Marx toy model, this was originally a 3 car train. 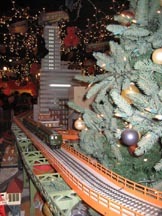 Both railroads embarked on a massive publicity campaign, sending their trains to newsworthy sites. 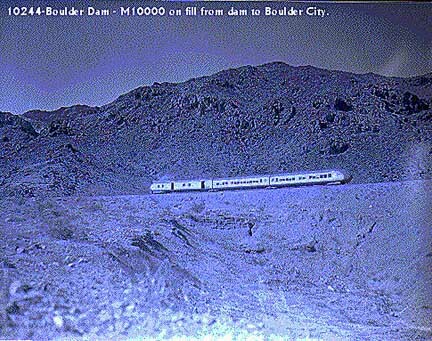 Here is the M-10000 at the site of Boulder Dam, using the temporary construction railway and not the regular commercial right of way. VIPs were carried directly to the site of the dam construction and even into the gigantic penstock tunnels. This was posssible because the train was small and light. Much of the right-of-way covered in this boulder Dam visit is now underwater. 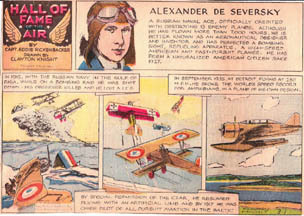 The CB&Q Zephyr also traversed this route as it starred in the 1930s film "Silver Streak." Both railroads were unsure of what the new trains could do or how reliable they were. 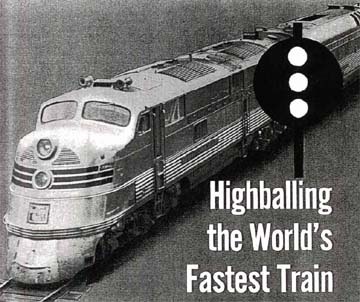 After the initial fanfare died down, the high speed trains were put into service on relatively flat, lightly traveled, short distance runs that could easily be completed in a single day. In such a fashion the trains were given the opportunity to prove themselves, but if they were to fail, it would not be a catastrophic disaster. 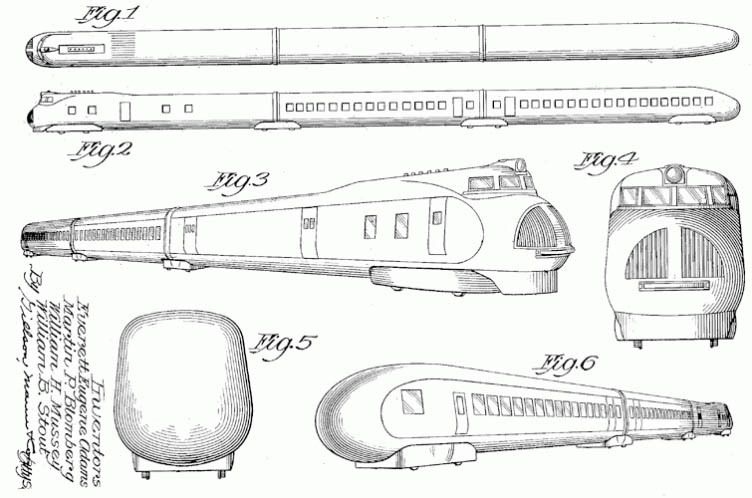 The streamlined trains instantly became a symbol of Progress. 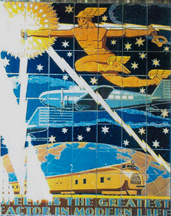 The M-10000 was permanently enshrined in a ceramic tile plaque on the walls of the Industrial Arts Building of the Long Beach Polytechnic High School. 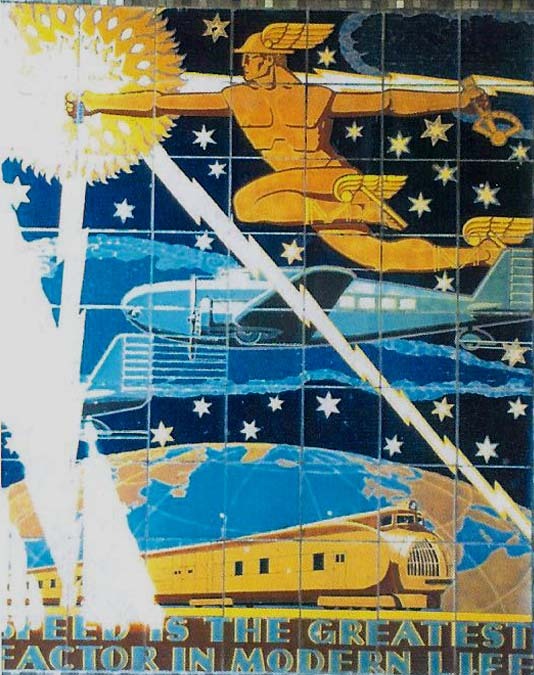 The mural features the Greek god Mercury blazing a trail from night to day. In addition to the M-10000, a DC-2 is also shown. 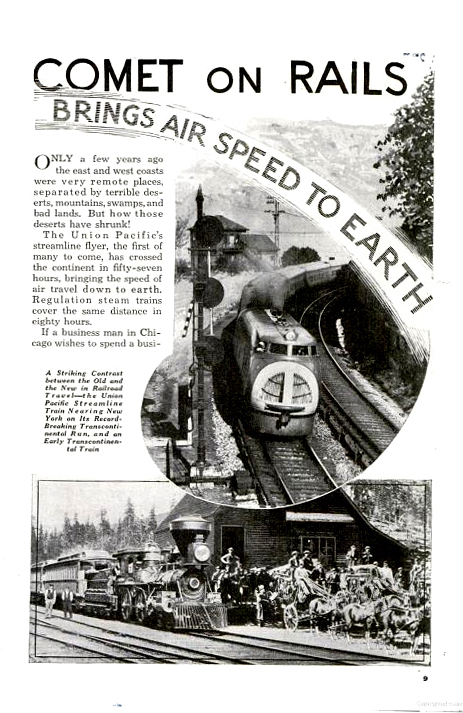 The motto is "Speed is the Greatest Factor in Modern Life", which was certainly appropriate to the aircraft and railroad industry of 1936 California. The plaque was created by Ivan Bartlet and Jean Swiggett with support from the Federal Arts project. 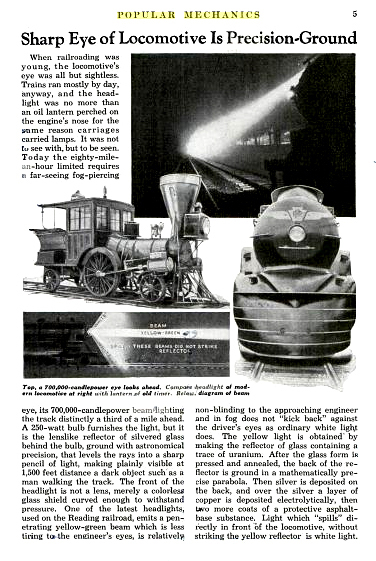 The M-10000 was featured in an article in the November, 1935 issue of Popular Mechanics entitled "Comet on Rails." 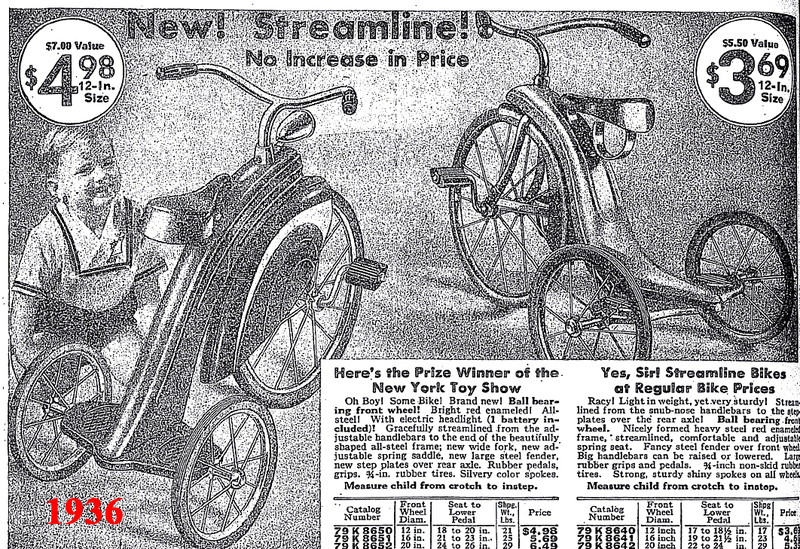 Click here to download a copy of this 1935 article. 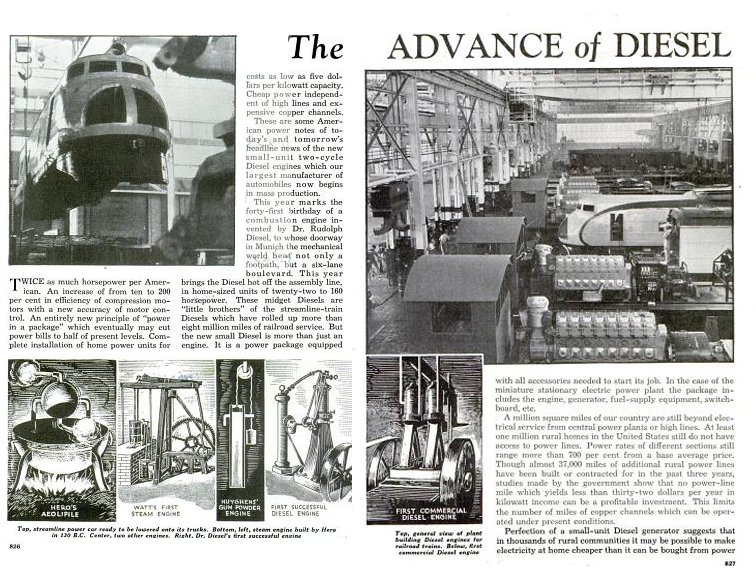 A later article called "The Advance of Diesels" provided a look into the technology and construction methods for these trains;Click here to download a copy of the 1938 article. 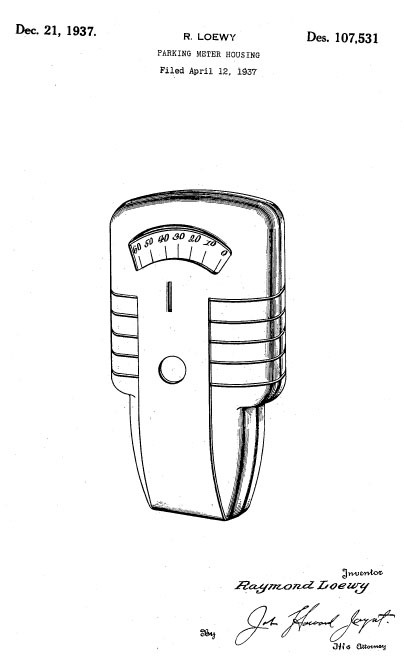 Many advertisers wanted to link their product to speed, modernity and beauty and featured the M-10000 in advertising. Click here to download a compendium of ads featuring the M-10000. 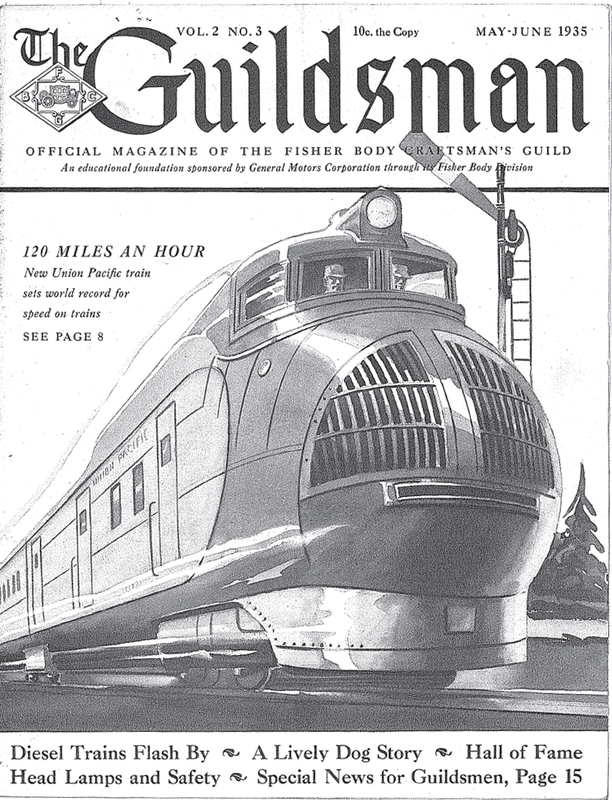 Here is an illustration that was part of a cover story on the advent of Diesel trains as published in The Guildsman, the official magazine of the Fisher Body Craftsmans Guild, an organization of Real Boys from the 1930s that was set up by General Motors. Click Here to read the whole article. At the time, GM was the largest supplier of industrial diesel engines and had a big stake in the switch away from coal/steam. 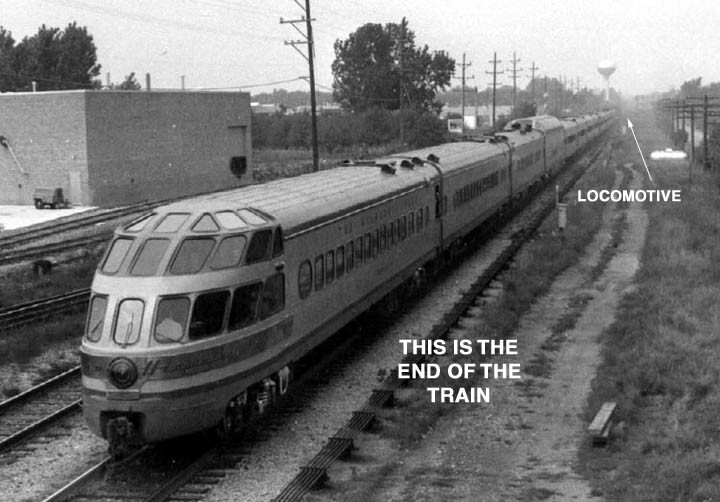 On balance, the M10000 was a mild economic success, but the Zephyr was a huge success. 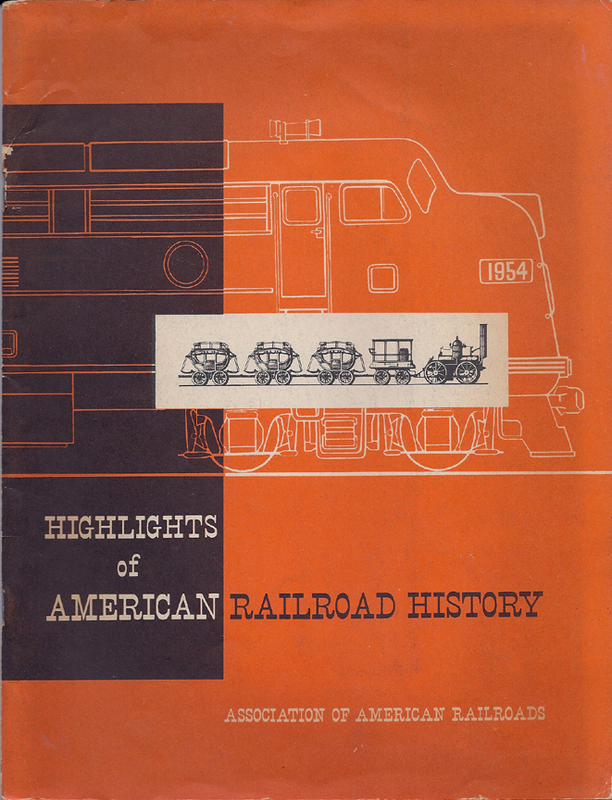 Before the end of 1934, eight major railroads had ordered high speed diesel powered trains. 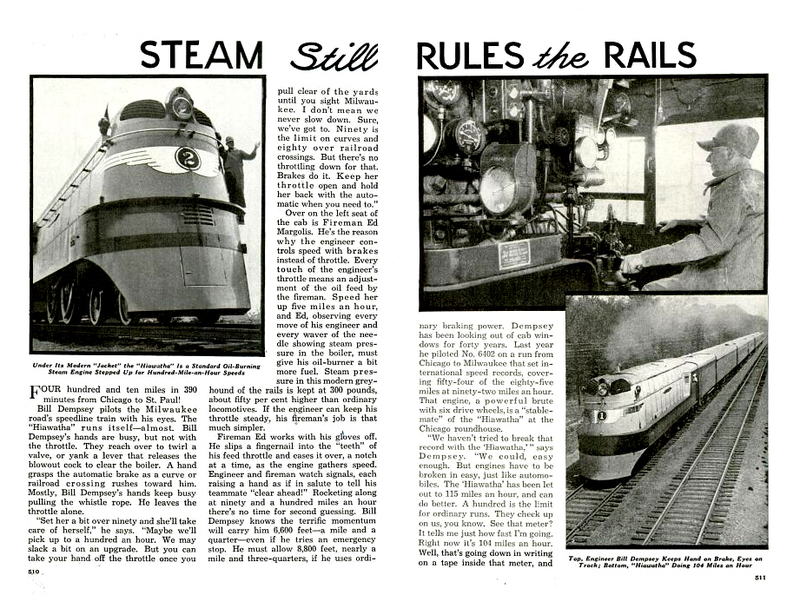 As the 1930s progressed, more and more designers began experimenting with shrouds for steam locomotives. The Commodore Vanderbilt was a very popular image. 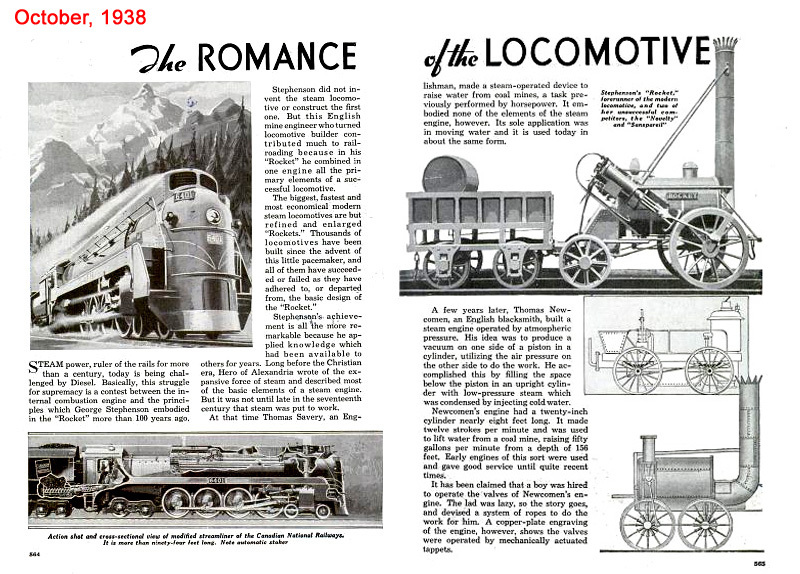 Here are some images from the 1937 Sears Catalogue of toy representations of this locomotive. 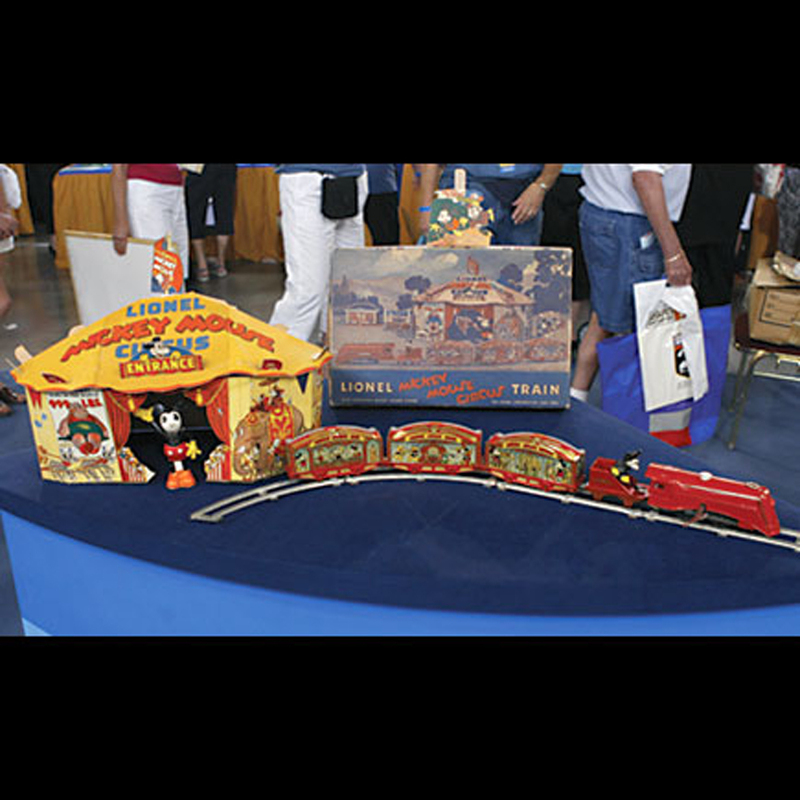 Of special note is the Mickey Mouse Circus Train that was recently valued at $10-$12,000 on the PBS Antiques Roadshow program. 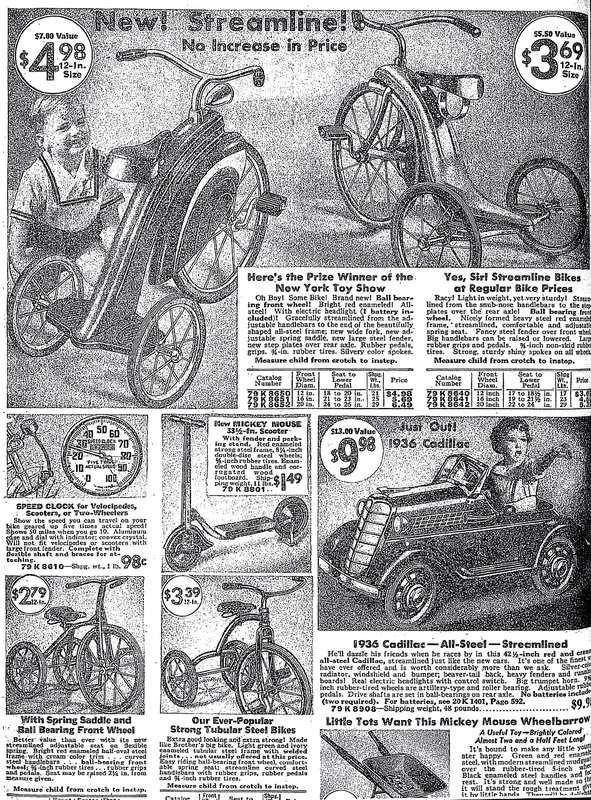 This is also part of our Magic Day page that discusses the enormous impact of spending about $10 in the Sears Catalog in 1937. 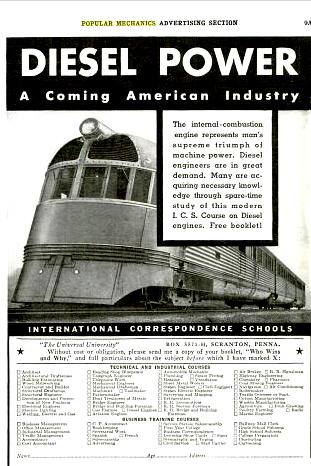 In the mid-1930s, the New York Central launched a new streamlined service focusing on speed and innovation. "Mercury," the name of the Roman god of messengers, was chosen for its connotations of speed. 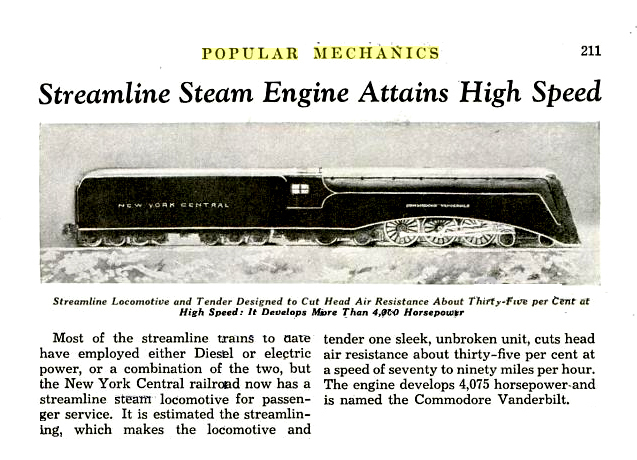 NYC selected Henry Dreyfuss as the designer, due to his affiliation with the Commodore Vanderbilt locomotive. 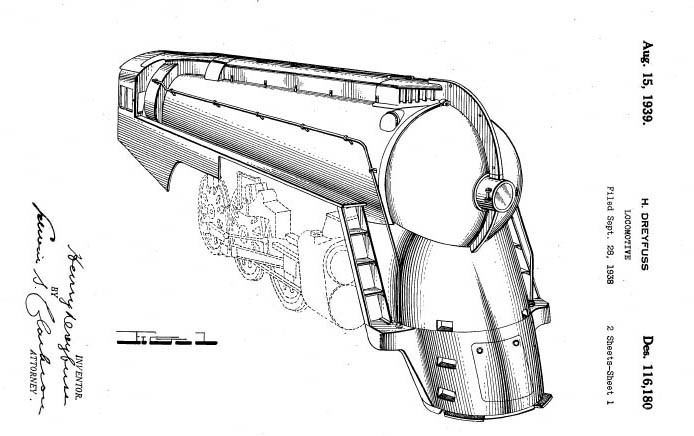 Dreyfuss was best known for his work on consumer products like telephones, fountain pens and vacuum cleaners, and added stylistic details to the Commodore Vanderbilit, although [above] the actual design for the locomotive was done at Case-Western University by Lentz and Kontola. 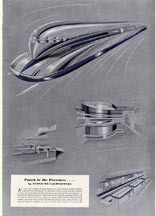 Dreyfuss was asked to coordinate the Mercury project in 1935 although his use of shrouding retains the aerodynamic shape of the Commodore Vanderbilt. 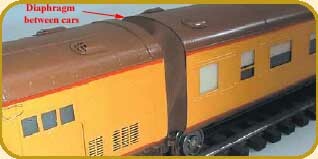 More details about the interiors and train consists for the Mercury may be found here. 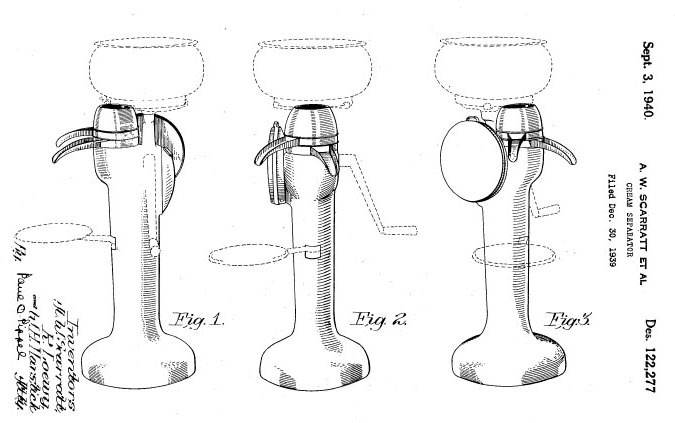 During his lifetime, Kuhler was awarded a large number of patents. 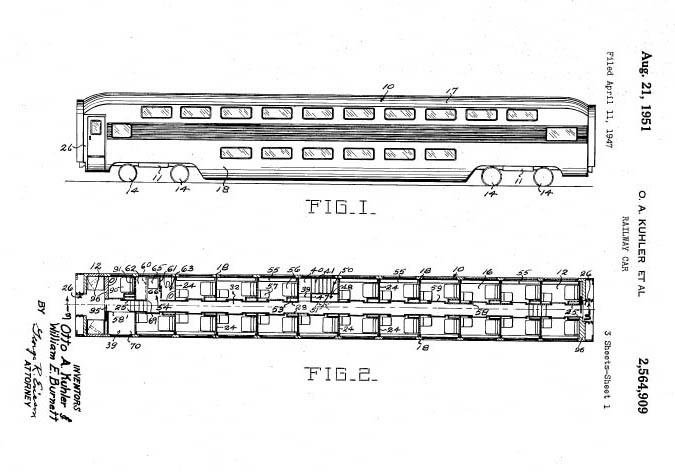 Here is his patent D-148,308 that looks a whole lot like the outside of the observation car on the Hiawatha during the 1940s, and his Patent 2,595,858 looks a lot like the inside. 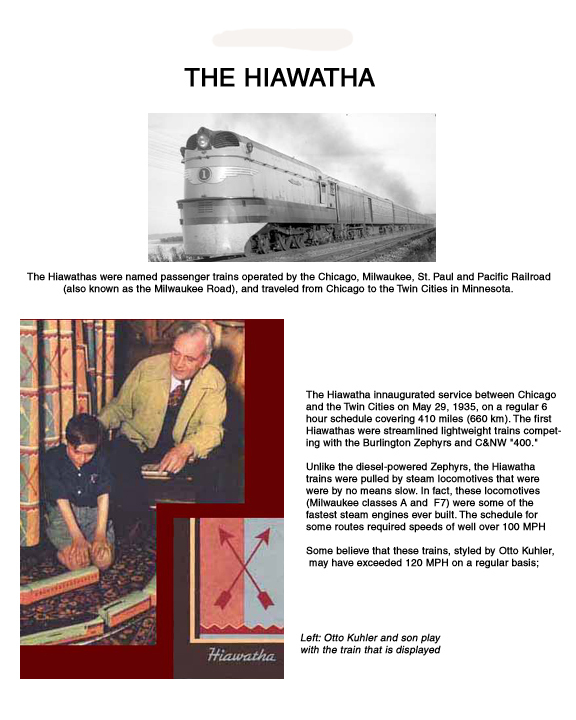 The Hiawatha was a very photogenic and popular train. 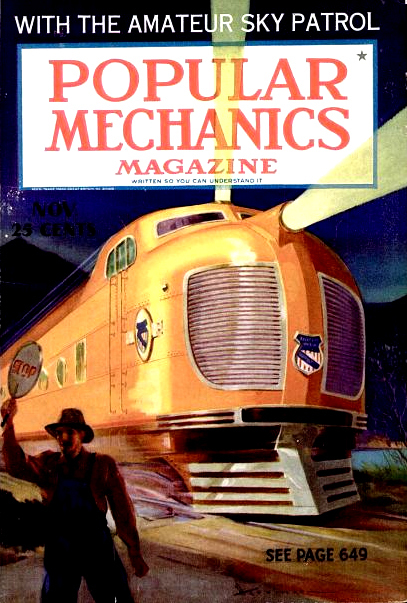 It made the cover of Popular Mechanics in December of 1935. 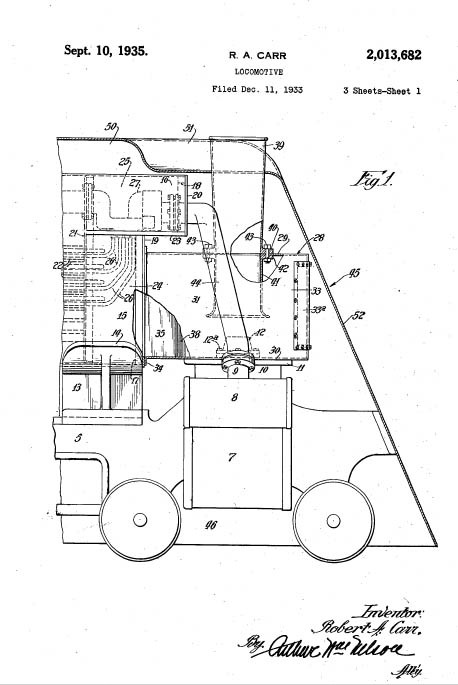 It was hoped that this system would enable steam engines to compete with diesel. 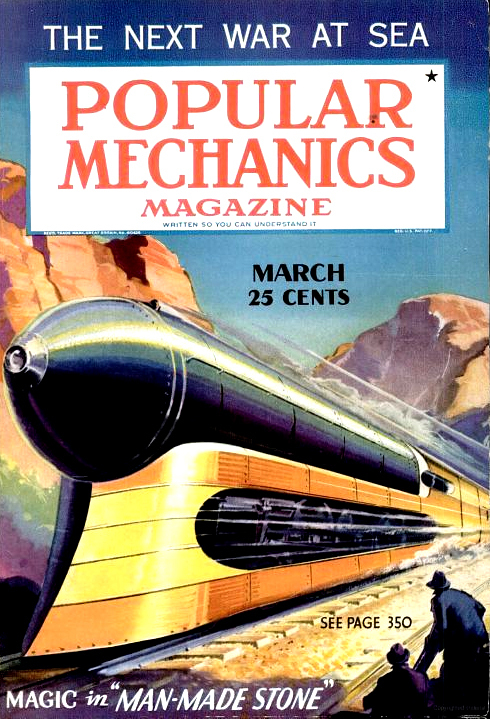 The Crusader even made the cover of Popular Mechanics in 1938. 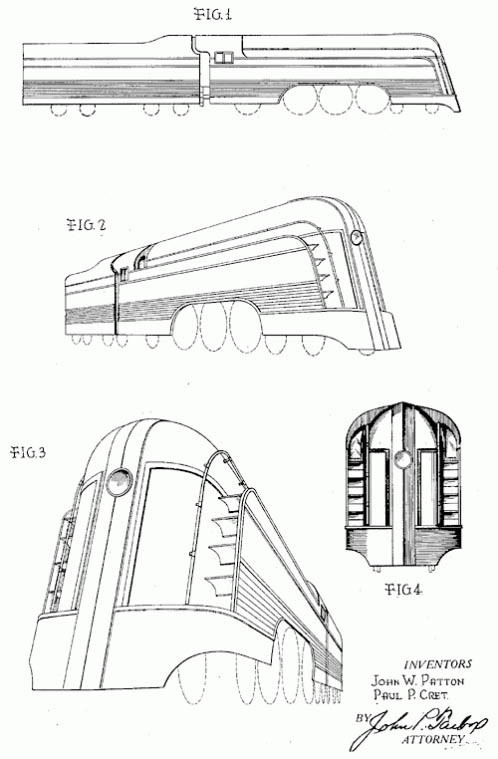 The design of the train was patented by Paul Cret, a World-famous Architect and Designer. 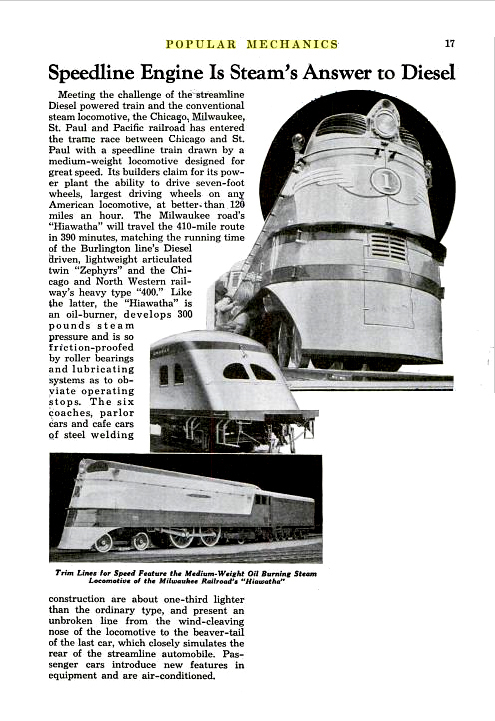 The Union Pacific enjoyed some success and recognition with the M-10000 (above). 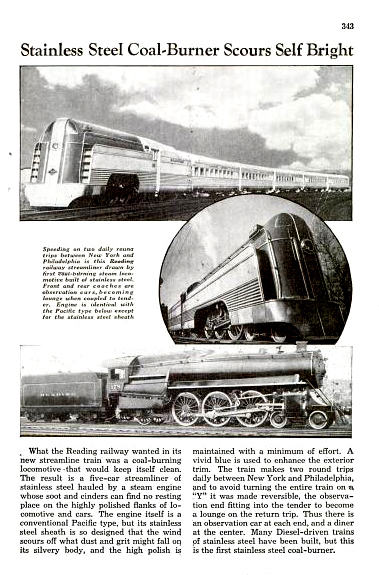 Between 1936 and 1941, the railroad responded as public acceptance of the Streamliners increased. 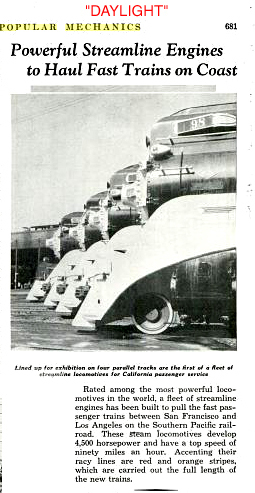 More powerful locomotives were introduced, and larger additional cars were built. 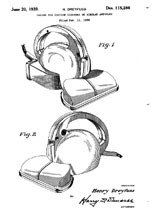 Added equipment allowed an increase in frequency from every sixth day to every third day. 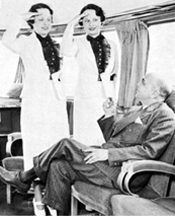 Because most passengers chose sleeping accommodations over regular-fare coach service, more sleeper and Pullman cars were added. 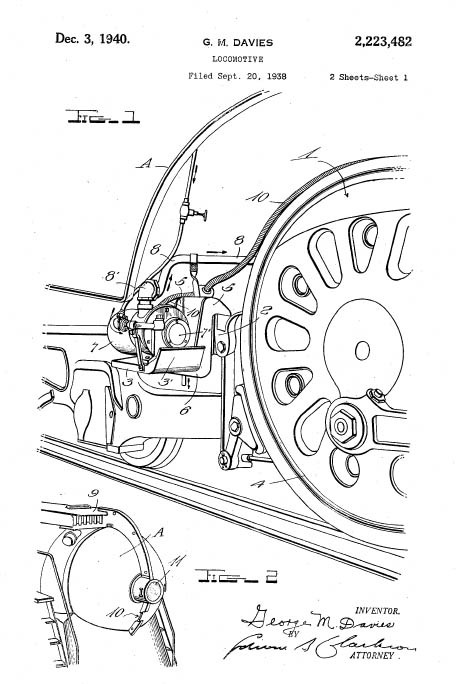 Here are some patent diagrams that illustrate new trends in passenger equipment that are related to the development of lightweight, streamlined cars. 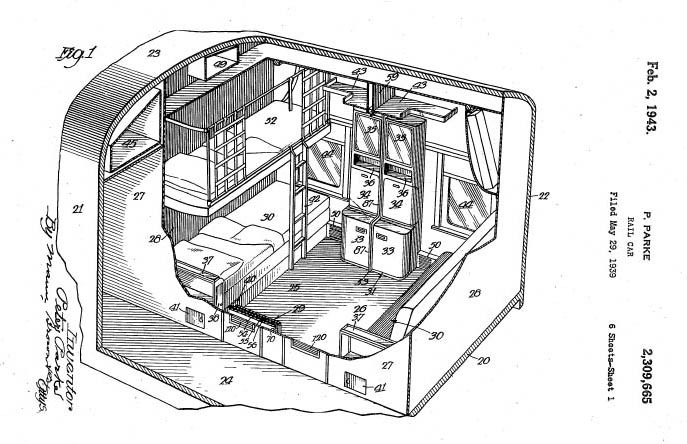 Among the innovations are room-based sleeping cars (doubles and "roomettes") as opposed to the older "sections" where chairs were transformed into berths. 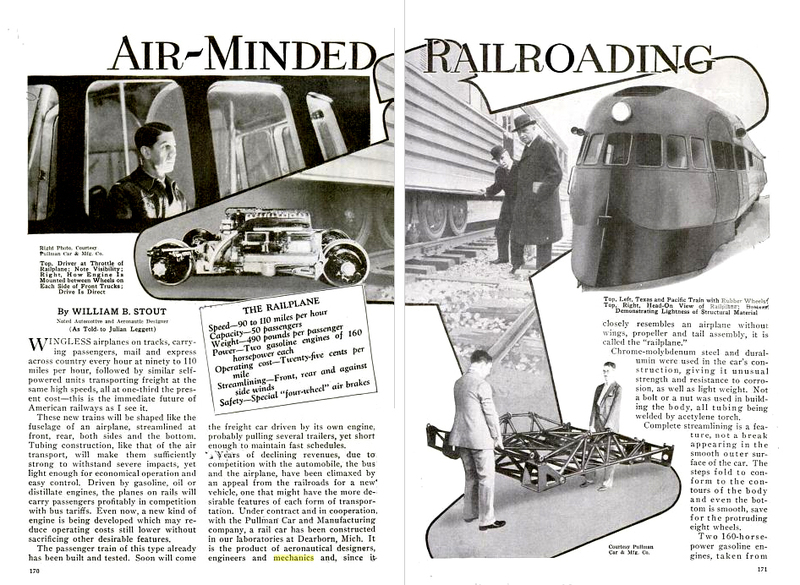 Also, experiments in two-level cars and dome observation cars were conducted, all made possible by new lightweight materials. 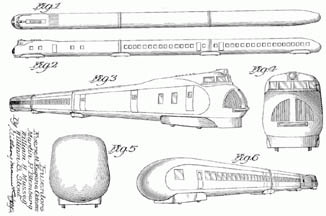 As the trains got heavier and the cars became larger, the concept of permanently connected cars and locomotives fell by the wayside since the one-piece articulated train was not feasable for the long-haul routes. 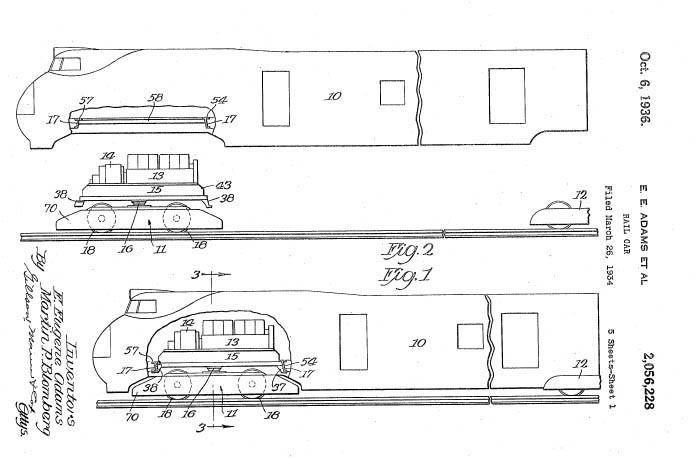 The more powerful locomotives were separate from each other, and from the now-separated larger cars. 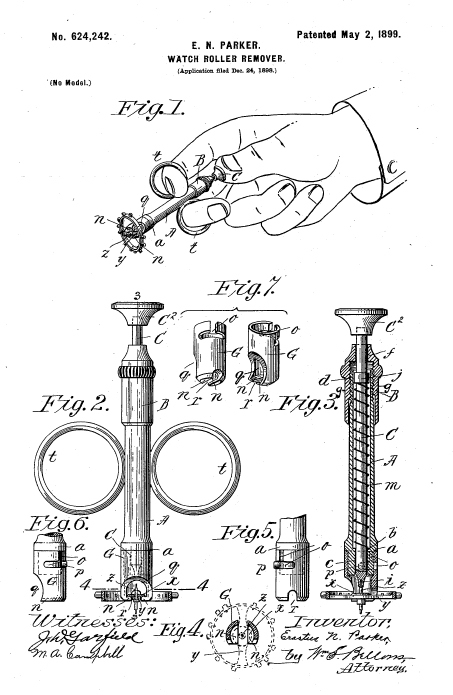 All equipment used standard railroad couplers. The City of San Francisco and the City of Los Angeles each grew to 14 cars and three locomotive units. 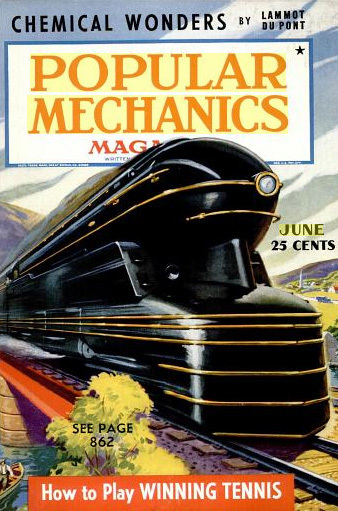 Popular Mechanics was totally thrilled with the new Union Pacific trains and devoted a two-part series to their operation. 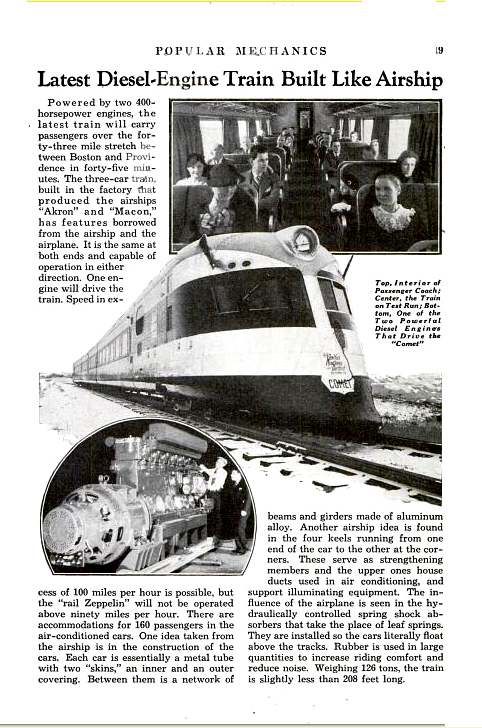 In view of the upcoming 1938-40 Golden Gate Exposition in San Francisco, UP decided in 1937 to add an extra eight-car all-Pullman extra-fare train on the Chicago-San Francisco route. The cars were painted Harbor Mist gray with black roofs and trucks. Car sides had gold stripes edged in black. 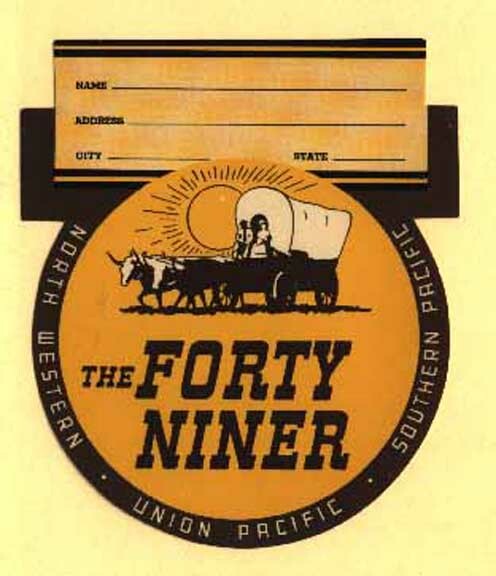 This train, named the Forty-Niner, would provide alternate five-times-a month service to the five-times-monthly City of San Francisco. 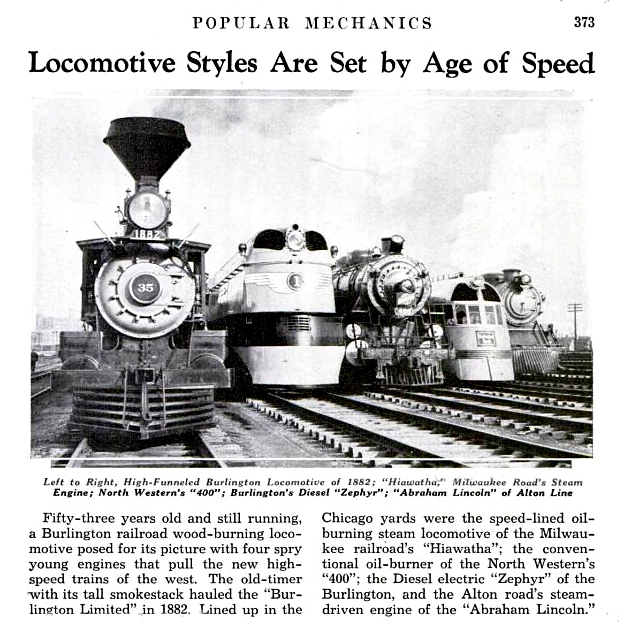 Equipped with roller bearings and lightweight piston rods in 1936, these outstanding locomotives pulled the Forty-Niner at speeds of over 90 miles per hour en route (50 hours Chicago-Oakland) (2260 miles). 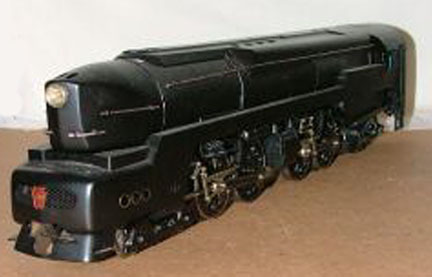 The streamlined Baldwin 4-6-2 heavy Pacific No. 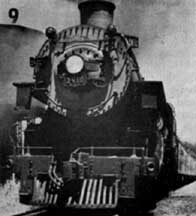 2906 led the Forty-Niner between Omaha and Cheyenne, where similarly shrouded 4-8-2 Mountain No. 7002 took over on the grades of Sherman Hill before handing the train to the Southern Pacific at Ogden, Utah. 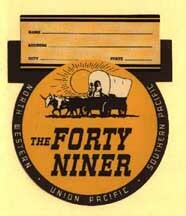 With the end of the Exposition, however, UP decided to retire the Forty-Niner in 1941, after a glamorous but brief career. 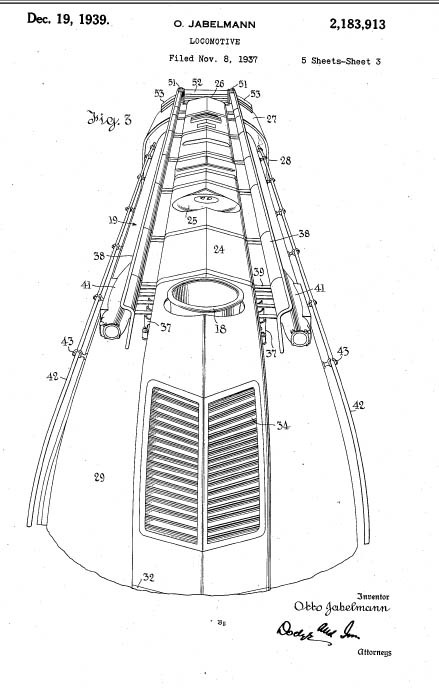 The streamlined bulb-nosed shrouding was designed by UP mechanical officer Wayne Owens, although Otto Jabelman, head of the UP R&D unit has credit on the patent (below). The shrouding was removed from both in 1942, after the Forty-Niner was retired. 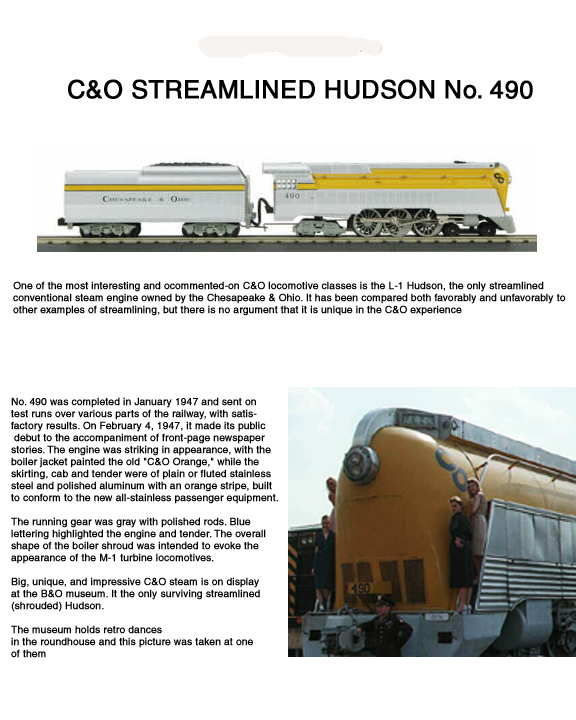 Here are more photos of the C & O Hudson No. 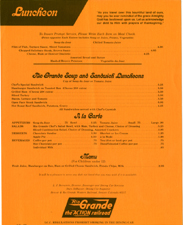 490 that can be enlarged, carefully adorned with photos of ladies from the DC Swing Dance community. 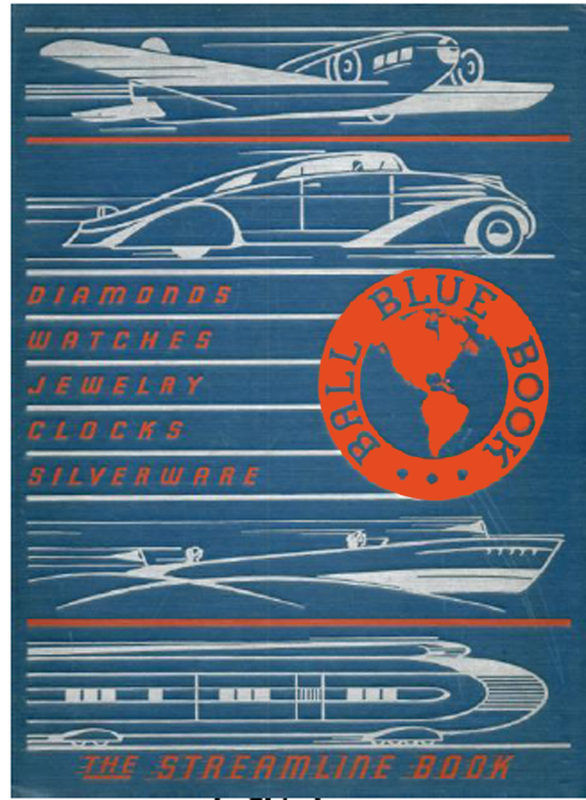 The Dreyfuss design captured the imagination of the public and is often used as an icon of the fabulous streamlined era. Below is a photo of a mural in the lobby of the Edison Hotel in New York that pays homage to "Transportation". 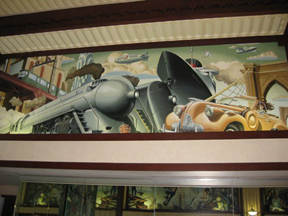 The Dreyfuss Hudson is in the foreground; note also that the Commodore Vanderbilt is also in the mural. 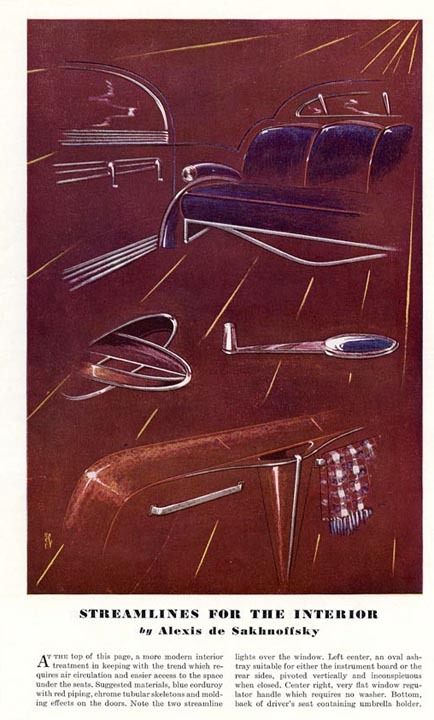 Dreyfuss not only designed the locomotives, but also did the interiors for the cars. 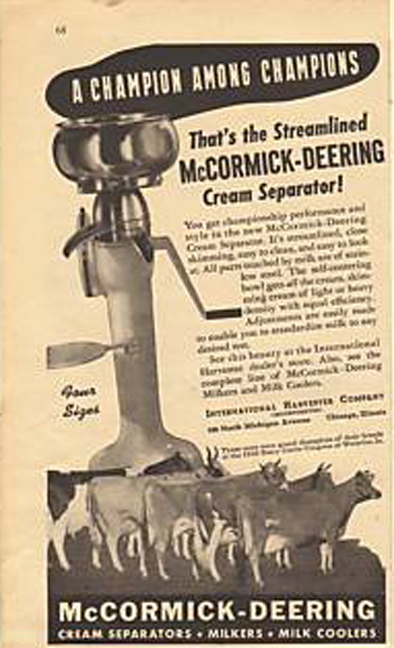 He was apparently so enthusiastic about his work for the New York Central that it spilled over into his vacuum cleaner design work for the Hoover Company. 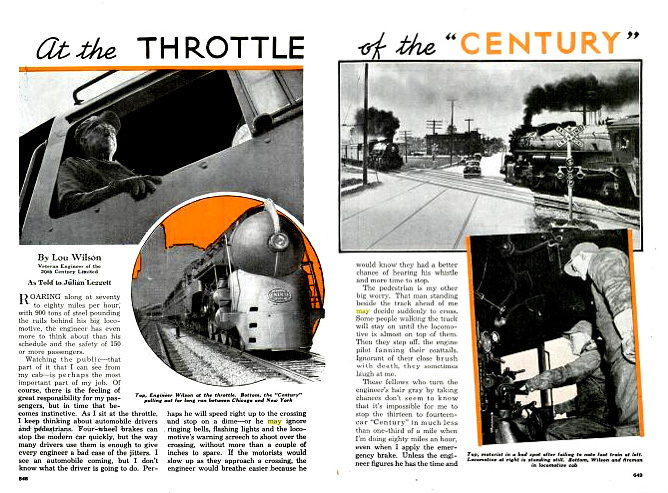 We were fortunate to find a detailed article called "At the Throttle of the Century" that gives many of the details of operations. 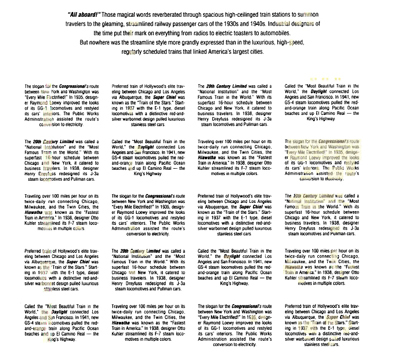 Click here to download a ".pdf" of the whole article. 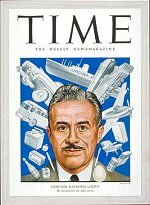 Raymond Loewy was an influential designer of the 1920s through the 1970s. 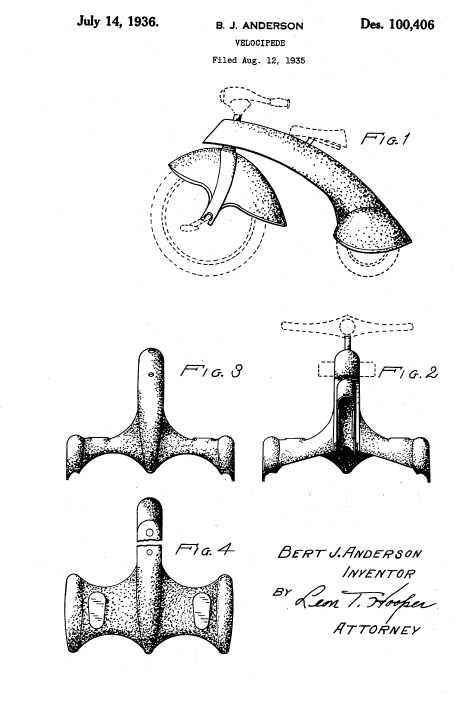 He may have coined the term "Industrial Design" -- he certainly was successful, because his mark is all over our society today. 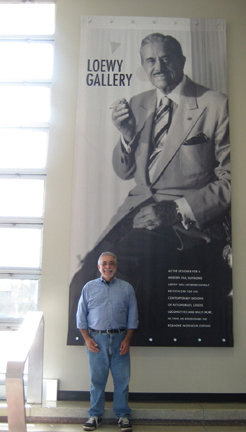 He even got his picture on the cover of TIME Magazine, surrounded by images of all the wonderful things that he created. 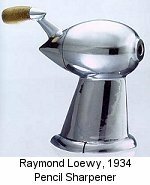 Actually, Loewy created the oustide of most of these wonderful things; the inside was created by more plebeian engineers. 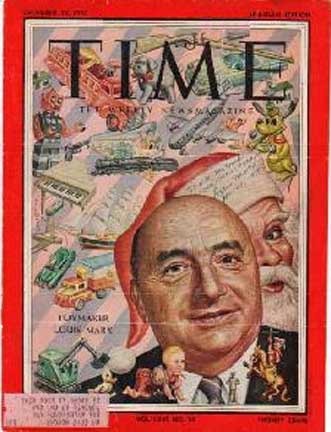 Mr. Loewy had a vision of a widespread integrated public transit system involving both Busses and Trains filling short and long haul needs. 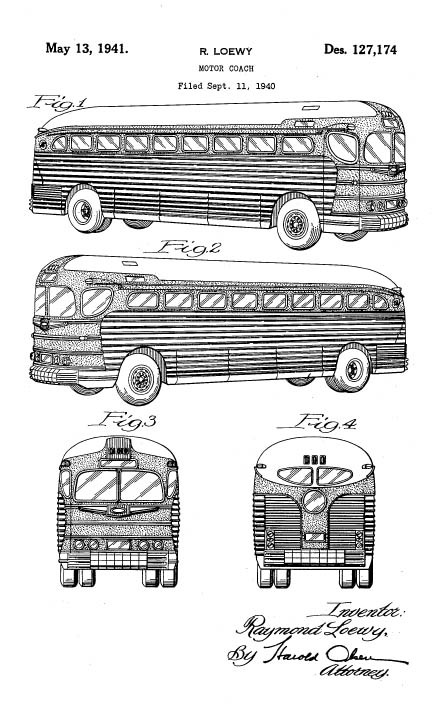 To this end, he designed four landmark Motor Coaches for the Greyhound Corporation. 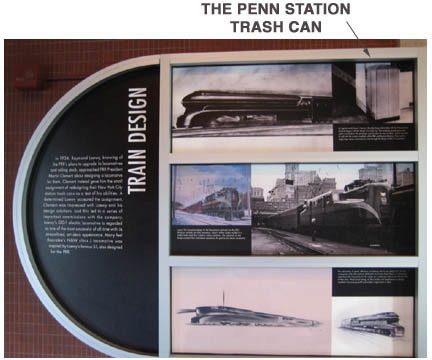 Loewy must have been a great talker as well -- he began his relationship with the Pennsylvania Railroad designing trash containers for Penn Station. 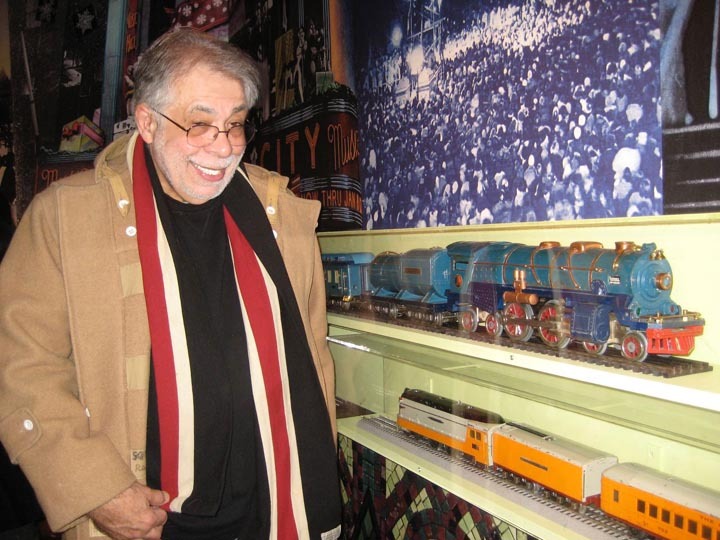 He eventually wound up designing multi-million dollar locomotives. 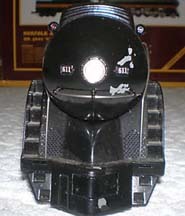 His first foray into streamlining engines came with the K-4. This is strictly a cover put on an existing steam engine. 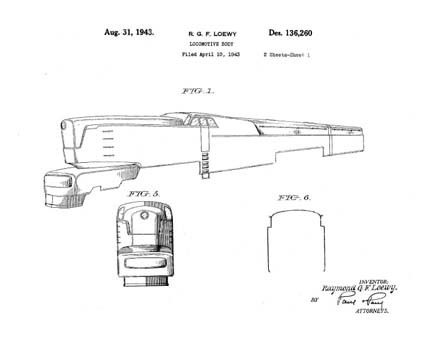 Loewy was awrded patent D106,143 for his effort. In general, efforts at shrouding produced memorable images, but went nowhere. A steam locomotive is a complicated mass of valves, rods, gears and wheels, all of which tend to break down or need adjustment regularly. The steam engine also emits a LOT of smoke. 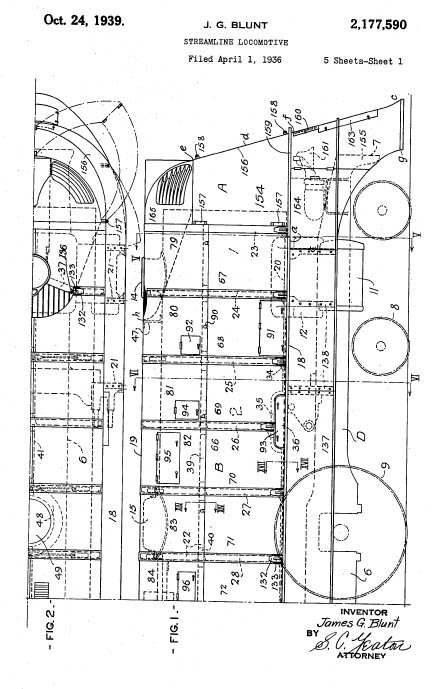 The shroud interfered with maintenance and that nice smooth laminar flow (top figure, bottom right) kept the smoke hugging the exterior of the train. Most shrouded locomotives ran with the sheet metal for photo ops but the same glorious exterior was slowly dismantled by the maintenance staff. They never really solved the smoke problem. 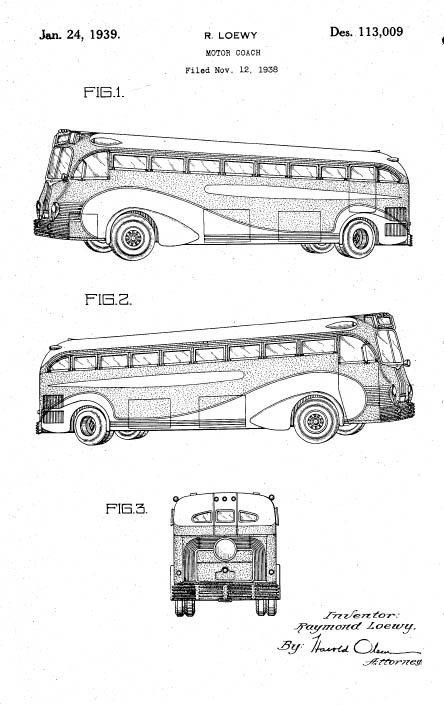 Raymond Loewy leads off this section because he was the only "designer" to be involved in ground-up streamlining. 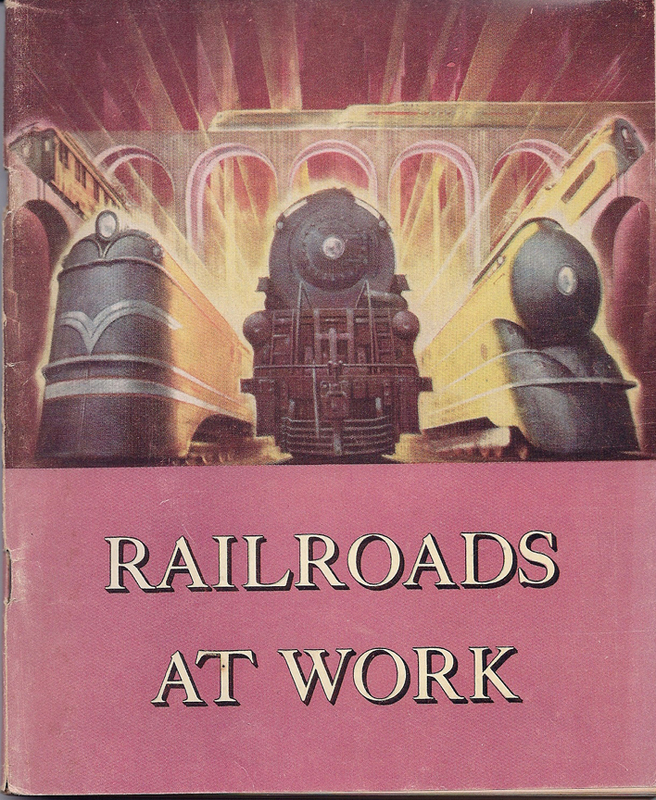 Other efforts were done by the engineering staff of the various railroads. 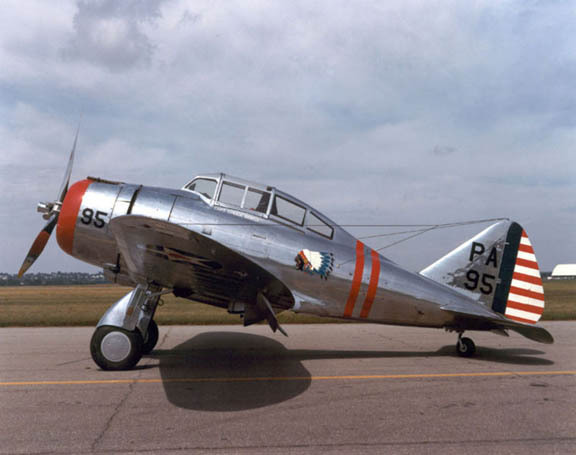 First up is the S-1, a beautiful but flawed lady. 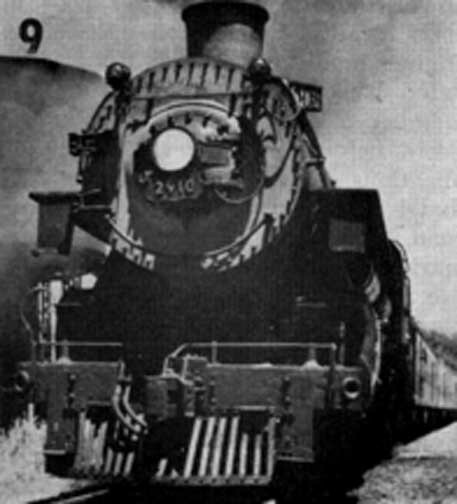 The PRR S1 class steam locomotive (nicknamed "The Big Engine") was an experimental locomotive that was the largest rigid frame passenger locomotive ever built. 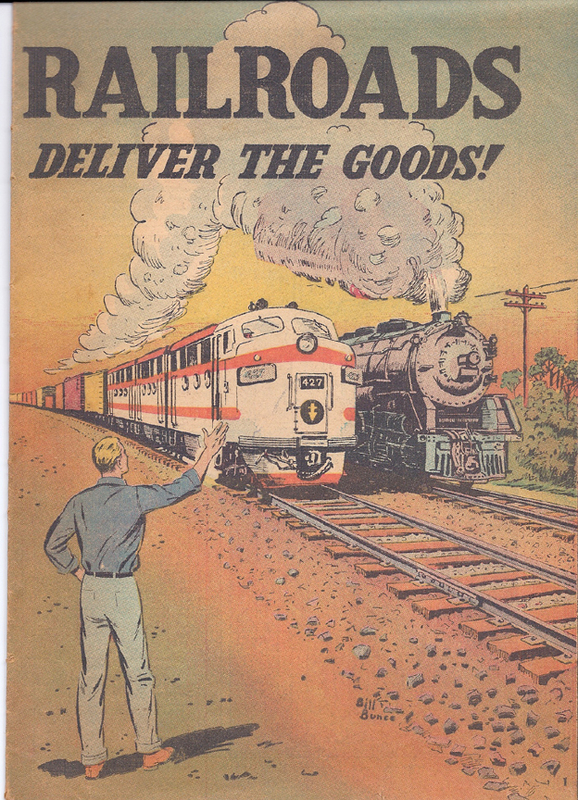 In 1937, Pennsylvania Railroad officials decided to build a new passenger locomotive to replace its aging K4 locomotives. 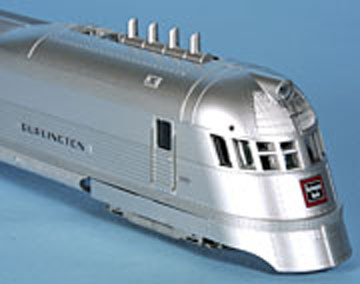 In a collaborative effort, the Pennsylvania Railroad, Baldwin Locomotive Works, the Lima Locomotive Works and the American Locomotive Company contributed to the experimental S1 design. 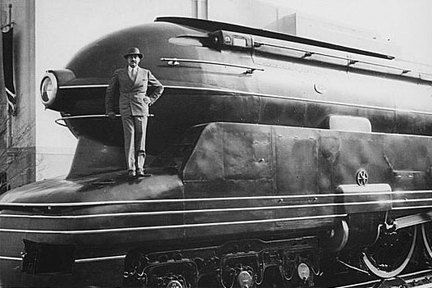 The streamlined Art Deco styled shell of the locomotive was designed by Raymond Loewy. 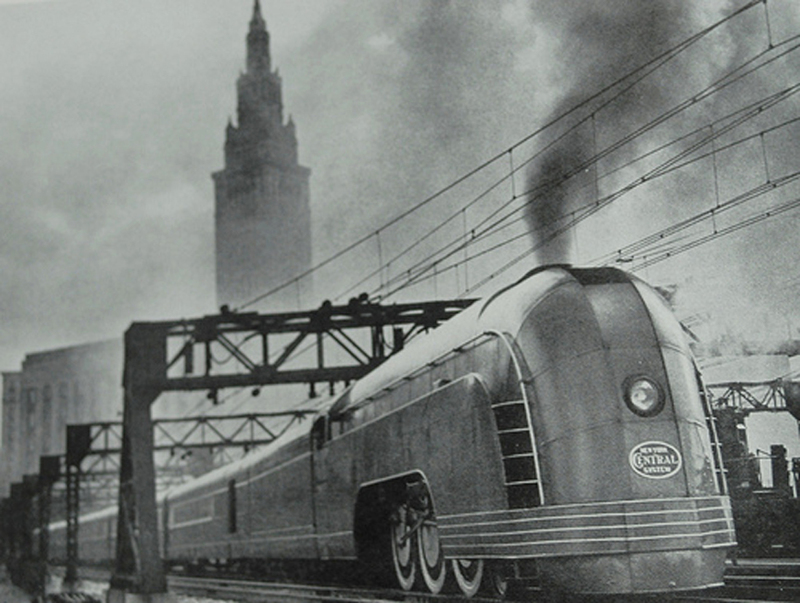 The S1 was displayed at the New York World's Fair of 1939, after which it was assigned to passenger service on the main line between Chicago, Illinois and Crestline, Ohio. 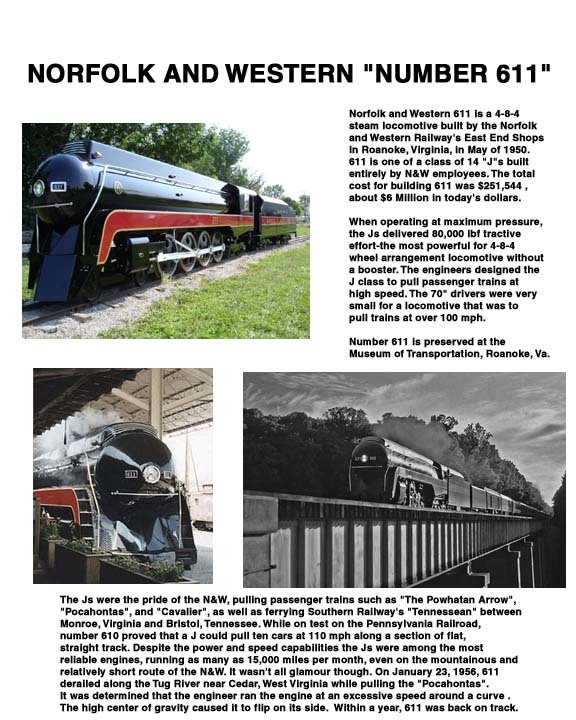 The S1 was used by the PRR for publicity purposes as well. 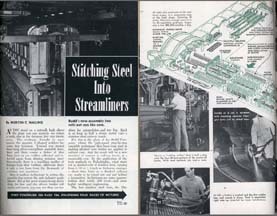 Click here to download a free copy of the June, 1939 Popular Mechanics article on the S-1. 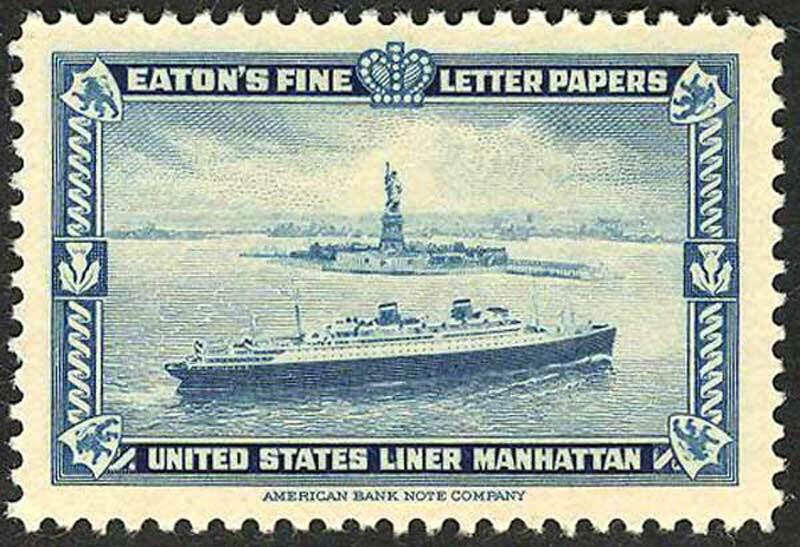 The American Bank Note Company issued a series of posters to demonstrate their engraving skill. 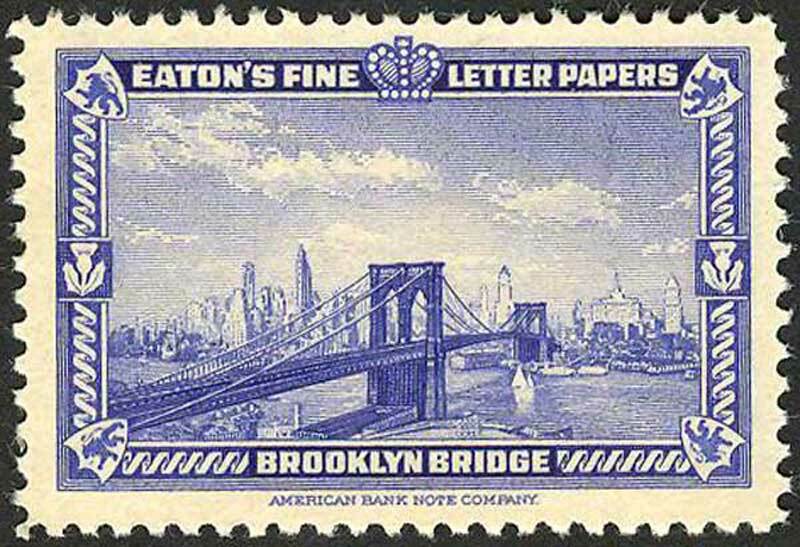 They were published by the Eaton paper company as part of an advertising campaign. The engravings are quite lovely. 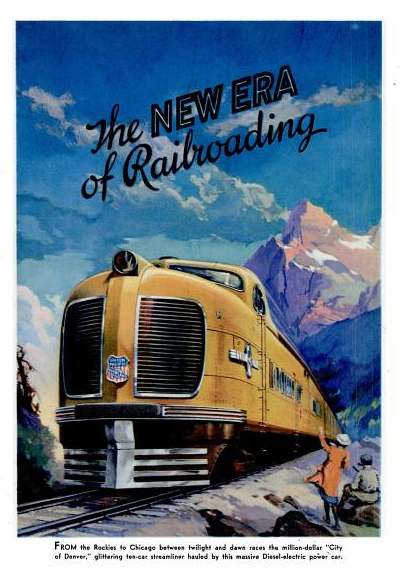 One of the posters depicts the S-1 hauling the Broadway Limited indicating that the locomotive had been identified with New York City even before it was put into actual service. 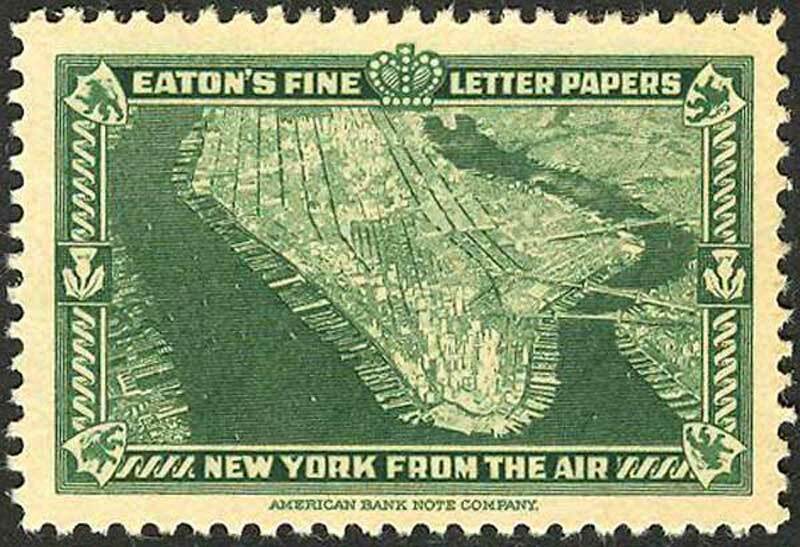 here is a picture of the S-1 stamp. The series of other posters is son nice that we have included them as well, a brief digression from streamlined trains. Episode Two, Season Three of the popular sitcom "Mad Men" (set in 1963) has lead character Don Draper telling his brother-in-law to go home on the New York Central's Broadway Limited, leaving from Pennsylvania Station. Usually, this program gets its history dead-on, but this is a major gaffe. 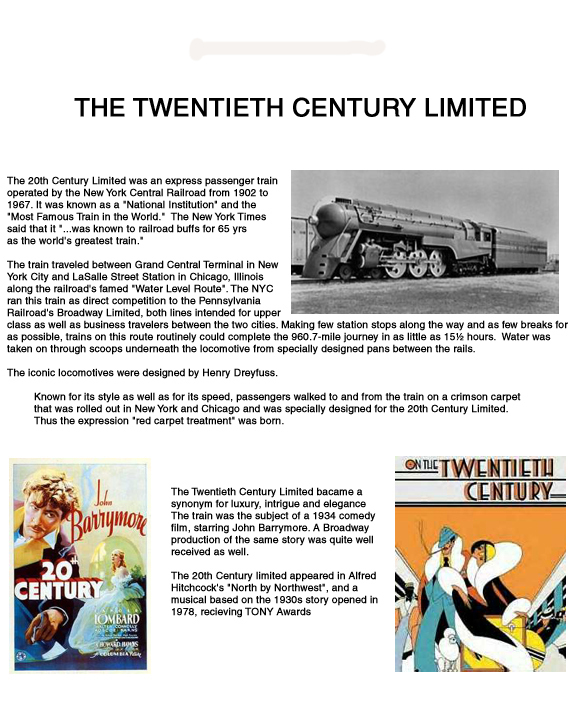 In 1968, the Pennsylvania Railroad merged with the New York Central (to become the ill-fated Penn Central), so it is conceivable that five years after the speech was given, the New York Central might have had something to do with the "Broadway" -- but not much! 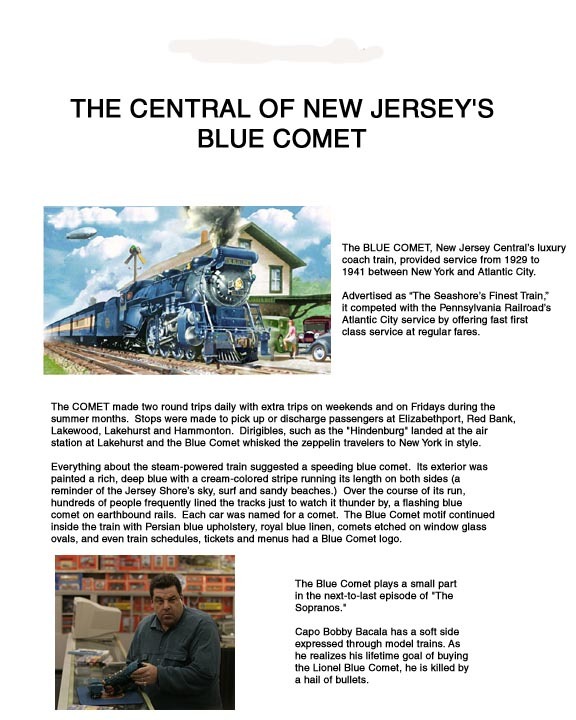 It was hoped that the locomotive could haul 1,000 tons at 100 miles per hour, but this goal was not reached. There are apocryphal stories of the S1 reaching or exceeding 140 miles per hour, but there is no documentation of this and it is considered unlikely by experts. The locomotive's extreme length (140 feet 2 1/2 inches) limited its usefulness as it was incapable of negotiating curves on most of the PRR track system. Wheel slippage was another problem. 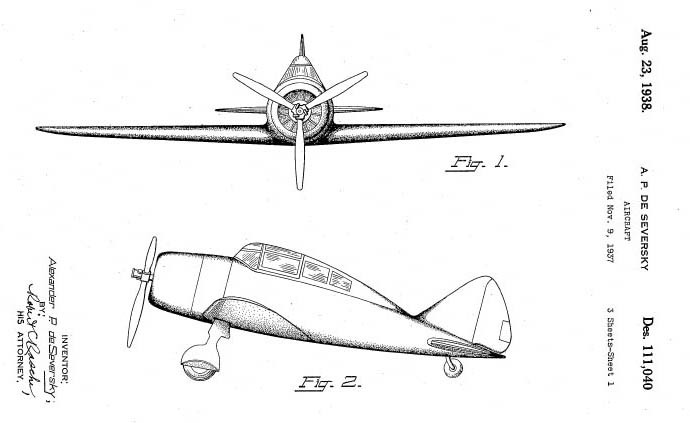 No further S1 models were built and the last run for the S1 was in December 1945; the engine was scrapped in 1949. The Pennsylvania Railroad's 52 T1 class duplex-drive 4-4-4-4 steam locomotives, introduced in 1942 (2 prototypes) and 1946 (50 production) were their last-built steam locomotives, and their most controversial. 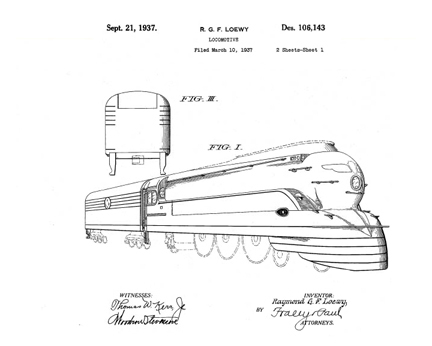 They were ambitious, technologically sophisticated, powerful, fast, and uniquely streamlined by Raymond Loewy. However, they were also prone to violent wheelslip both when starting and at speed, complicated to maintain, and expensive to run. 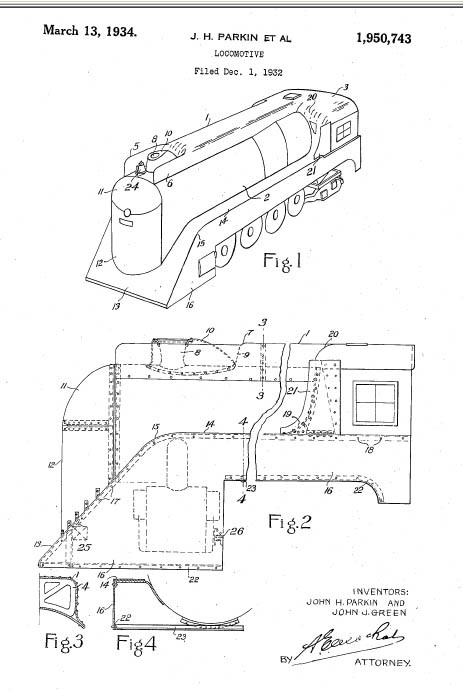 In 1948, the PRR reluctantly made a commitment to place diesel locomotives on all express passenger trains, leaving unanswered whether the T1's flaws were solvable. 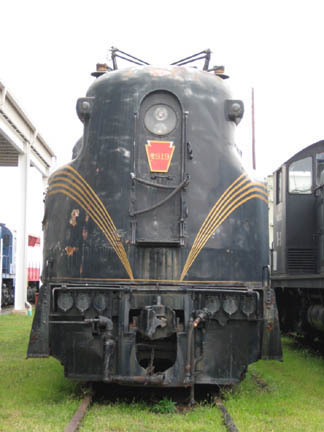 The Pennsylvania Railroad's GG1 class of electric locomotives were built between 1934 to 1943 at the PRR shops in Altoona, Pennsylvania, with a total of 139 units constructed. 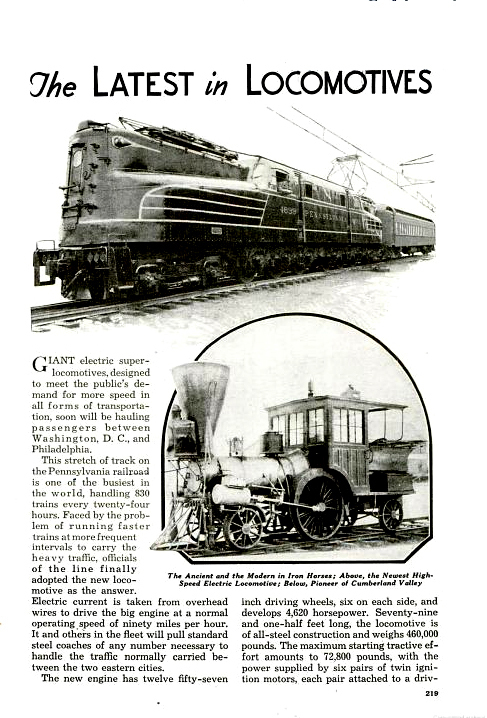 here is an article about the GG-1 that appeared in 1935. 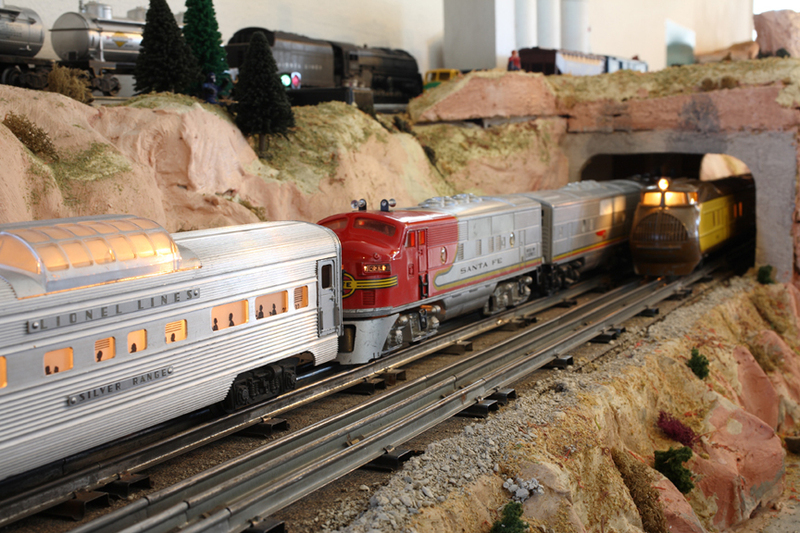 They remained in service with the PRR's successors until the early 1980s. 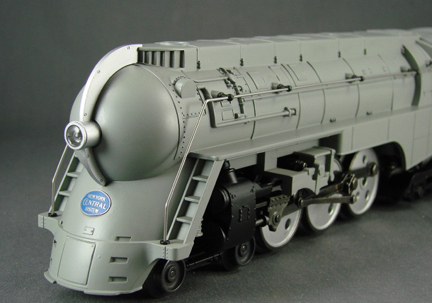 The GG1 became one of the most recognized and famous classes of locomotive worldwide. 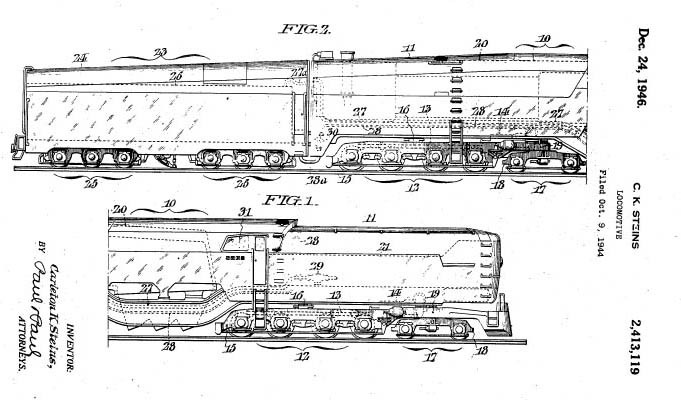 The GG1s were large locomotives, 79 ft 6 in (24.23 m) long and weighing 477,000 lb. 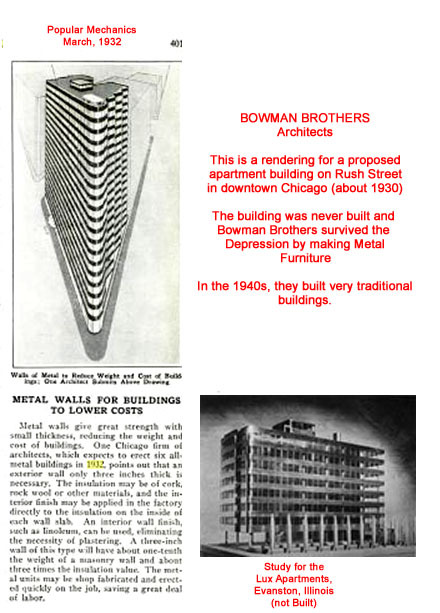 The double-ended main body was a single unit formed as a bridge-truss framework and clad in welded steel plate. The cabs were set up high about a third of the way along the locomotive from each end for greater crew safety in the event of an accident. 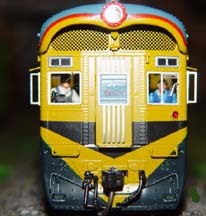 A narrower section of nose in front of the cab windows was lowered to improve the view forward, although the central part of the nose remained full height to carry the current-collection pantographs. The bodywork as a whole was smoothly rounded, with an appearance that suggested immense power and speed. 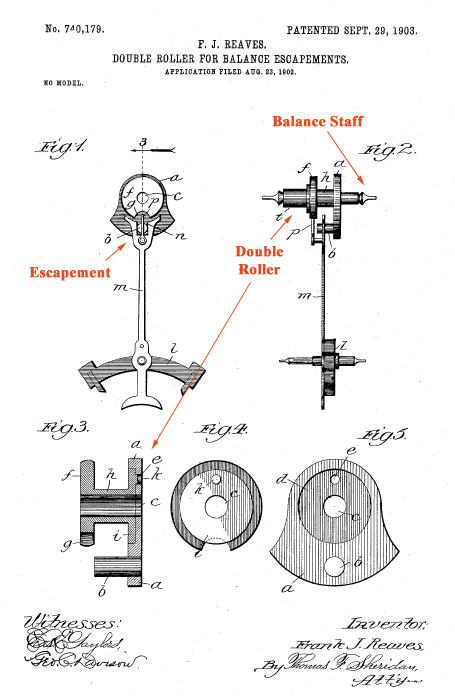 This was mounted upon two great cast steel locomotive frames linked by a hinge at the locomotive's middle which allowed side-to-side movement. 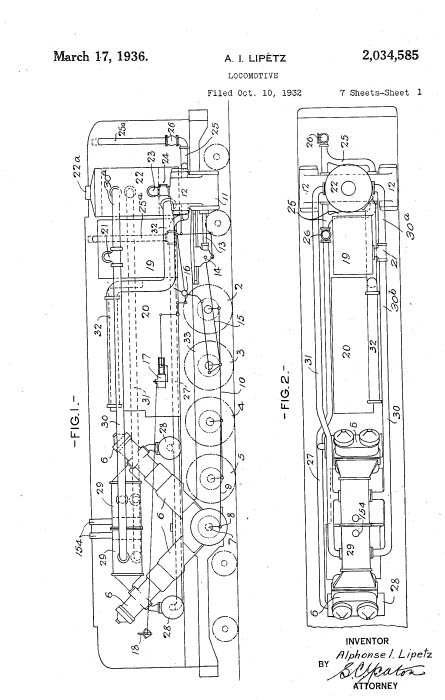 Six driving wheels (three axles) were fitted towards the center of the locomotive on each truck (twelve in total) and a four-wheeled, unpowered guiding truck was mounted toward each end. 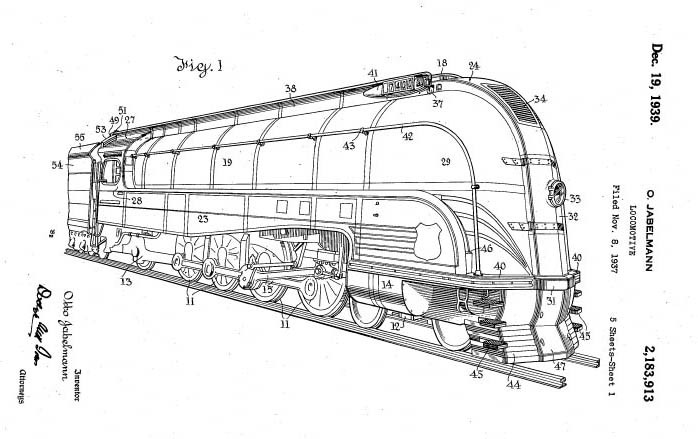 In the Whyte notation for steam locomotives, each frame comprised a 4-6-0 locomotive; in the PRR's classification system, 4-6-0s were class "G". 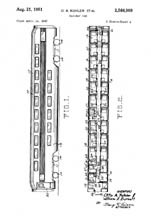 The GG1 consisted of two such locomotive frames mounted back to back, so it was classified GG�4-6-0+0-6-4. 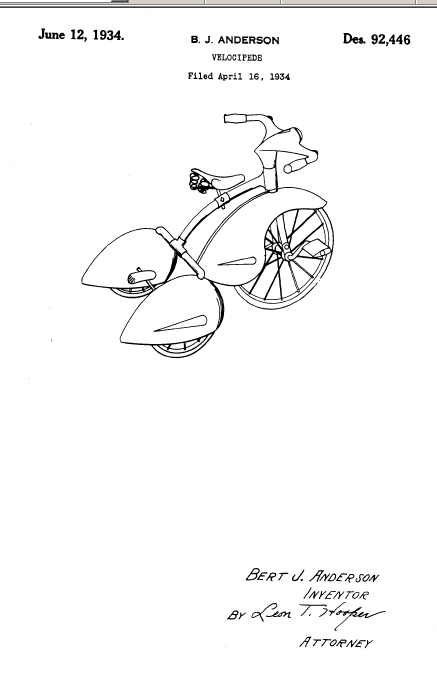 This arrangement is called 2-C+C-2 in AAR wheel arrangement notation. Each driven axle was powered by two 385 hp (305 kW) GEA-627-A1 traction motors mounted above and to either side of the axle. Drive was through a reduction gear and a quill drive assembly. 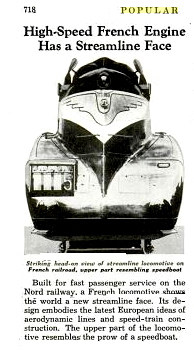 While the famous industrial designer Raymond Loewy did not design the shape of the GG1 electric locomotives, he did improve their looks by recommending the use of a smooth, welded construction instead of riveted assembly, along with a pinstriped paint scheme to highlight their smoothly rounded forms; the "streamline" style, evoking speedy travel, was popular at the time. The real design behind the GG1 came from the New Haven Railroad EP3 electric. 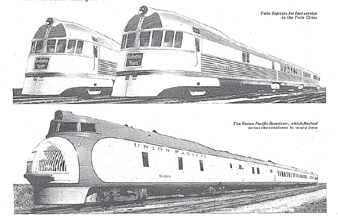 The New Haven allowed the PRR to borrow a pair of EP3s for testing, and the PRR was quite impressed with their performance and decided to base the design of its electric locomotive on the EP3. 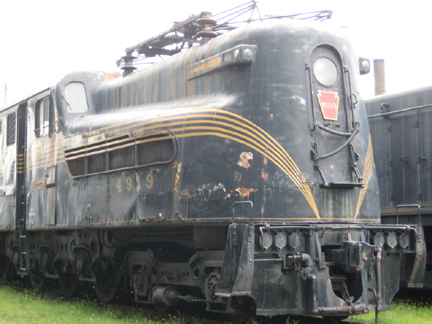 A yet-to-be-restored GG-1 may be seen at close range at the Virginia Museum of Transportation in Roanoke, Virginia. 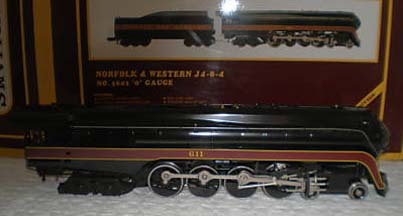 A GG-1 was involved in the very famous 1953 trainwreck at Washington DC's Union Station. 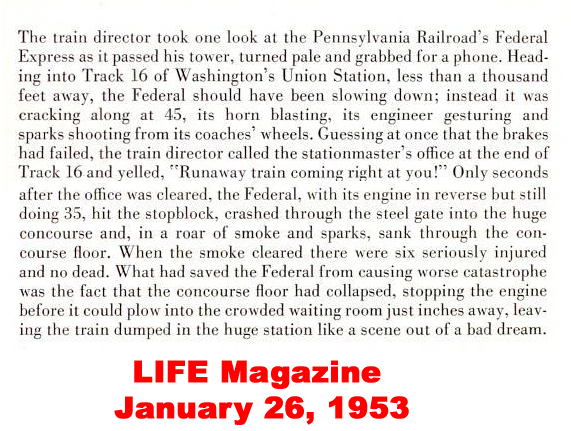 A Pennsylvania Railroad GG-1 hauling the Federal Express [sic] went completely out of control and crashed through the barrier at the end of the track, and then went through the floor of the station. There were surprisingly few injuries and no fatalities. The GG1 was restored and back in service within months. 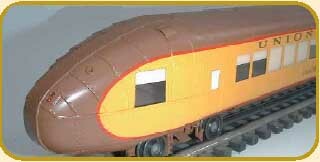 The "Boxcab" Units for Super Chief 1 - Great Colors! 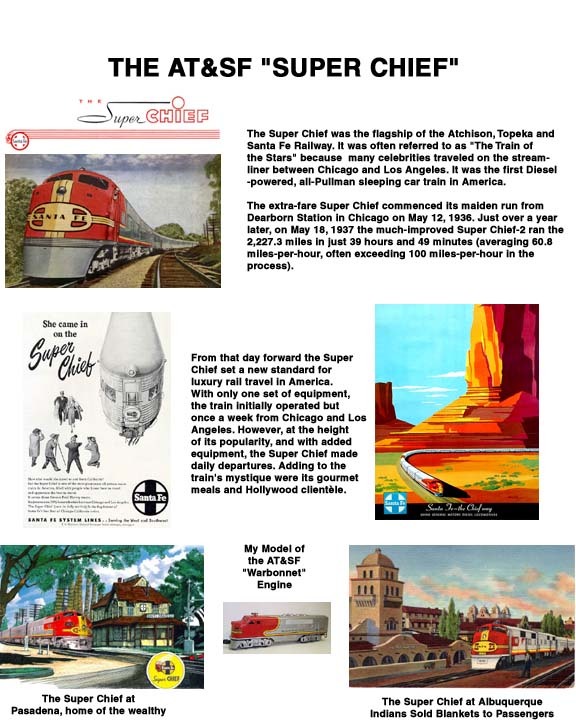 Below is a great article titled "Manicuring the Diesels" that has some great photographs of the Super Cief "Warbonnet" Engine. We have also included another article on the operation of high speed diesel locomotives. 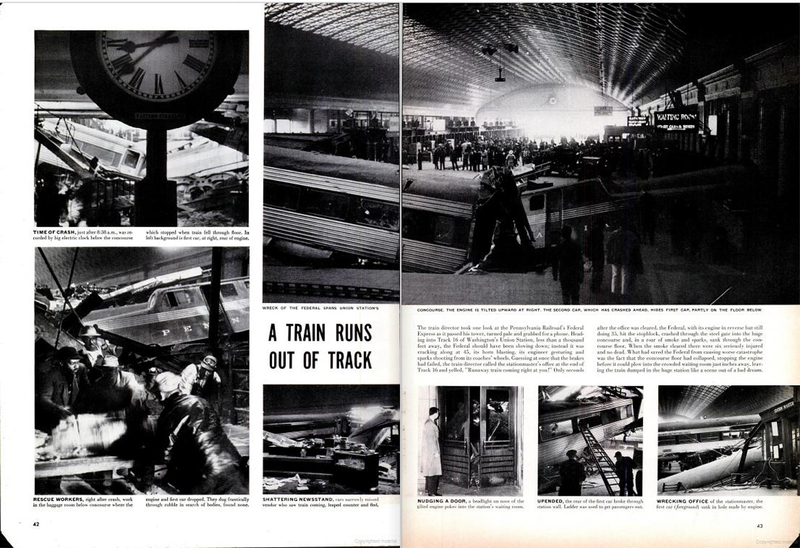 here is an article on the Twin Cities Rocket, the fastest train in the world (in 1951), as reported by Popular Science. Click here to download "Manicuring the Diesels"
Click here to download "Highballing the Rocket"
Before Amtrak operated a train with this name, the California Zephyr was operated by the Chicago, Burlington and Quincy Railroad from Chicago to Denver, Colorado, the Denver and Rio Grande Western Railroad between Denver and Salt Lake City, Utah, and the Western Pacific Railroad from Salt Lake City to Oakland, California. Originally, the train was hauled by a streamlined. 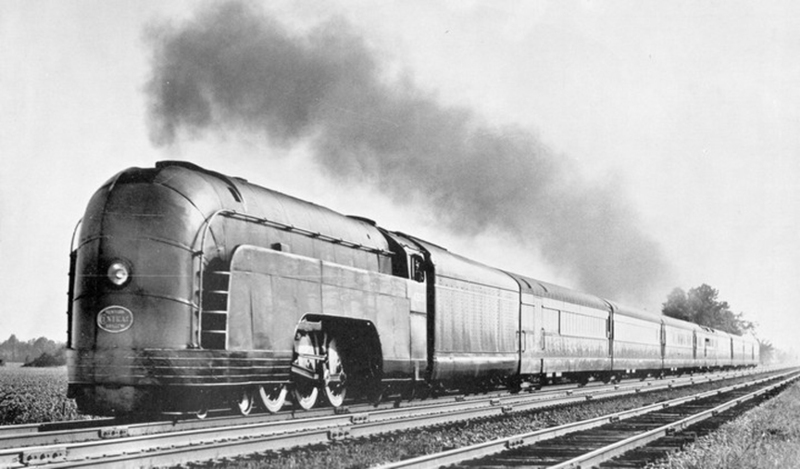 In 1937, the Chicago to Denver haul was taken over by a streamlined steam engine. 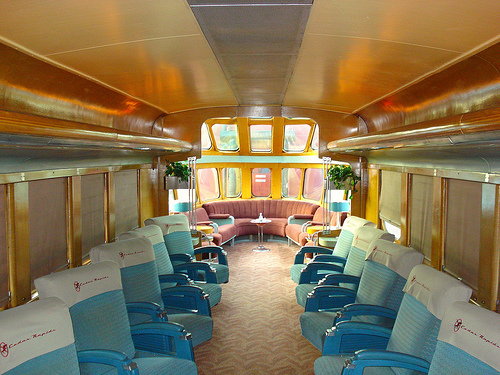 After World War II, the train was completely redesigned. 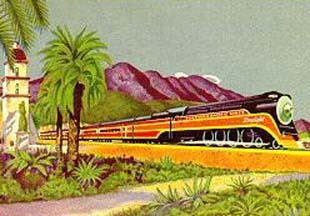 For the inaugural run in 1949, every female passenger on the train was given a corsage of "silver" and orange orchids that were specially flown in from Hilo, Hawaii. 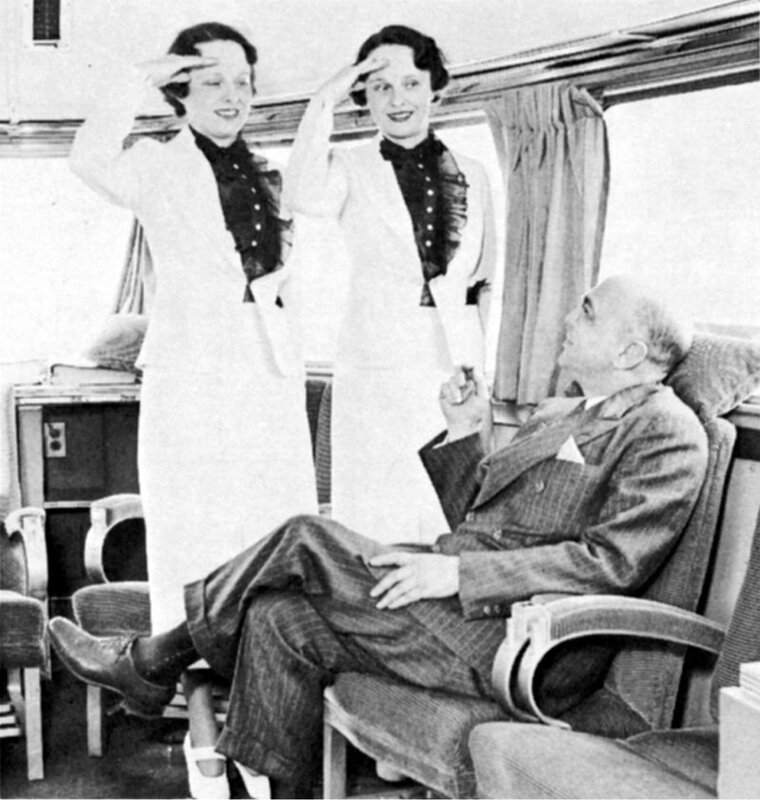 The women who worked as car hostesses on this train were known as "Zephyrettes." The train traversed the route's 2,525 miles (4,064 km) in 2� days. 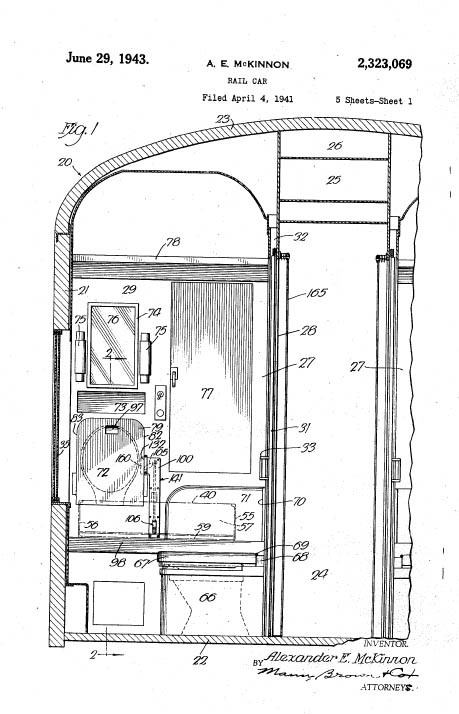 The forward section of the first Vista-Dome car was partitioned off and reserved for women and children only. There was a door in the corridor under the dome just behind the women's restroom that provided access to the reserved section. 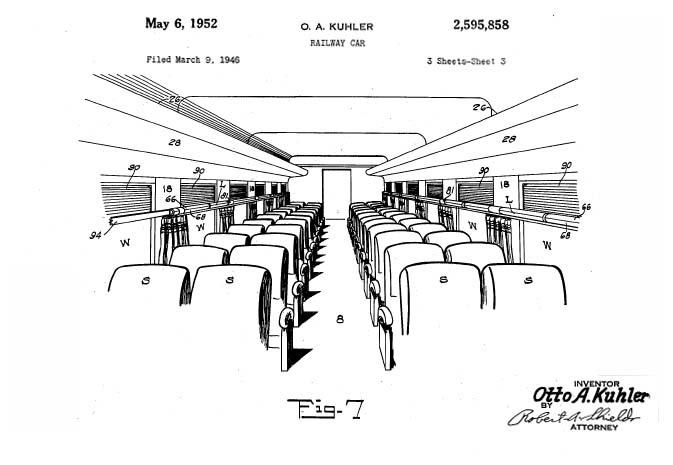 Early on however, this reserved section was opened up to all passengers and the door and partitions were removed. Like the train's operation, ownership of the cars was split between the three railroads almost evenly across all car types. 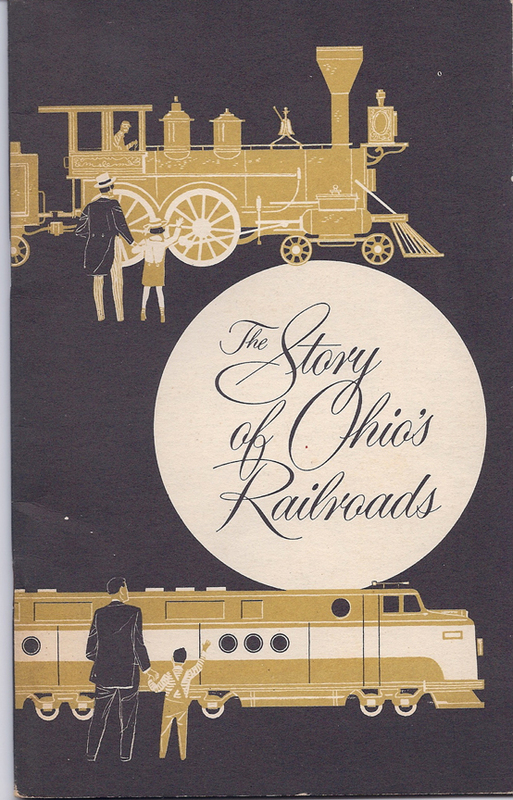 Each car was owned by a single railroad, but the ownership of the cars on any specific day's run of the train depended more on what equipment was available at the terminals than whose railroad the train was operating over at the time. 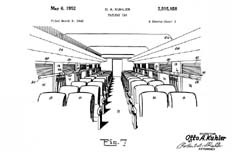 Generally positioned as the second Vista Dome coach was the car referred to as the "Conductor's Car". 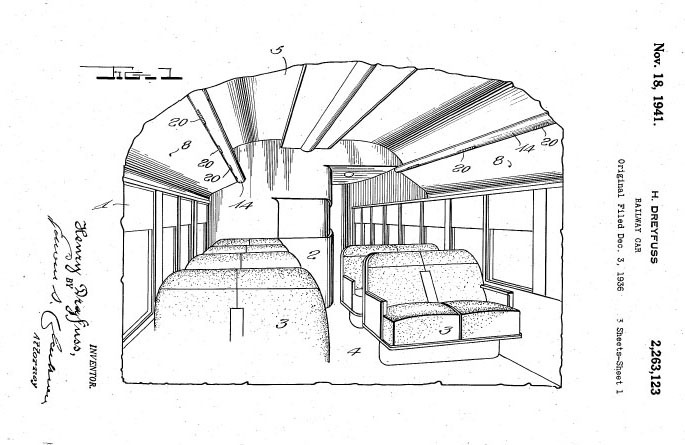 This car was like the other Vista Dome coaches, except in the B end, was a small booth with a bench seat and desk for the Conductor's use. 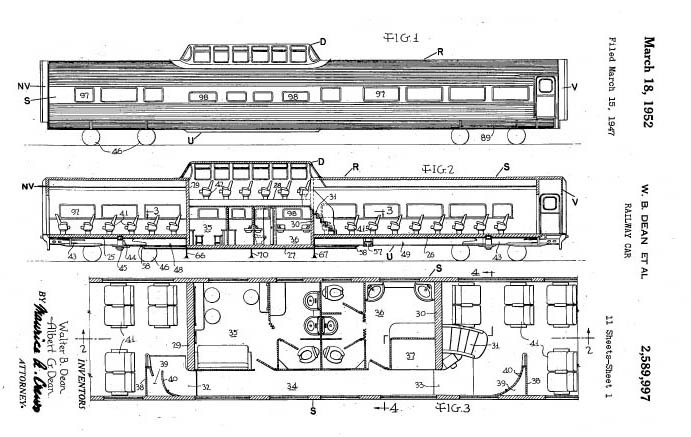 In 1952 an additional Pullman sleeper (6 double bedrooms - 5 compartments) was added to regular service on this train. 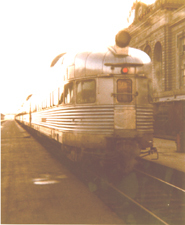 With the new cars delivered that year, cars arriving in Chicago on the California Zephyr were made available for use on the Ak-Sar-Ben Zephyr for an overnight round trip to Lincoln, Nebraska. When the cars returned from Lincoln the next day, they were placed back in the westbound California Zephyr's consist for the next train out of Chicago that afternoon. 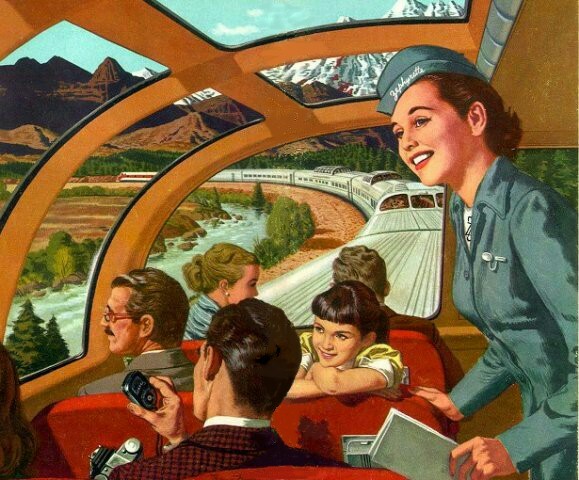 The California Zephyr was marketed (especially to families) as "...a vacation unto itself." 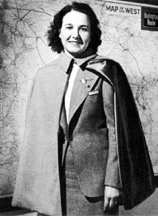 Train hostesses, while not new to the industry in the late 1940s, were nevertheless elevated to a new level on the CZ in the form of the "Zephyrette" who functioned as social directors, tour guides, babysitters, nurses� filling just about any role required to ensure that the passengers had a memorable trip. A pool of approximately twelve women was assigned at any given time to the CZ in this capacity. 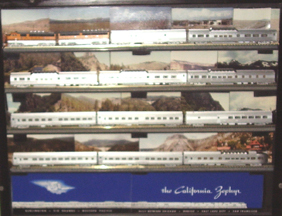 In 1983 Amtrak revived the California Zephyr and invited one of the original "Zephyrettes" to host the first trip. 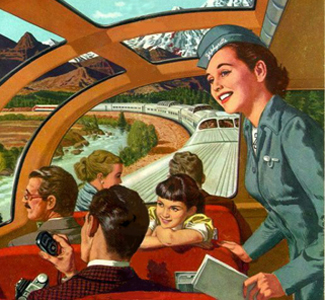 As ridership fell during the 1960s, the Western Pacific repeatedly petitioned the ICC to drop its section of the train west of Salt Lake City without success. On February 13, 1970, the ICC released an order stating that "operation of the train [on the Western Pacific] was no longer required". 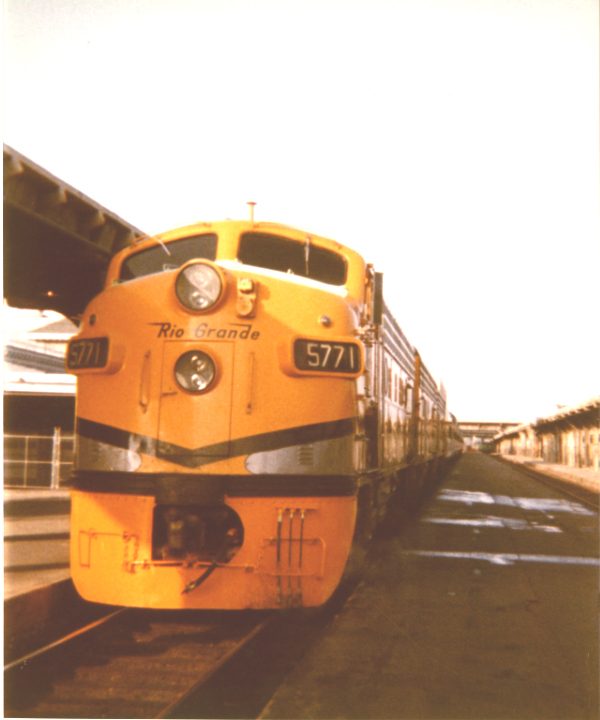 The train's final operation was made on March 22, 1970, with a westbound train terminating at Oakland, California. 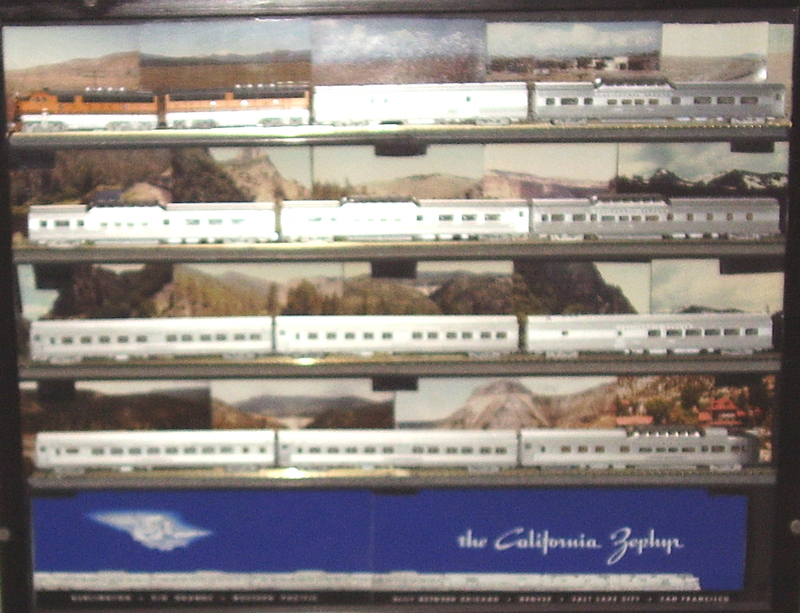 The California Zephyr had operated for 21 years and 2 days. 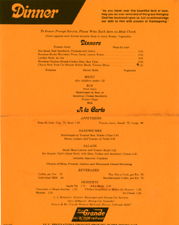 East of Salt Lake City, the train was reduced from a daily to a tri-weekly schedule, operating as California Service on the Burlington and as the Rio Grande Zephyr on the Rio Grande. 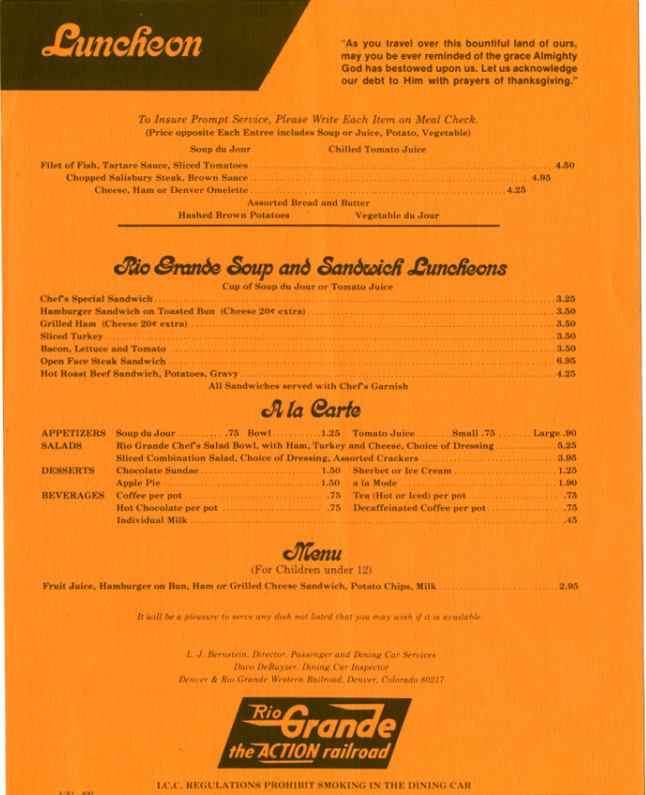 The Rio Grande portion of the train was extended beyond Salt Lake to Ogden, Utah, allowing Nevada and California passengers to connect to the Southern Pacific Railroad's City of San Francisco passenger train. 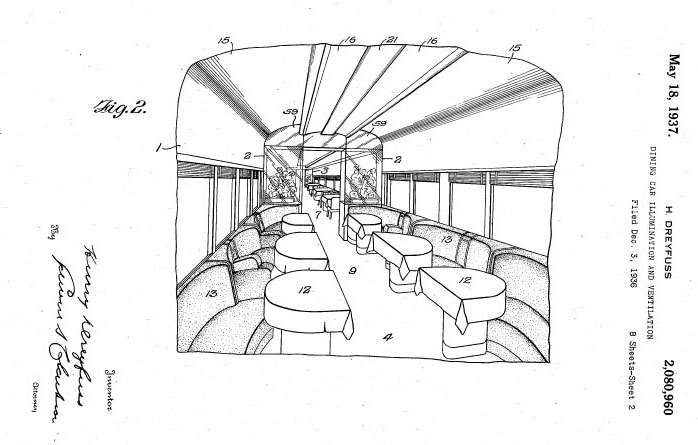 This arrangement existed until the creation of Amtrak on May 1, 1971. With the establishment of Amtrak in 1971, the new system began operating its San Francisco Zephyr over the Chicago, Burlington and Quincy route to Denver, and Union Pacific's "Overland Route" through Wyoming instead of Colorado, then over the Southern Pacific tracks west of Ogden, Utah. I have scanned the photos that I took in 1981 and made up a Special Slide Show to show the cars, staff, stations, and scenery from that trip. 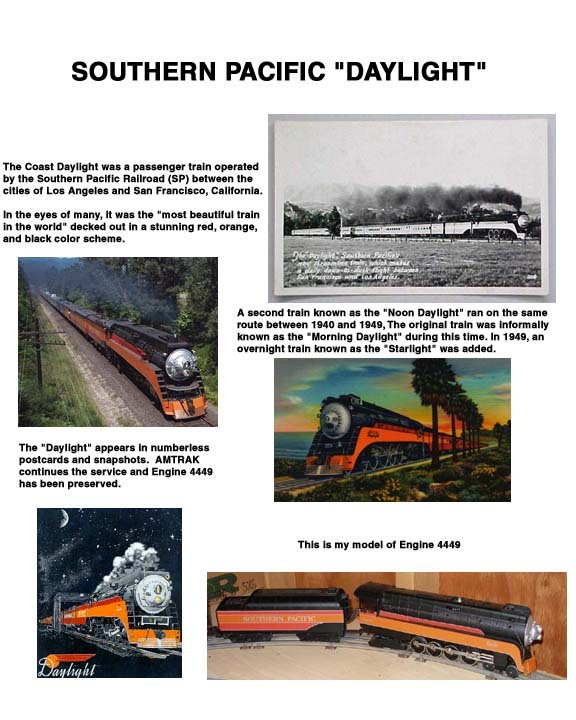 What is Railroad Standard Time? "Each engineer will be furnished with a watch which shall be regulated by the Station Agent at the commencement of each trip and must be deposited with him when the engine returns. If not returned in as good order as it was received, the Engineer must pay the expense of repairs." 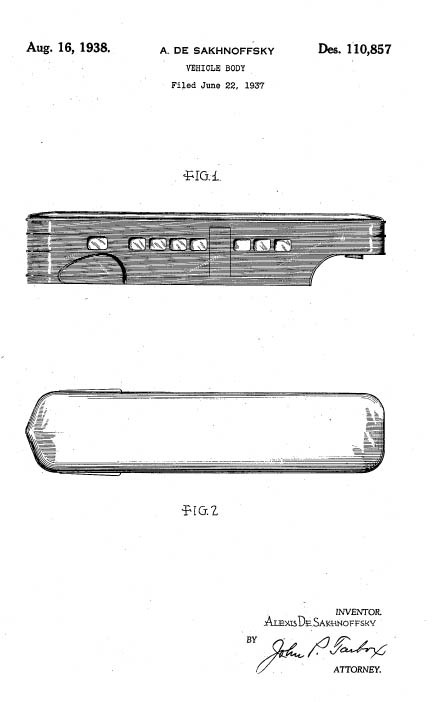 In 1887 the American Railway Association defined the basic standard for watches. 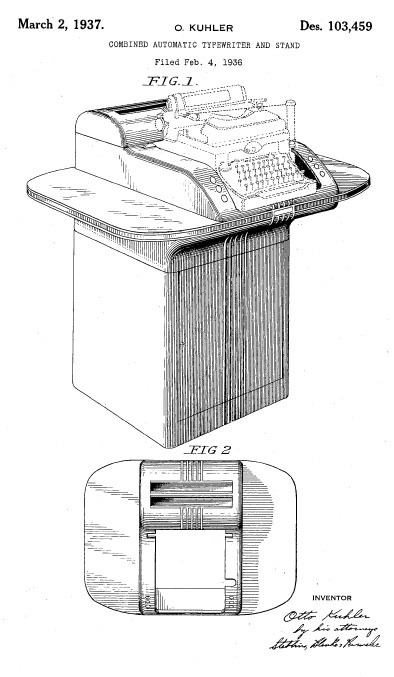 It took a disaster however, to create widespread acceptance of stringent accuracy and durability standards for the timepieces used to regulate the daily operation of American railroads. The biggest impetus was a horrific collision on the Lake Shore and Michigan Southern Railroad between a government fast mail train and an private charter train. The engineers and firemen of both engines and nine United States Postal Clerks lost their lives. The cause of the accident was that one of the engineers watches had stopped for 4 minutes. What is a Standard Railroad Watch? "An approved watch.."must be...open faced, size 16 or 18, have a minimum of 17 jewels, adjusted to at least five positions, keep time accurately to within 30 seconds a week, adjusted to temps of 34 �F (1 �C) to 100 �F (38 �C), have a double roller, steel escape wheel, lever set, regulator, winding stem at 12 o'clock, and have bold black Arabic numerals on a white dial, with black hands." Open-Faced: In order that the employee could read it at any time, the watch could not be inside a case . Size: Size 16-18 watches are about 2.5 inches in diameter, easy to hold in the palm. Steel Escape Wheel: as the spring unwinds, it applies force to a wheel with ratchets, causing a small wheel to advance one notch. The escapement has 30 notches, and two times around equals one minute. The escape wheel has the most friction and must be made of a hard material. Steel is preferred to brass. Lever Set The watch can only be set by unscrewing the crystal and turning a small lever. This prvents the watch from accidentaly reset by rubbing against clothing, etc. White Dial, Black Arabic Numerals, Black hands:All for maximum readability. 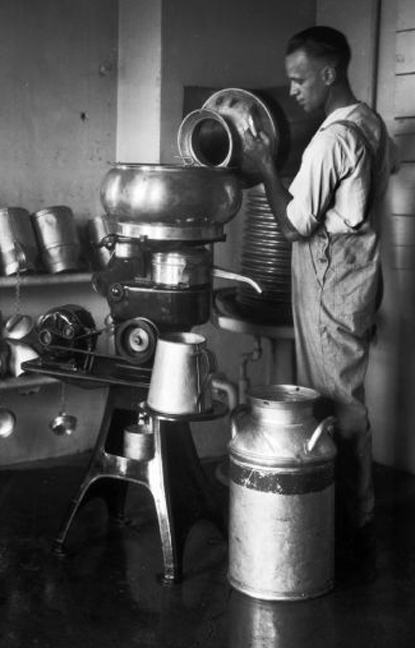 The standards were raised from time to time as watchmaking technology improved and the need arose. How Does Webb C. Ball Figure in All of This? 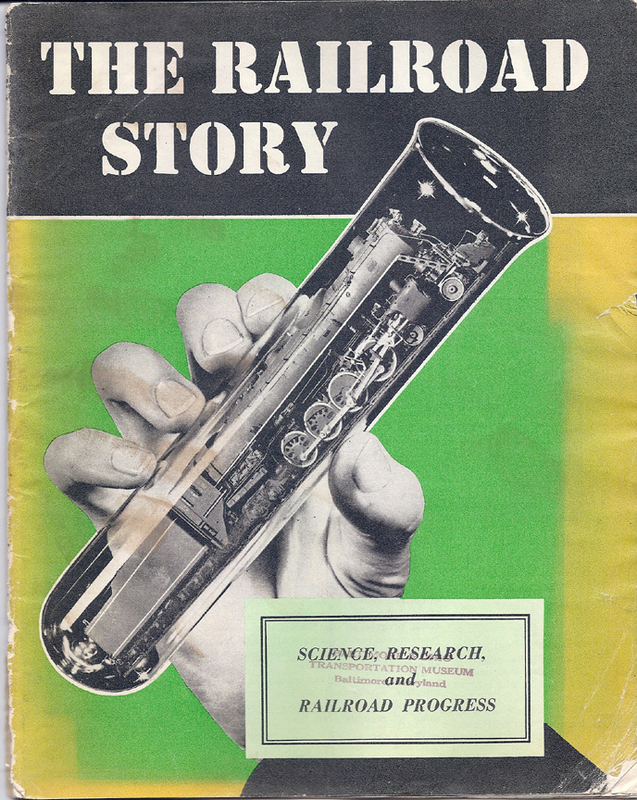 Mr. Ball has devoted practically his entire life to watch mechanisms and, specifically, adapting them to improve railroad service. 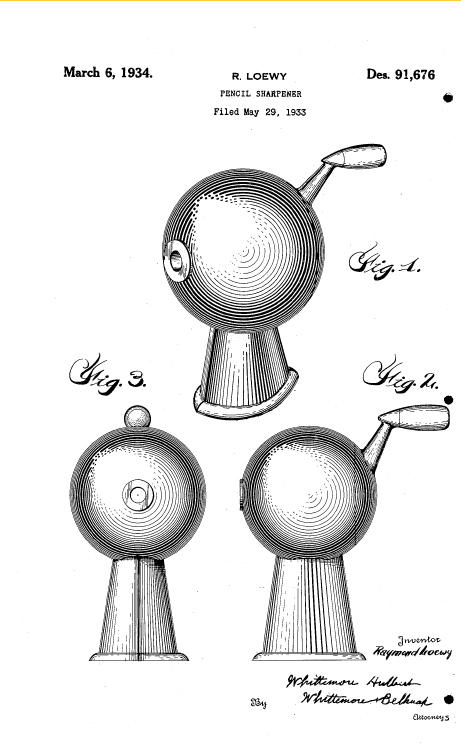 He a number of patents for both movements and the methods of manufacturing them. 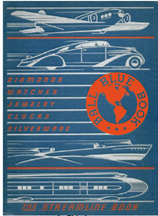 At the time the 1935 catalogue (above) was published, Mr. Ball had a thriving wholesale jewelry business located in Chicago with outlets all acroos the United States, Canada and Mexico. During the investigation of the Lake Shore and Michigan disaster, Mr. Ball gave expert testimony. After determining that the accident was caused by defective watches used by trainmen in the charter train. As a recognized expert on watch construction, Mr. Ball was authorized to prepare a plan of inspection and investigate conditions on the Lake Shore lines. 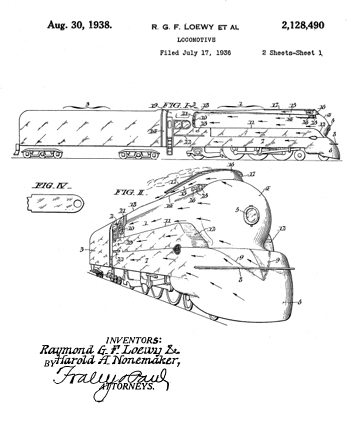 His research determined that no uniformity existed in trainmen's watches. In addition, the clocks in roundhouses and dispatcher's offices were seldom regulated to any uniform schedule. After this careful study, Mr. Ball evolved a plan of inspection and time comparison for the watches used by railway employees and for the standard clocks as well. 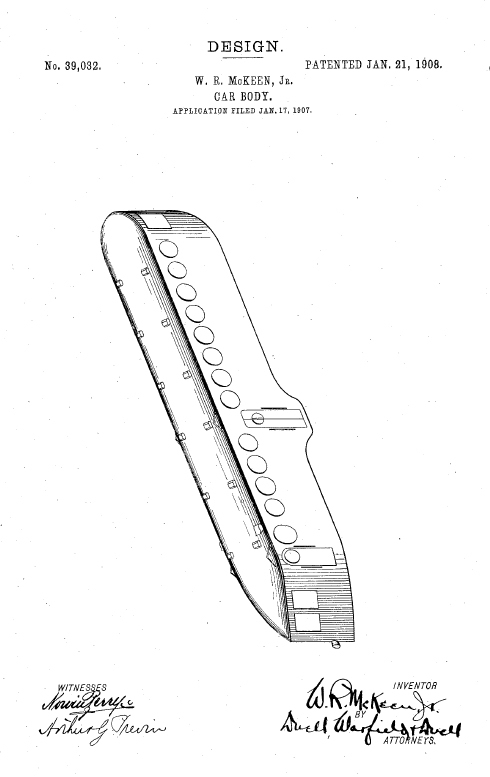 This plan provided strict standards for watches of standard grades to be carried by men in charge of trains. Timepieces could come from any manufacturer so long as standards were met. Eventually, seven companies were able to make watches that would be accepted under the uniform standard inspection rule. Mr. Ball established first watch inspection service on the Lake Shore and Michigan Southern Railway in 1891, and eventually the service was extended to the New York Central, the Illinois Central, the Rock Island and Frisco systems, the Union Pacific, Southern Pacific Oregon Short Line, the Nashville, Chattanooga and St. Louis, Missouri, Kansas City and Texas, El Paso and Southwestern, Sun Set Central lines, Western Pacific Railway, Lehigh Valley Railway, Boston and Albany, New York, New Haven and Hartford Railroad. 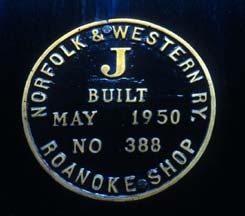 Seventy-five per cent of the railroads throughout the country employ the Railroad Time Service, Mr. Ball's company formed to implement his standards. By the 1920s the name "Ball" was a synonym for accuracy in construction of railroad watches throughout the entire country. 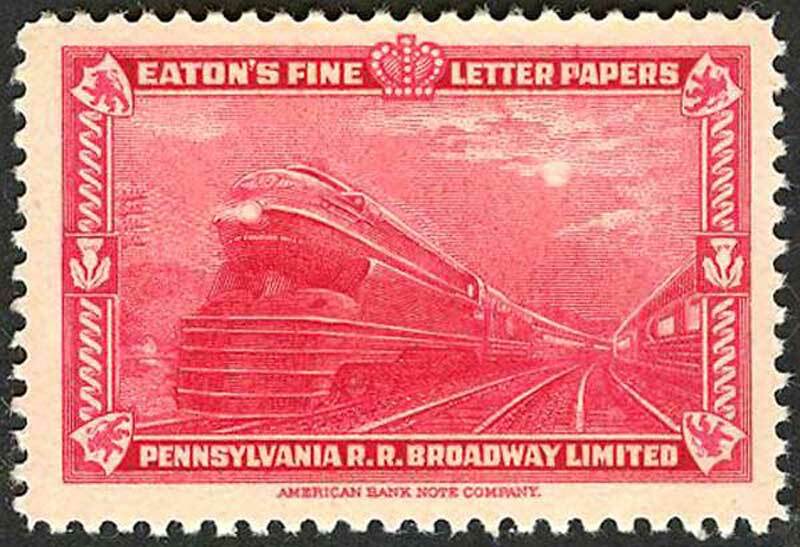 Mr. Ball was known as "the man who holds a watch on one hundred seventy-five thousand miles of railroad"
On August 26, 1999: The United States Postal Service issued 33-cent All Aboard! 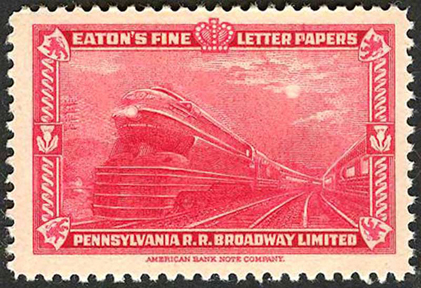 20th Century American Trains commemorative stamps featuring five celebrated American passenger trains from the 1930s and 1940s. 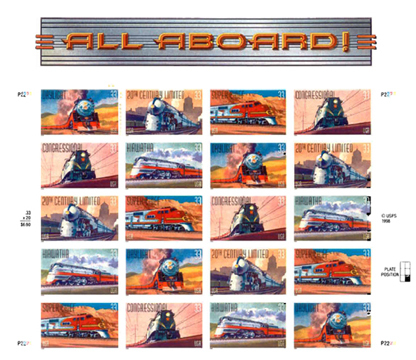 I am thrilled to have models of the five locomotives pictured on the stamps. 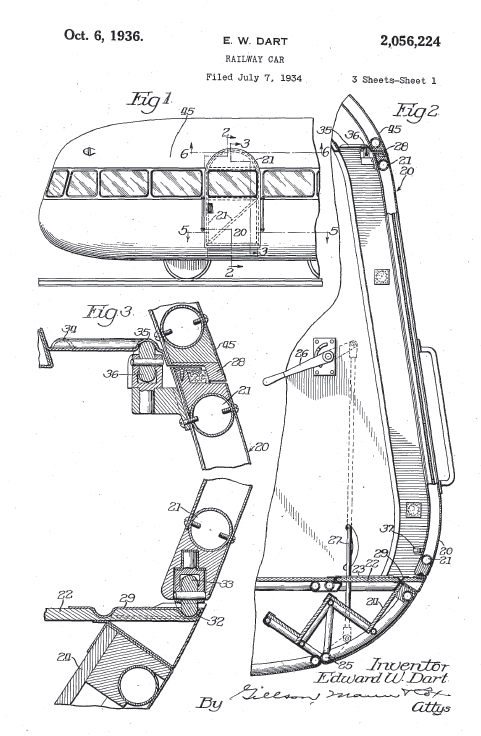 The "A-Train" - not Streamlined but Swinging! 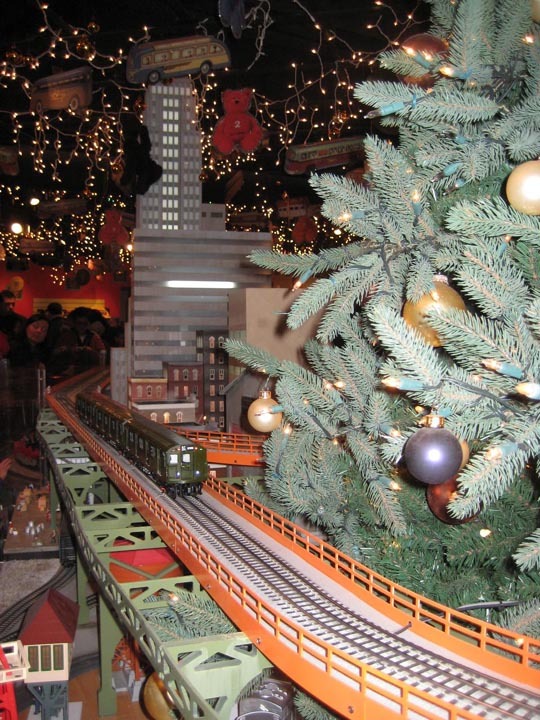 The New York Metropolitan Transit Authority (MTA) puts up a Holiday model train display in Grand Central terminal. 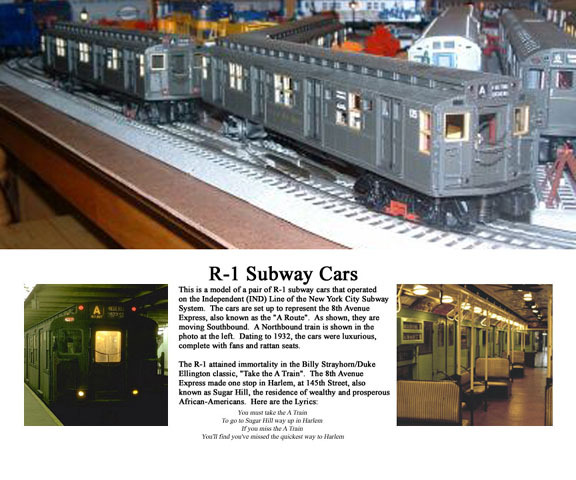 This year, I was thrilled to see R-1 Subway cars in the display that are of the same Lionel vintage as my own. The kids loved the display as much as the adults. 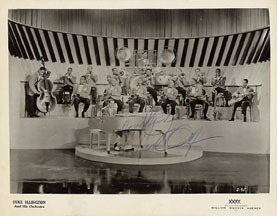 Take the A-Train was the theme song for Duke Ellington's Band from 1940 onward (here is a video based on an old Soundie.) 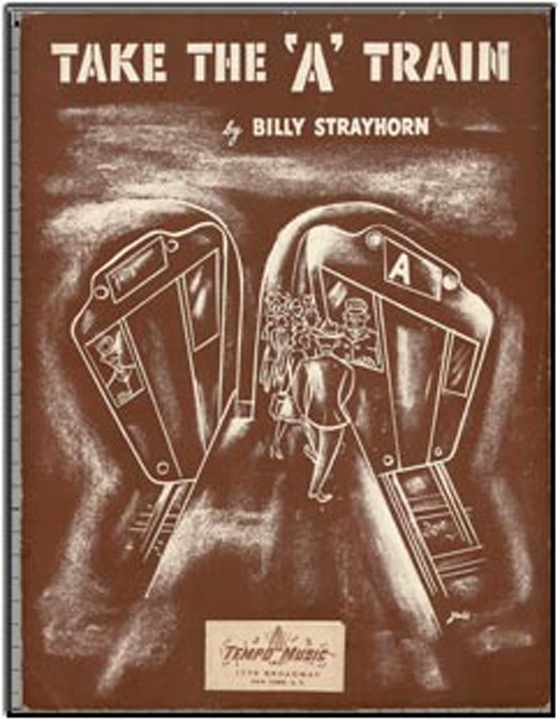 The song was written by the legendary Billy Strayhorn and almost discarded until the Duke himself saved it. 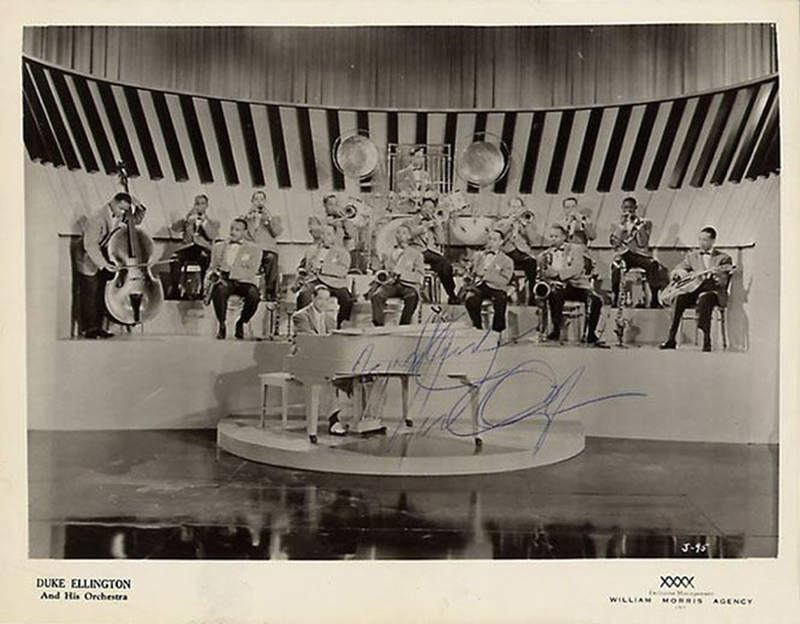 The song had no lyrics until 1944 until Joya Sherrill, a teenager from Detroit, badgered Ellington for an audition. For my money, the best recording of the song with lyrics is by the Delta Rhythm Boys which (thanks to the miracle of YouTube) can be heard here. On December 28, 2008, I had the privilege of riding in a train made up of original R-1 cars, including Number 100, the very first of this genre to enter service. 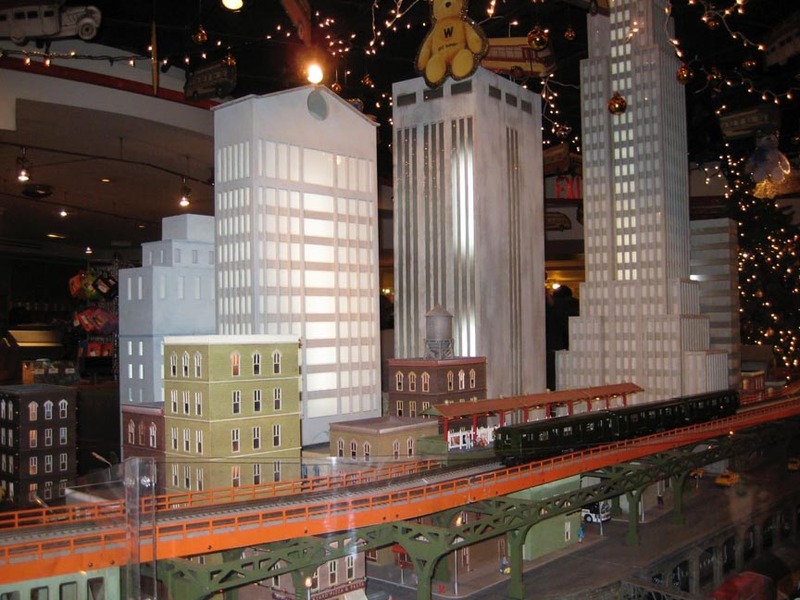 This "nostalgia train" could not be used to replace the real "A Train" (The 8th Avenue Express), so it was run on the lesser used "V" line between 2nd Avenue and Queens Plaza. 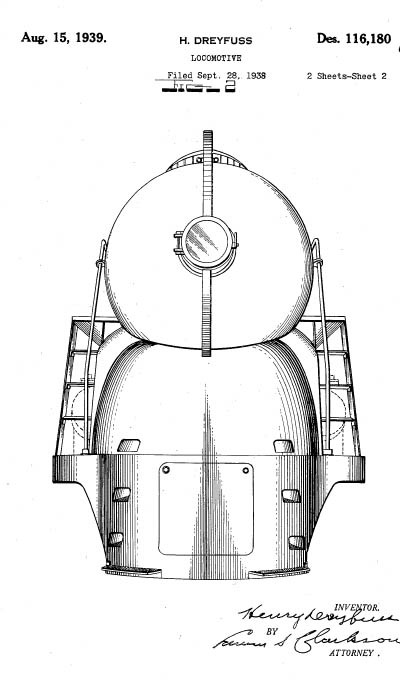 You will note that its Head Sign bears the letter "S" for "Special Train". These cars have been thoroughly restored by the MTA down to the original advertising cards. The train was operated by volunteer MTA employees who gave their Sunday so that folks could experience the Subway as their parents and grandparents did. ..and while we are still in the New York Subway System, we really have to mention "Miss Subways." 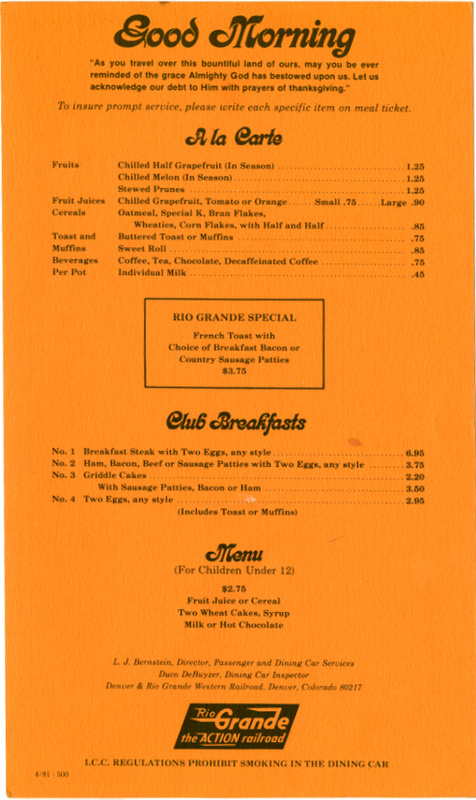 Ellen Hart was "Miss Subway" in 1959 -- she owns a place called Ellen's Stardust Diner on Broadway that is the only place near Times Square to get a good meal at reasonable prices. In addition, the waitstaff are singers looking to break into The Theater and they entertain constantly with songs that are done much better than in some of the plays. 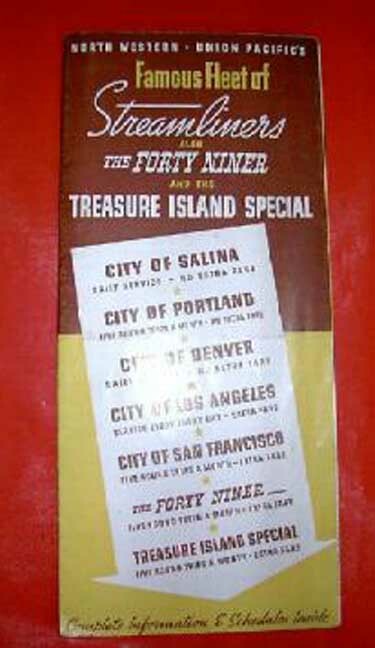 She also has a gigantic collection of "Miss Subways" advertising cards. If you ever wondered whether women have improved their lot, look at the slide show in the gallery for a few minutes. 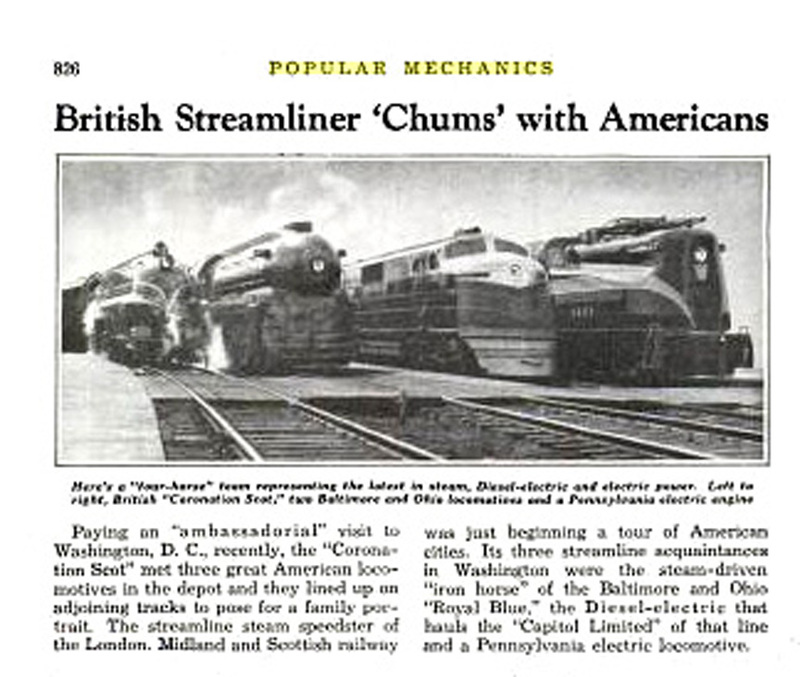 We don't want to give the impression that streamlining was limited to the United States -- it was very much alive in the United Kingdom, Europe and the rest of the World. Over there,the principal "Gee Whiz" future-tech magazine was known as Modern Wonder. 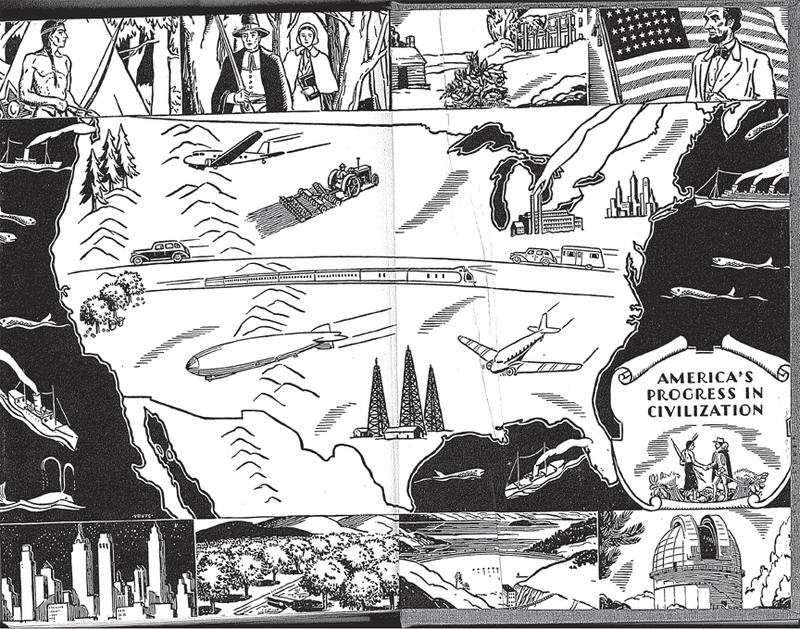 Here's an informative little video that shows all the covers from Modern Wonder during the 1930s. You can get the idea -- lots of high-testosterone Technology helping Man (and Boy) conquer Nature. 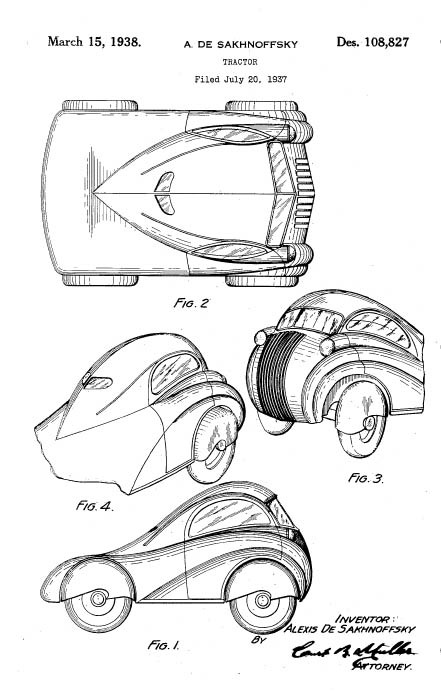 Count Alexis de Sakhnoffsky (1901-1964) was a Russian-American industrial designer, known principally for his Streamline-style automotive designs. Born in Moscow in 1901, Sakhnoffsky emigrated to Switzerland in 1919 and by the 1920s had become a well-known designer of European sports cars. 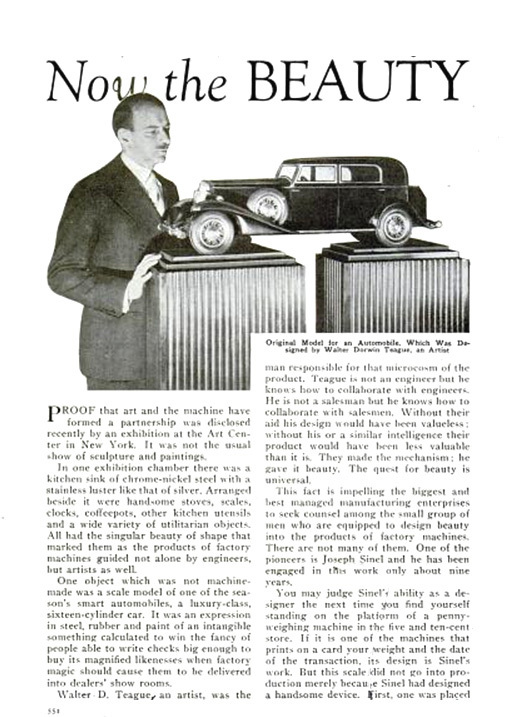 He relocated to North America in the late 1920s and designed vehicles for Auburn Automobile, the White Motor Company, and others. Lakehurst, New Jersey was a major stop for dirigible passengers (The Graf Zeppelin and the ill-fated Hindenburg) as well as the sailors who operated the military "Air Ships" such as the Shenandoah, Macon and Akron, all designed by Ralph Upson. 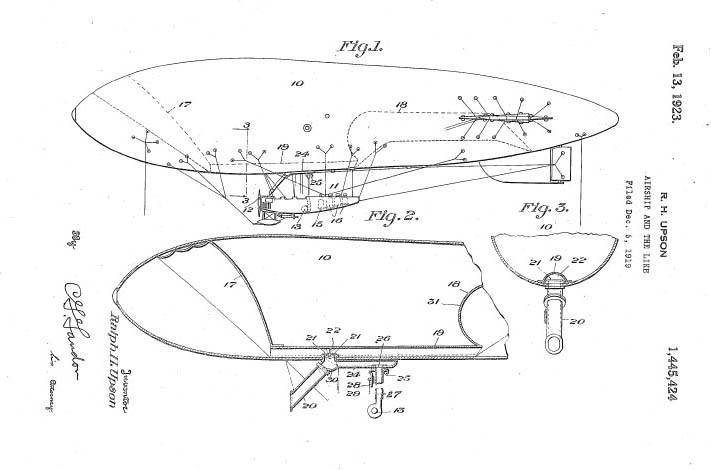 Later, the Navy used nonrigid airships for patrols. 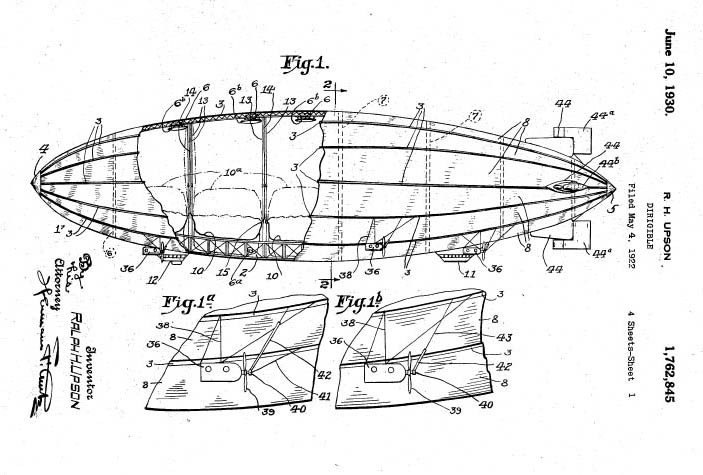 Today, the Goodyear Blimp is the direct descendant of these early craft. 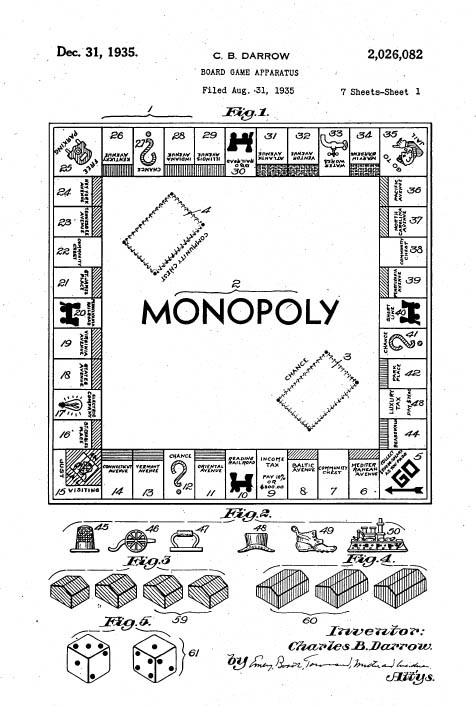 The Board Game Monopoly was based on the fervor of land speculation in Atlantic City during the period that the Blue Comet ran. It was invented by Charles Darrow in 1934 and is the largest selling board game in history. 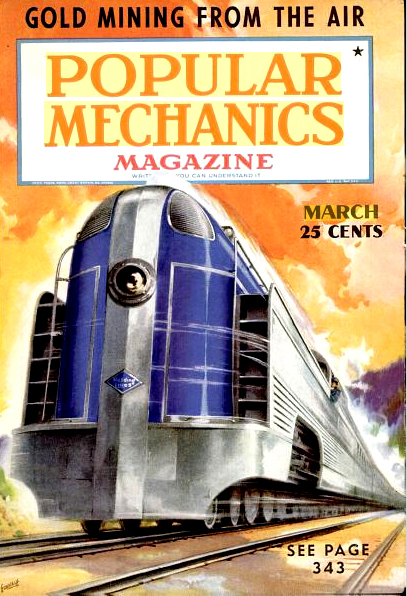 Our review of Popular Mechanics from 1932-1939 also turned up a large number of pictures and stories about streamlined trains all around the world as well as photos of "non-train" streamlining such as cars, boats and buildings.